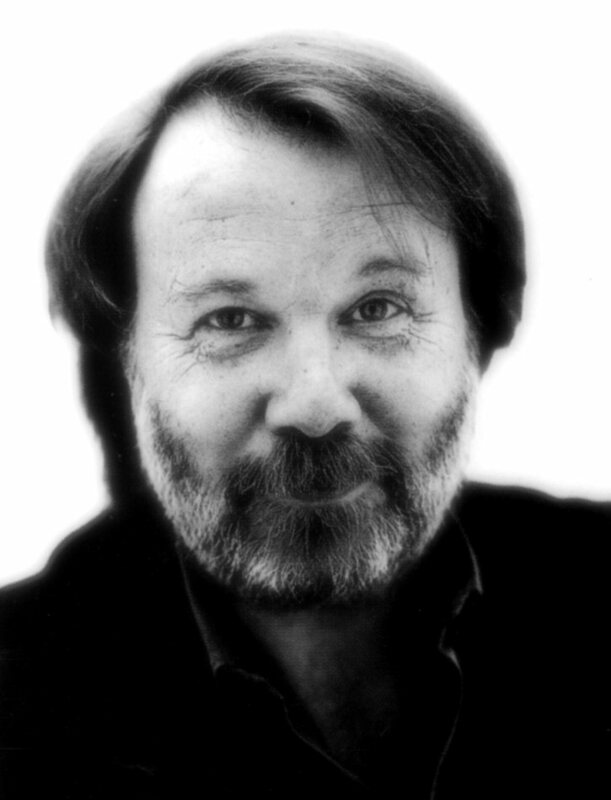 Benny Andersson was born on December 16, 1946 in Stockholm. 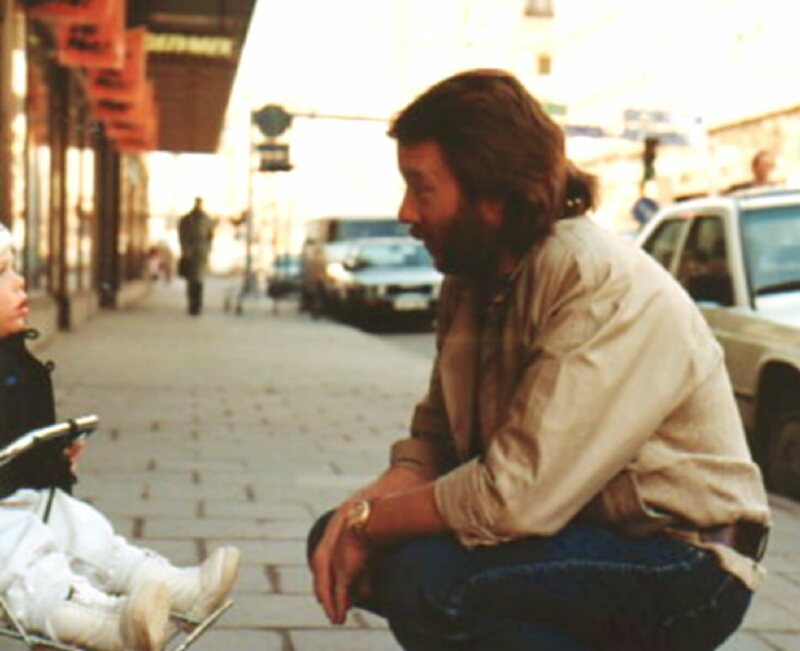 He grew up in the suburb of Stockholm - Vällingby (go.to/ABBA related). 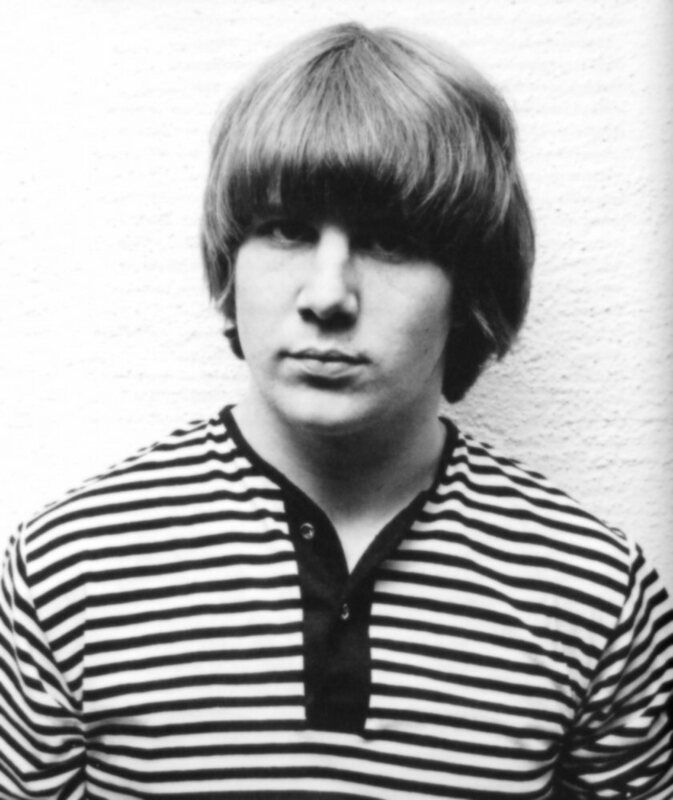 He left the school life at fifteen without taking any of examinations and devoted all his time to music. 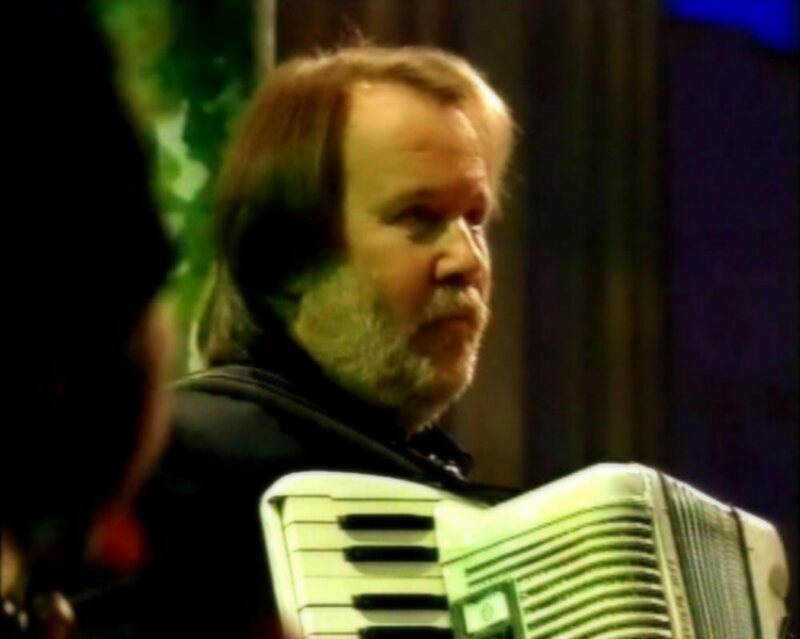 He played accordion and piano. 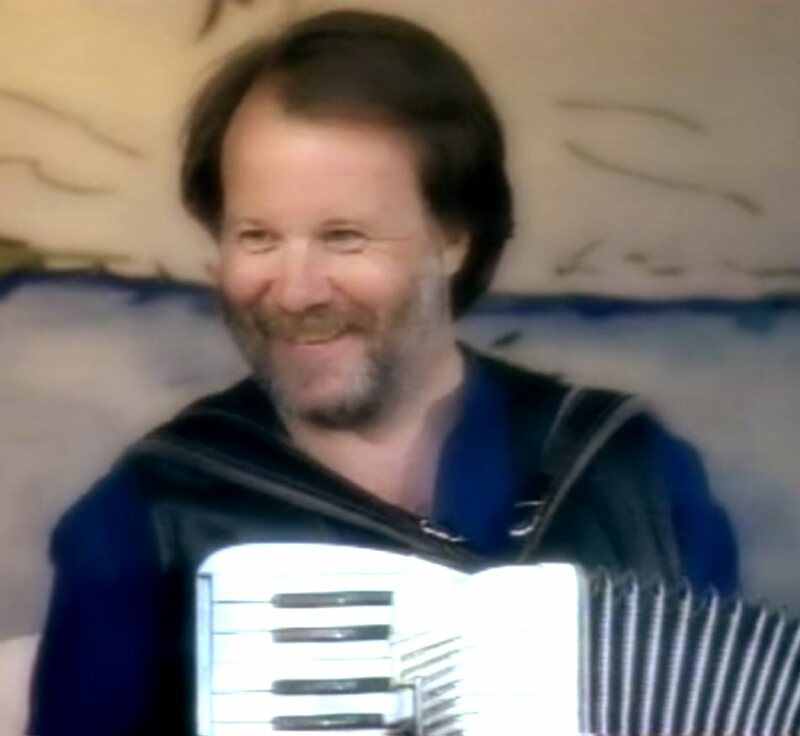 Benny says: "My grandfather and father tried any musical instrument that they could find, whether it was the piano-accordion they gave me, or a flute, or a fiddle. I guess I just inherited whatever they had. 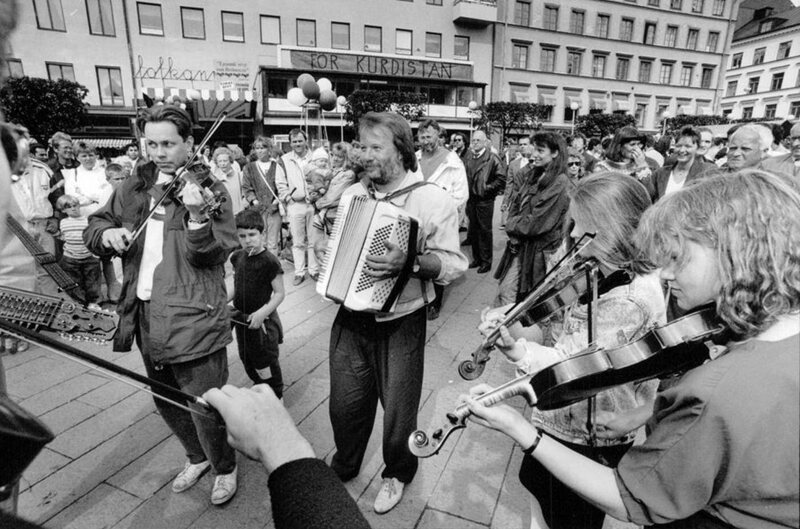 They loved folk music. 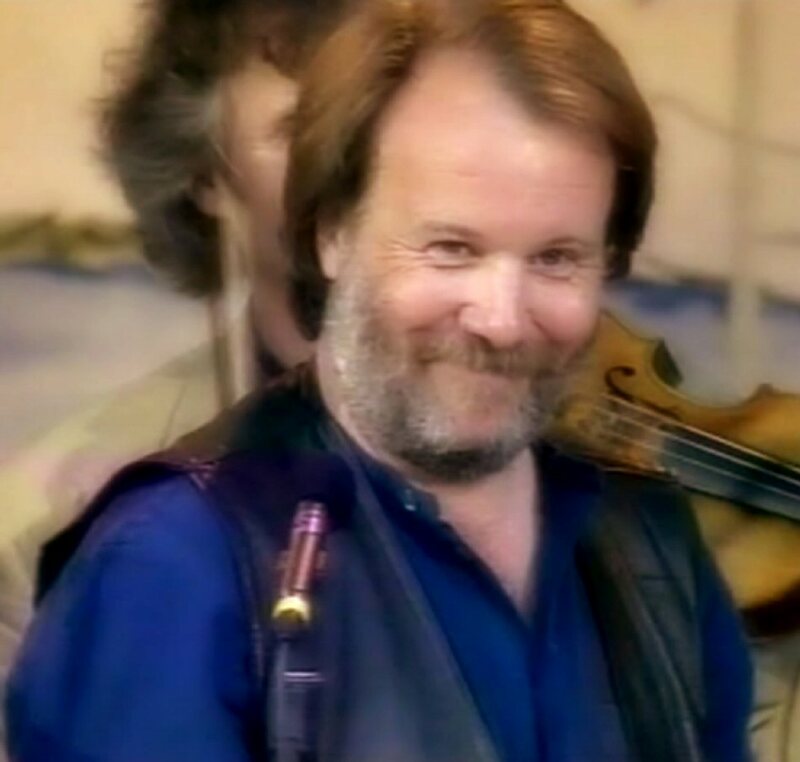 I learned a lot of the old tunes from them and my early playing had a definite folk flavor about it." 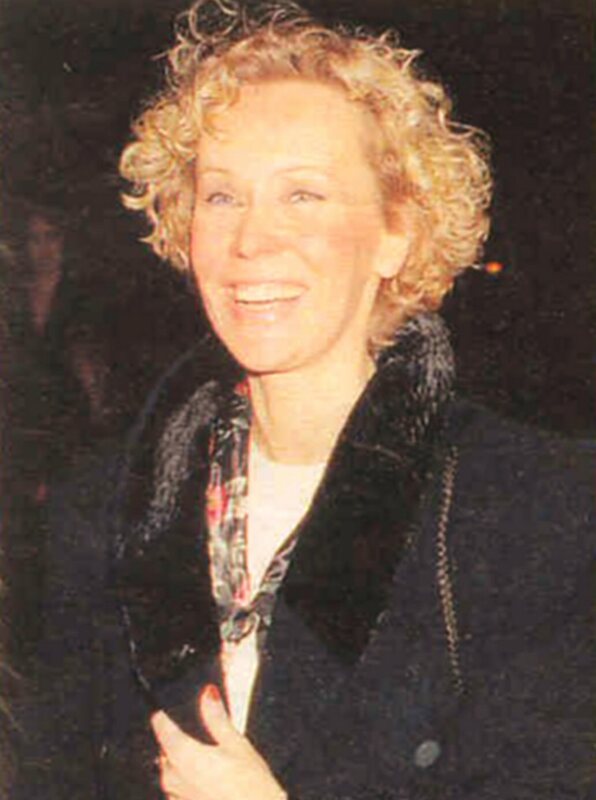 During his teenage years, Benny started to perform at youth clubs together with a singer Christina Grönvall. 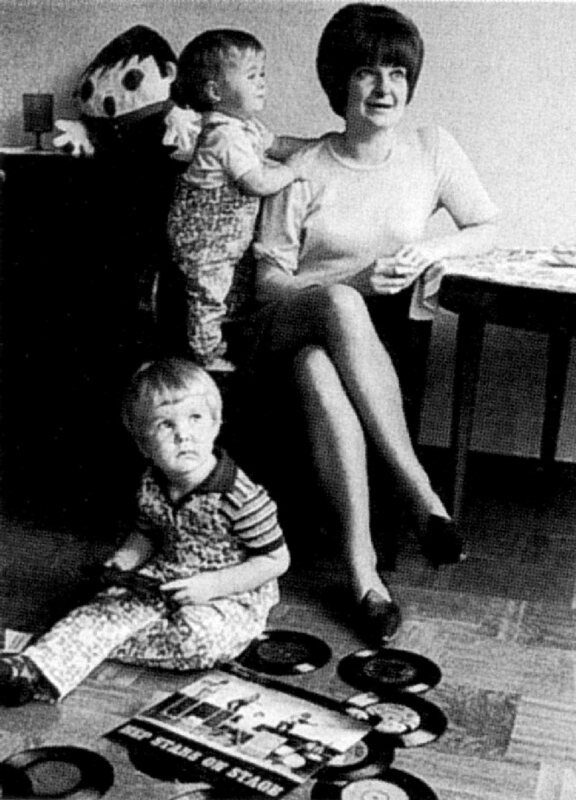 She became mother to Benny's two children Peter born on August 20, 1963 and Helene on June 25, 1965. 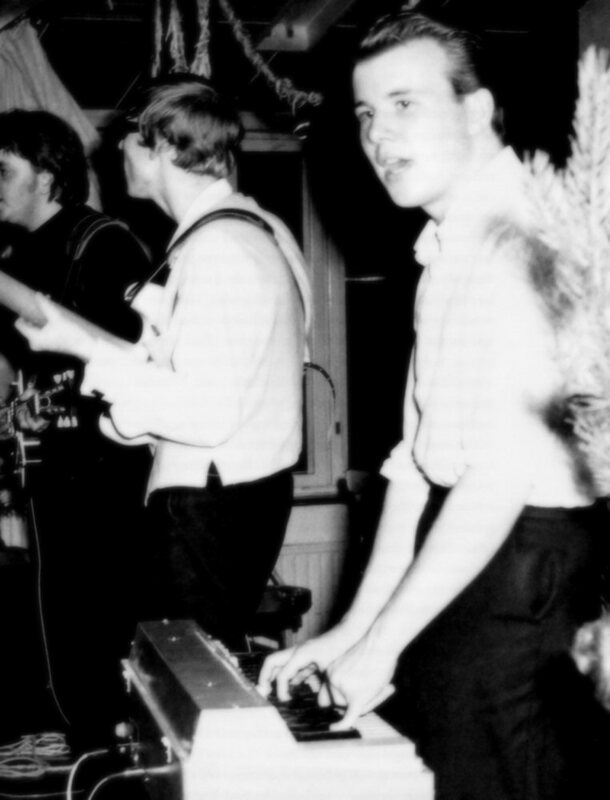 Benny played in the group Elverkets Spelmanslag. 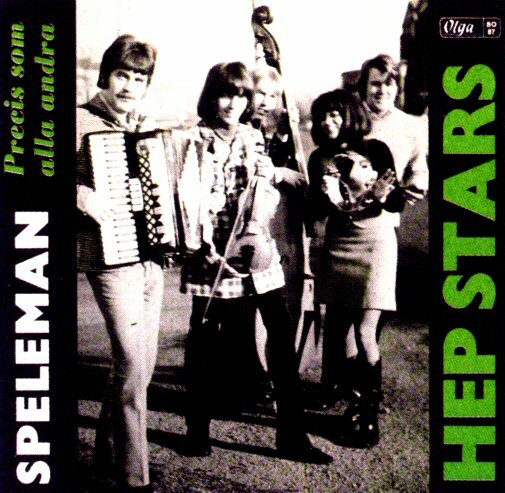 One evening the group was watched by Svenne Hedlund, lead singer in one of the biggest rock acts in Sweden in the 60s - Hep Stars. 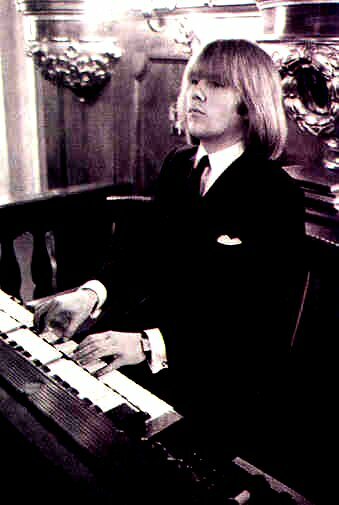 Svenne was impressed by Benny and several weeks later when Hep Stars' organist left the group it was natural to call Benny and ask for help. 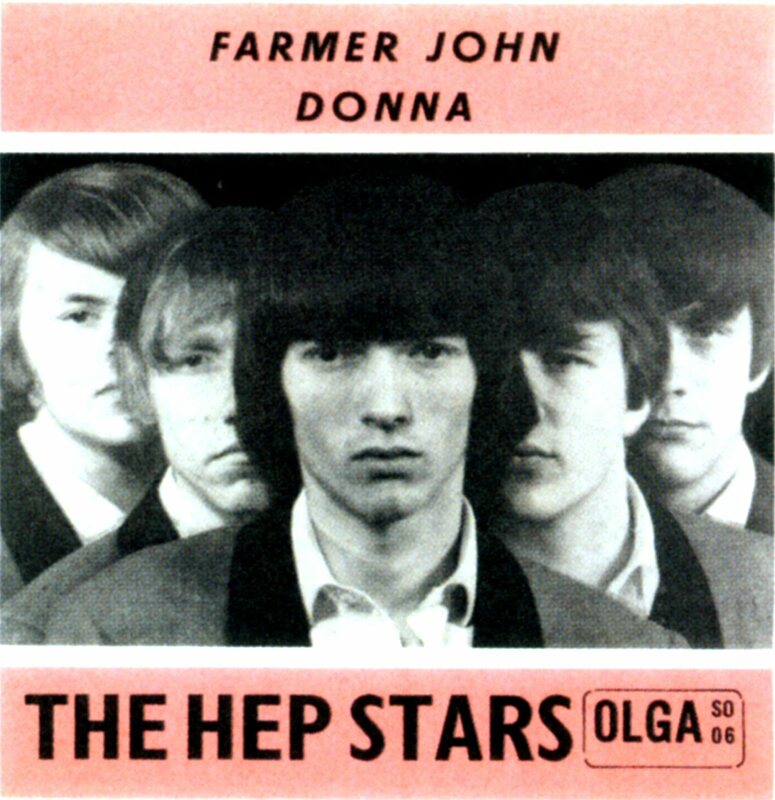 Benny joined Hep Stars in October 1964. 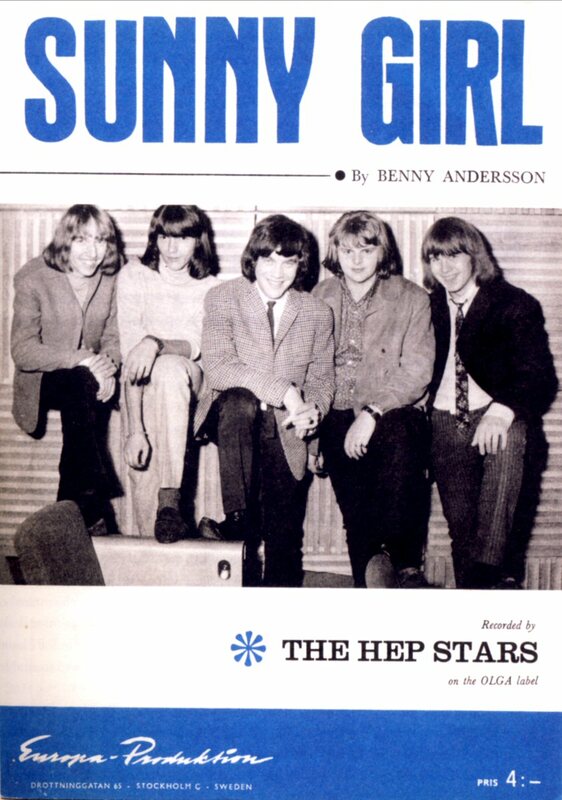 In 1965 Benny wrote some songs for the group which became quite big hits on the Swedish charts: "No response", "Wedding" and "Sunny Girl". The last one became even hit in Holland. 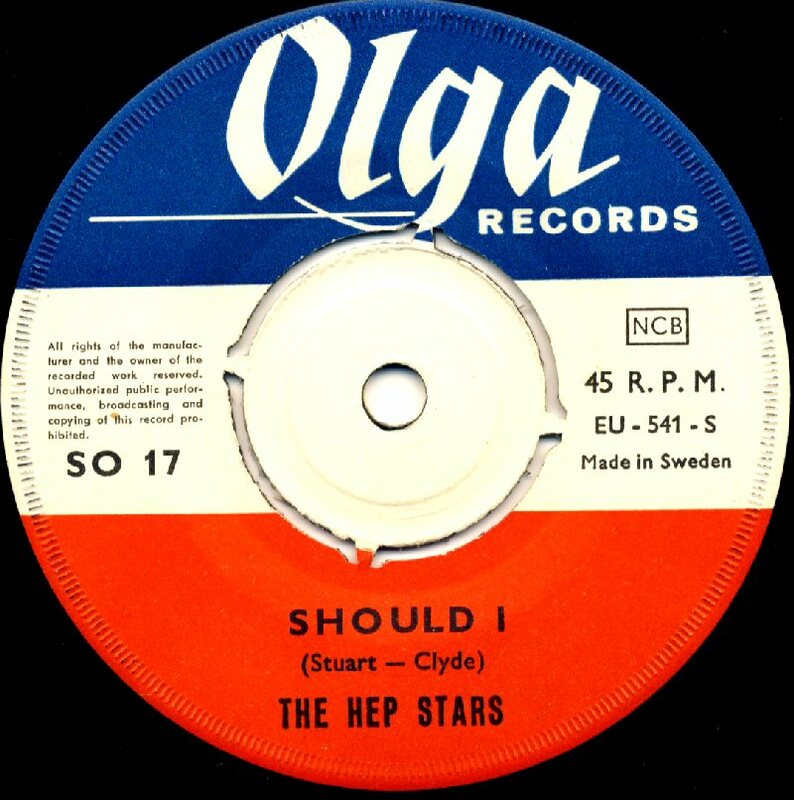 Hep Stars became bigger and bigger in Sweden. 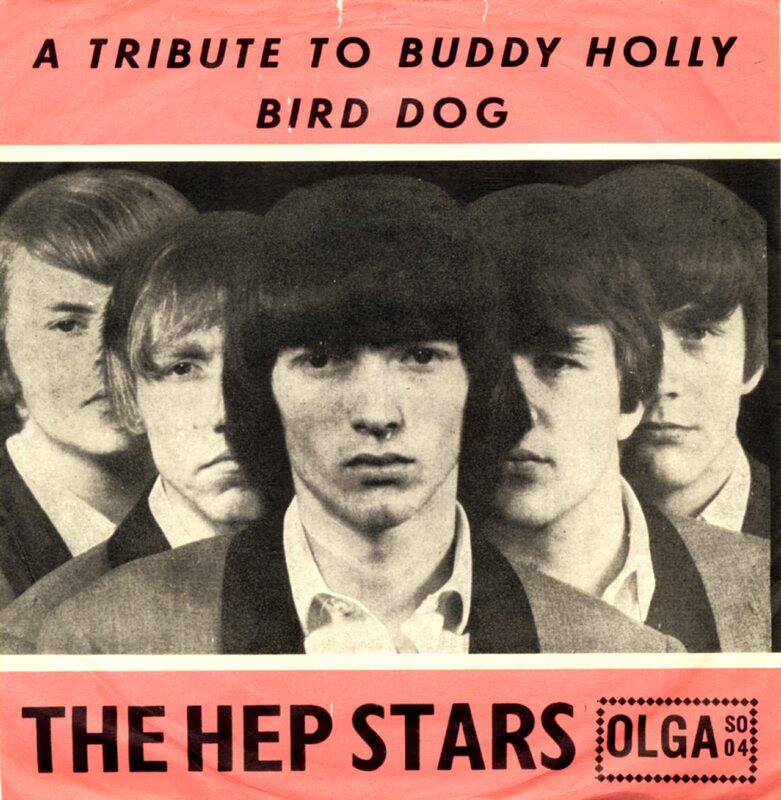 The single featuring "A tribute to Buddy Holly" b/w "Bird dog" saw its release in Sweden in February 1965. 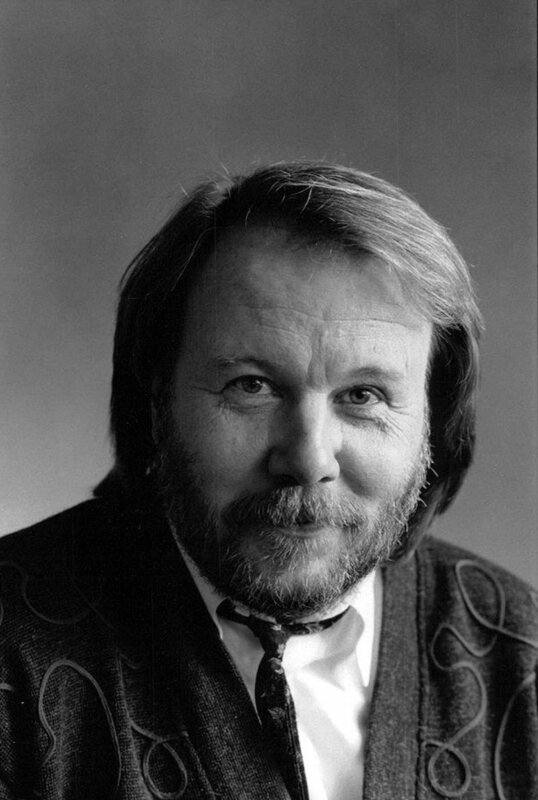 It was the first single recorded with Benny Andersson. 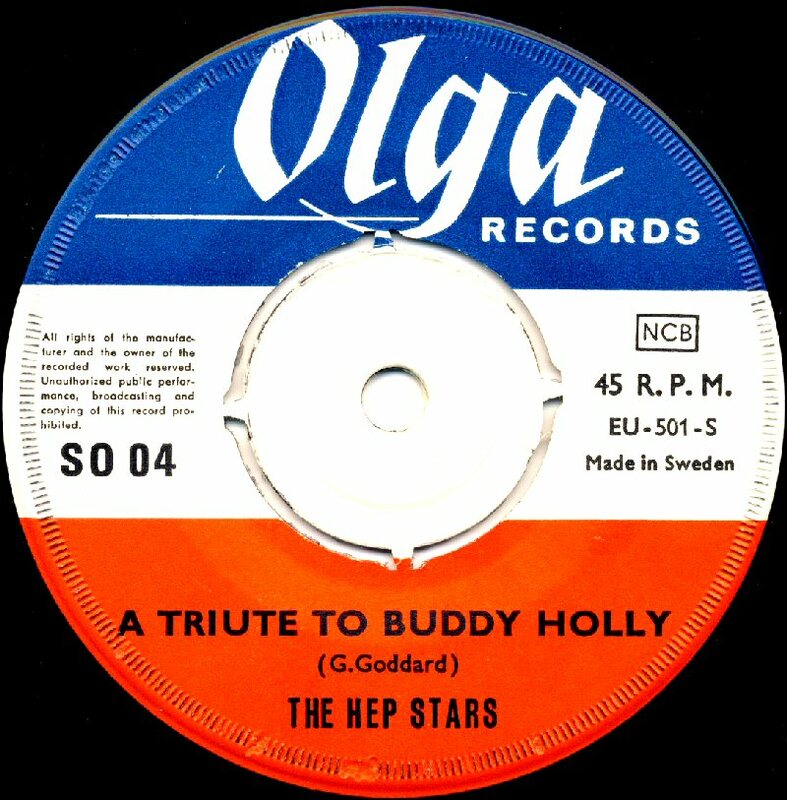 "A tribute to Buddy Holly" entered the Swedish chart "Tio i Topp" on March 27th, 1965 where it stayed for 11 weeks peaking at #4. 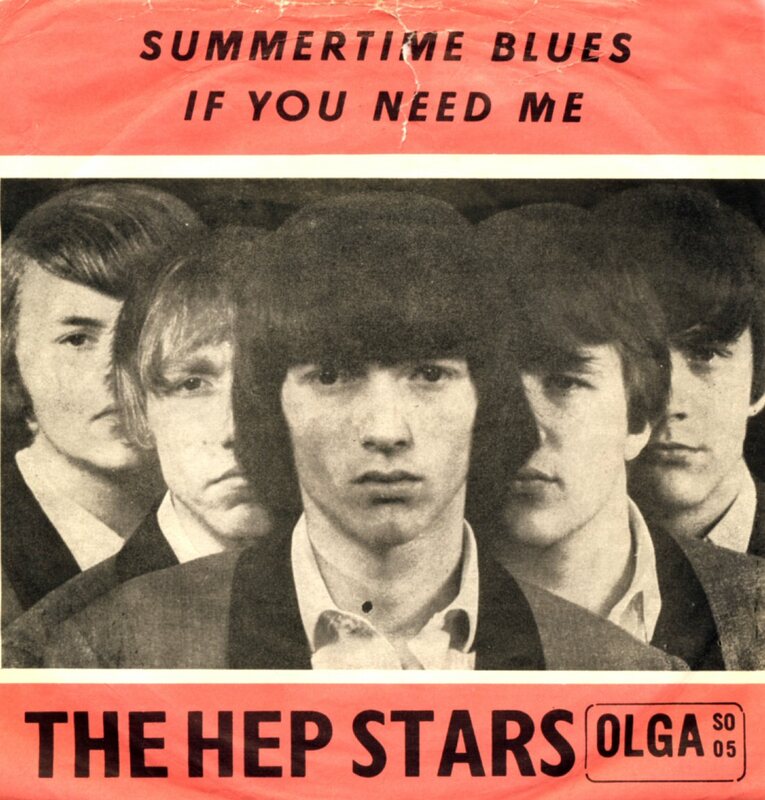 The second single released by Hep Stars with Benny was "Summertime Blues" b/w "If You Need Me". 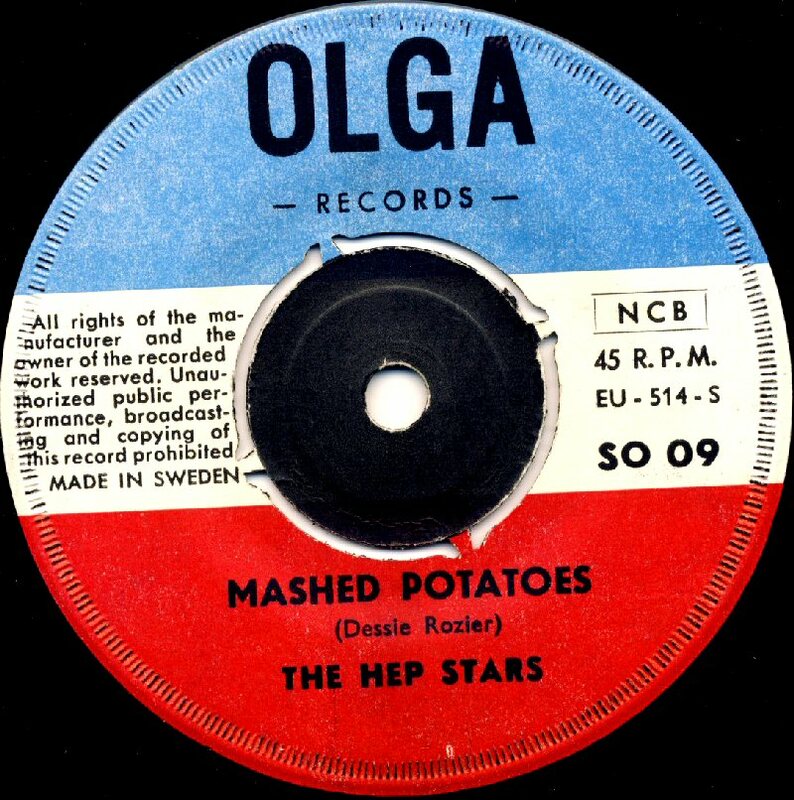 The single was released in March 1965 but it was not successful on Swedish charts. 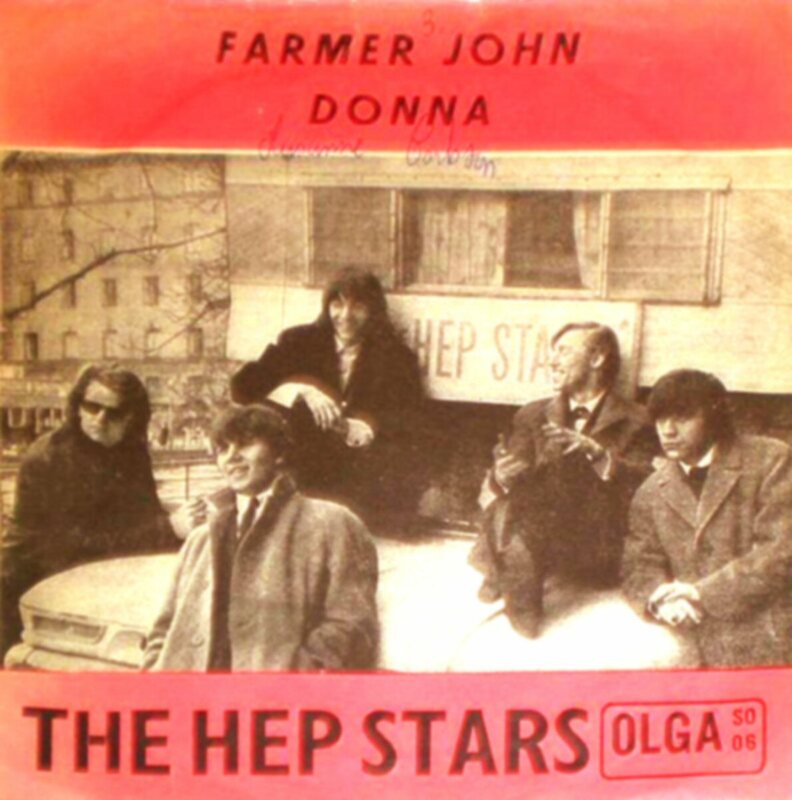 The single featuring "Farmer John" saw its release on March 6th, 1965. 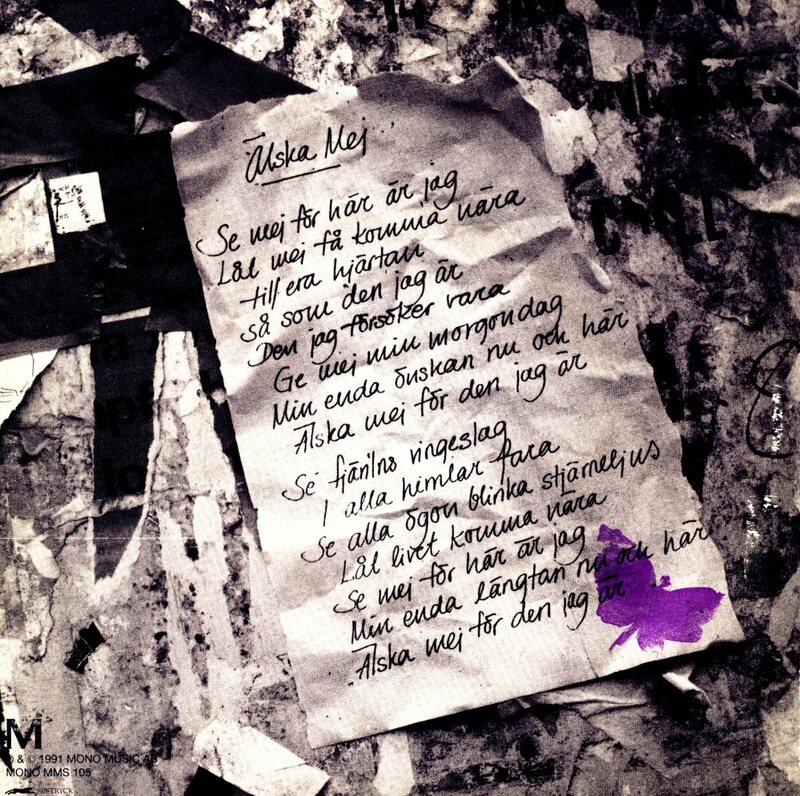 It entered the Swedish chart Kvällstoppen at the end of April where it stayed for 18 weeks peaking at #1 for 4 weeks. The single became hit even in Norway where it entered the hit chart in June where it stayed for 10 weeks peaking at #4. 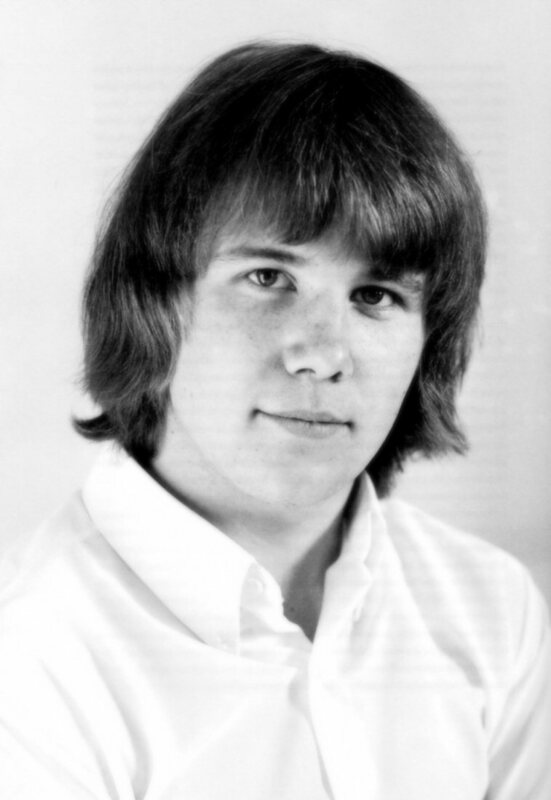 "Farmer John" appeared later on the German compilation album "Das Chris Howland-Schlager-Studio". 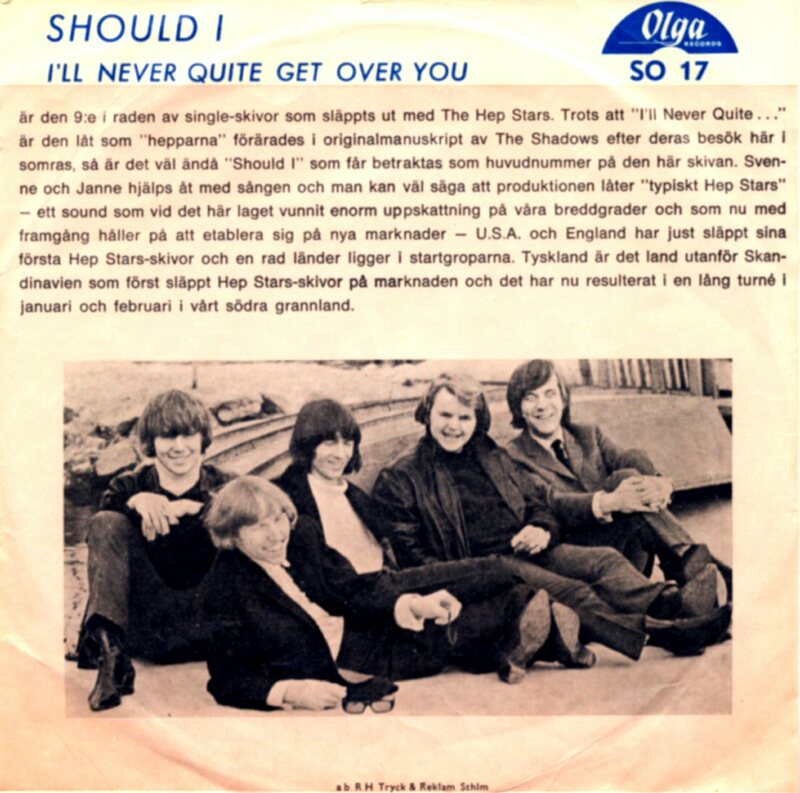 One more single was released in March 1965. 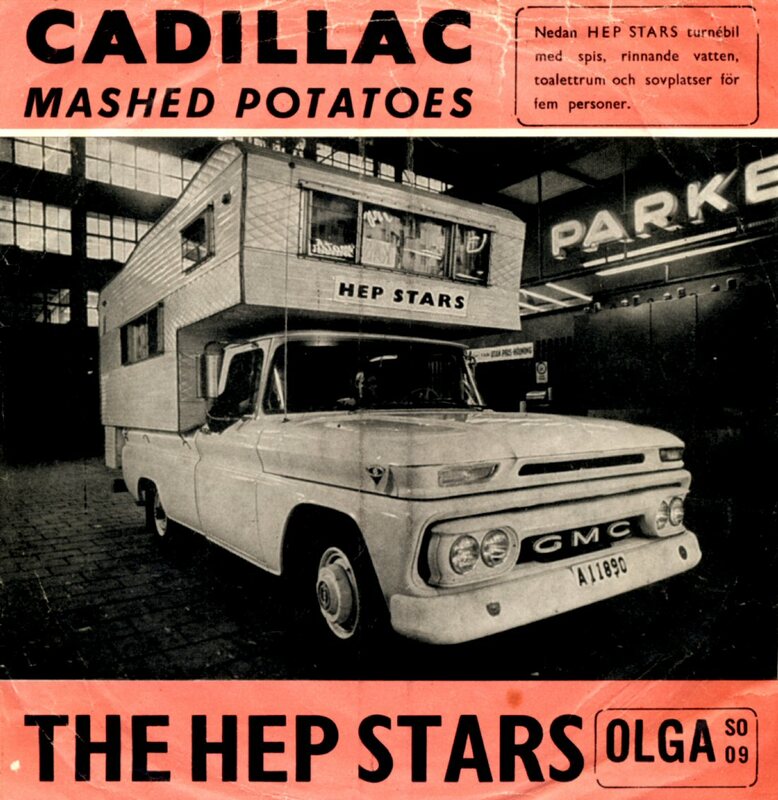 It featured "Cadillac" b/w "Mashed Potatoes". 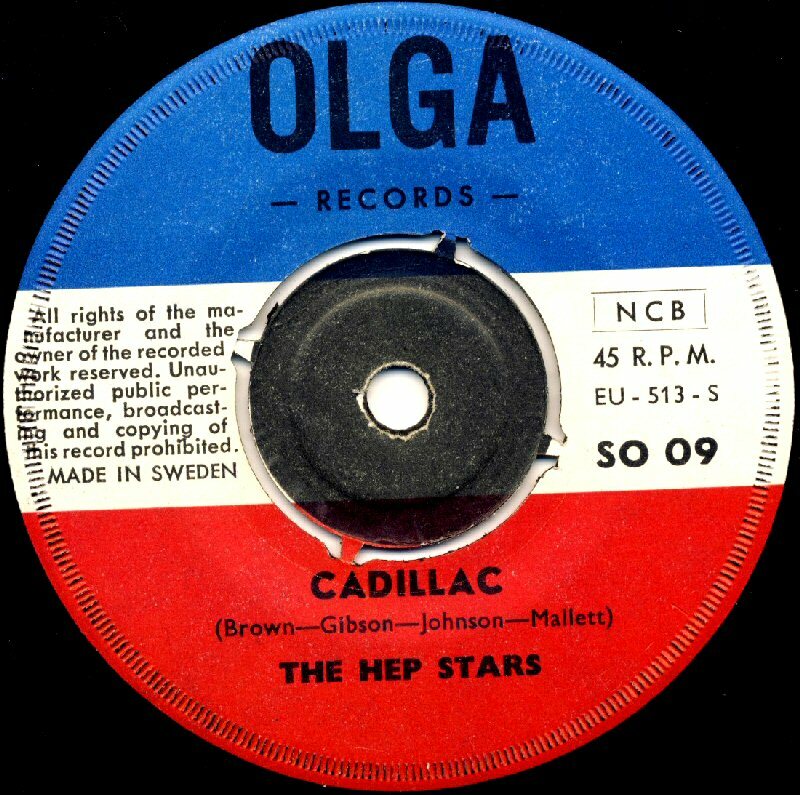 "Cadillac" became a big hit in Sweden. 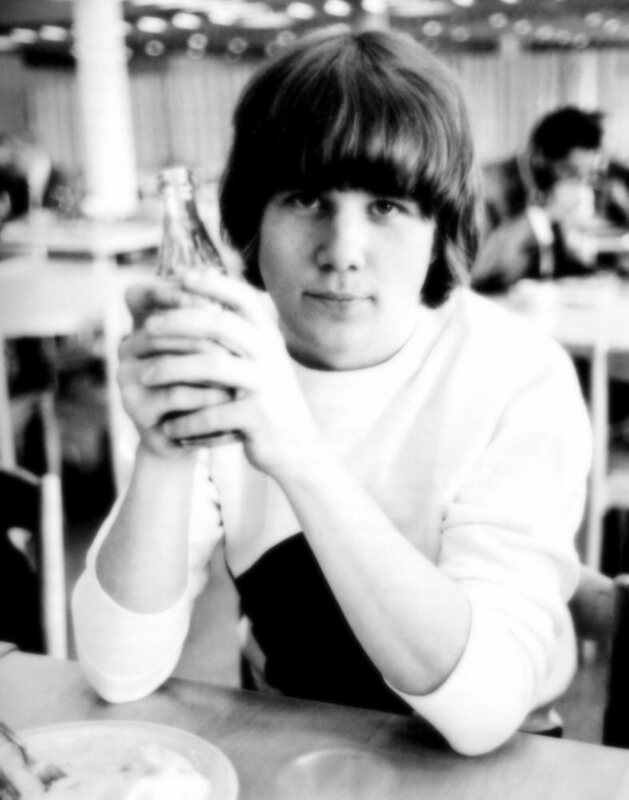 It entered "Kvällstoppen" on April 13th, 1965 where it stayed for 14 weeks peaking at #1. 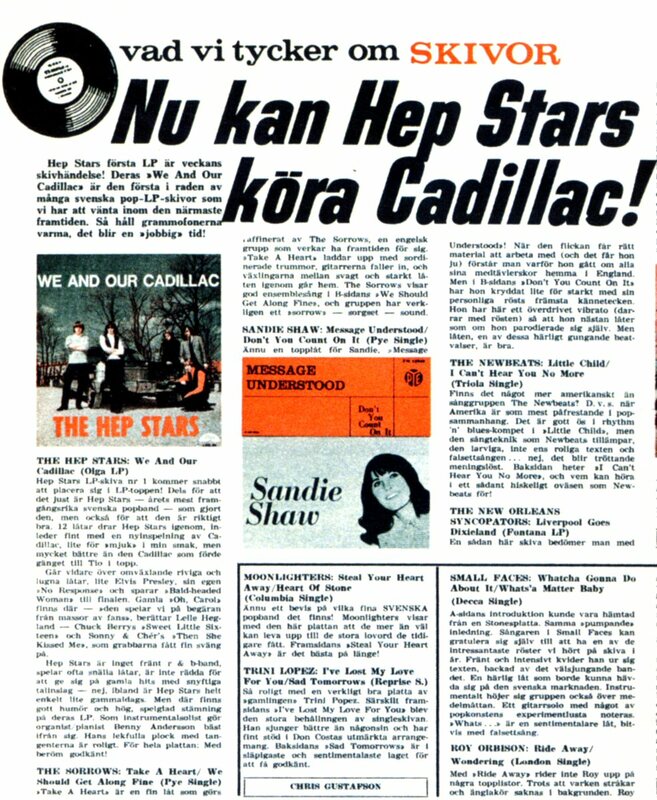 "Cadillac" entered "Tio i topp" on April 17th, 1965 and it stayed there for 7 weeks peaking at #1. 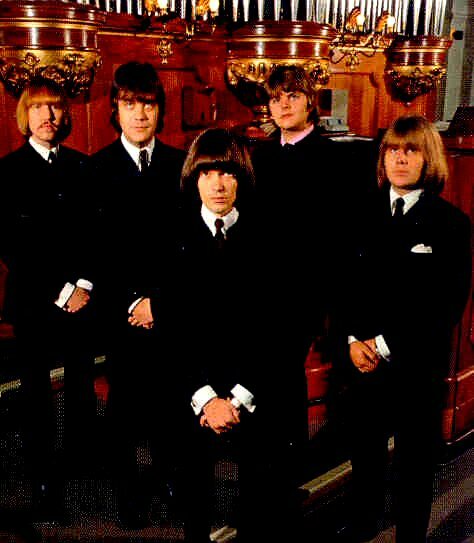 "Cadillac" became hit even in Norway where it entered the chart on June 9th, 1965 and stayed there for 16 weeks with peak position #1. 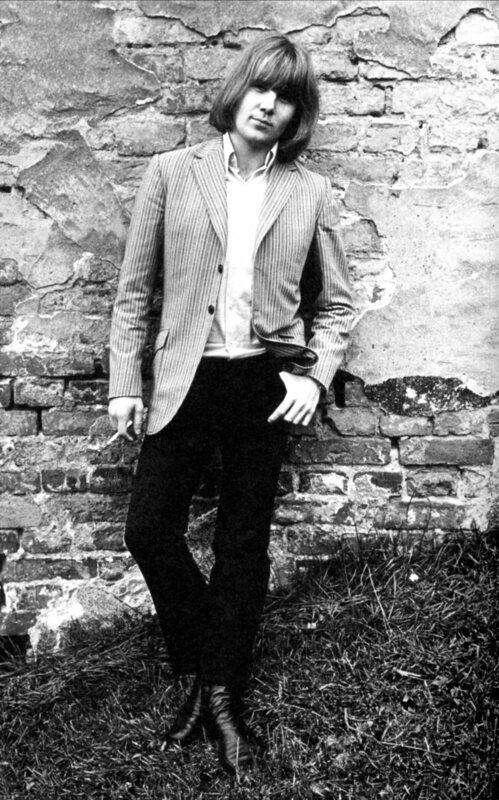 One of the first photo sessions taken at the Hässelby Castle in Stockholm in April 1965. 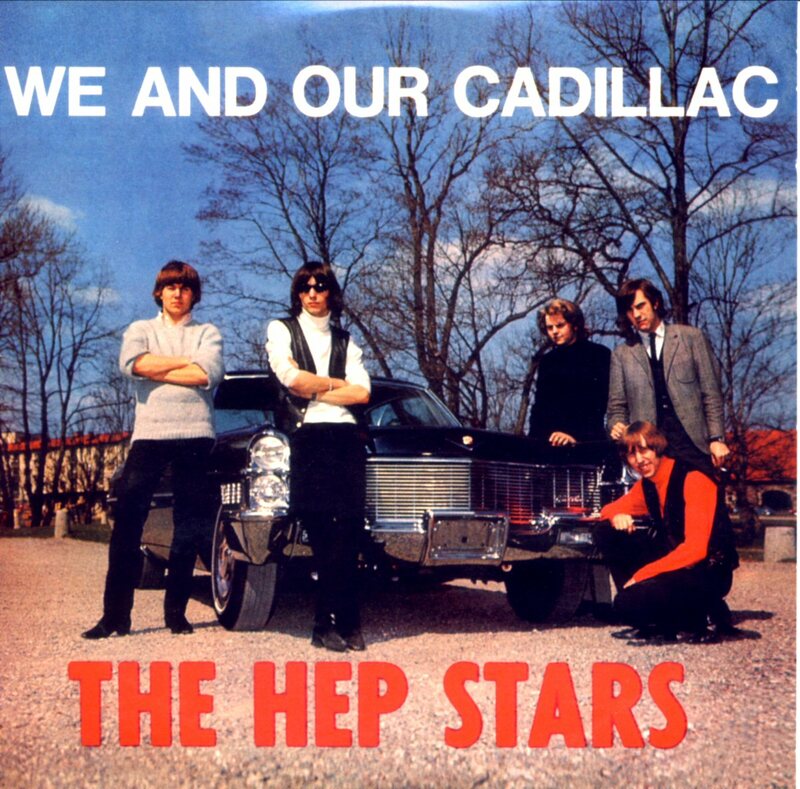 One of the shots would be used as a cover picture on their first album "We And Our Cadillac" later this year. 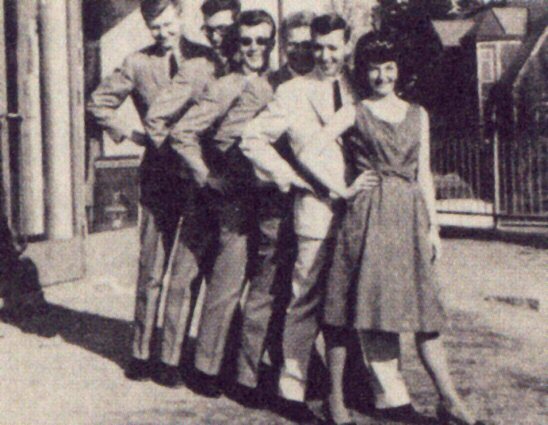 In the summer 1965 the band members together with their families went on holidays to Rhodos in Greece. Benny and his fiancée Christina Grönvall were caught on two pictures and they are the only existing pictures of Benny and Christina from the summer in Greece. 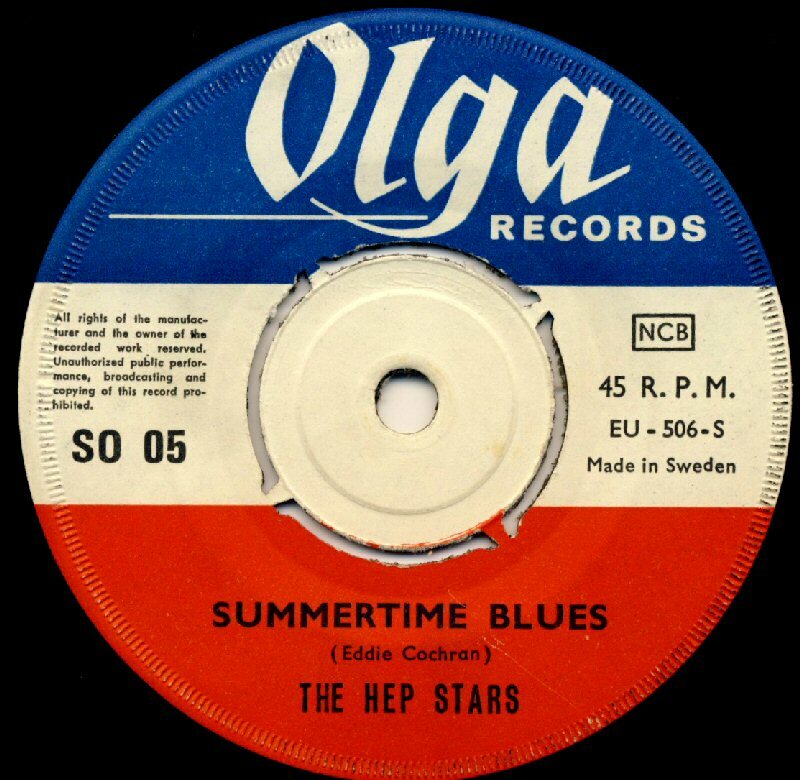 In the summer Hep Stars toured in Sweden and some of their shows were recorded for an album release later this year. 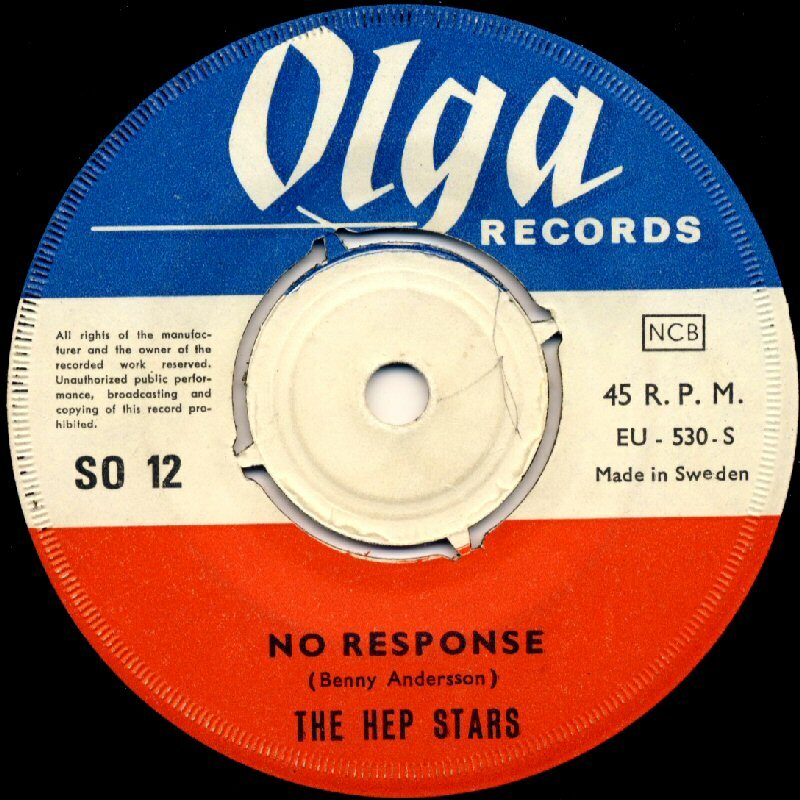 The first real Benny contribution as a composer was the song "No Response" which was written at the beginning of 1965 and recorded for a single release. 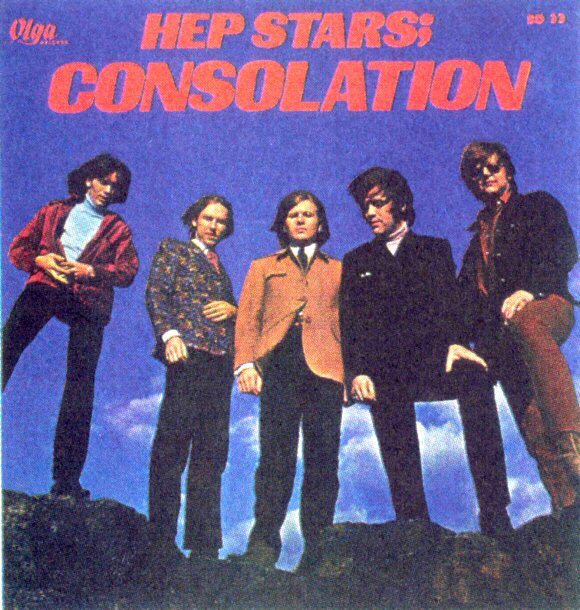 The single was released in August 1965 and it entered "Kvällstoppen" on September 14th, 1965 where it stayed for 15 weeks reaching #2. 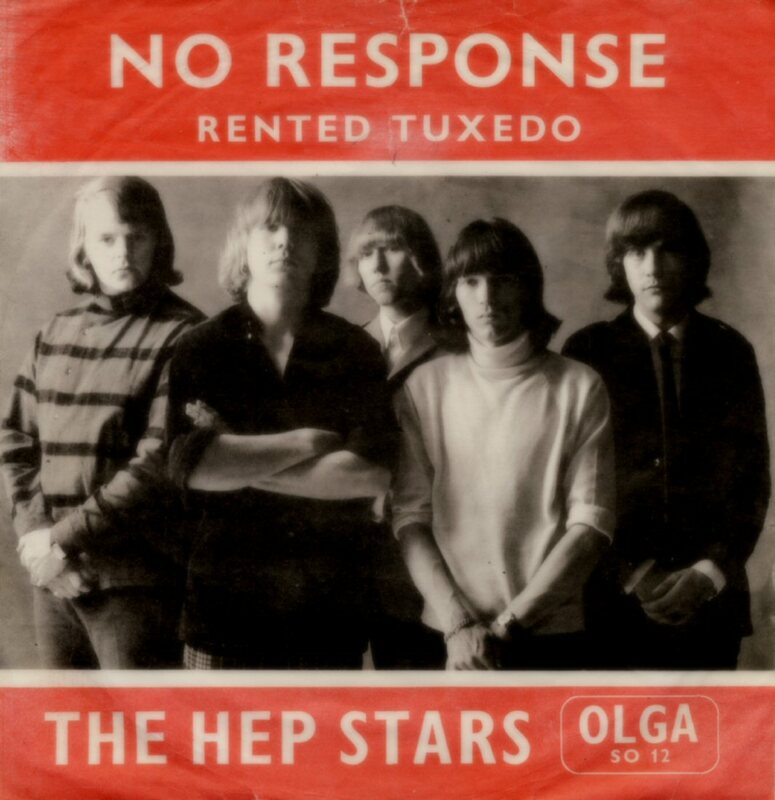 On "Tio i Topp" "No Response" stayed for 10 weeks peaking at #3. 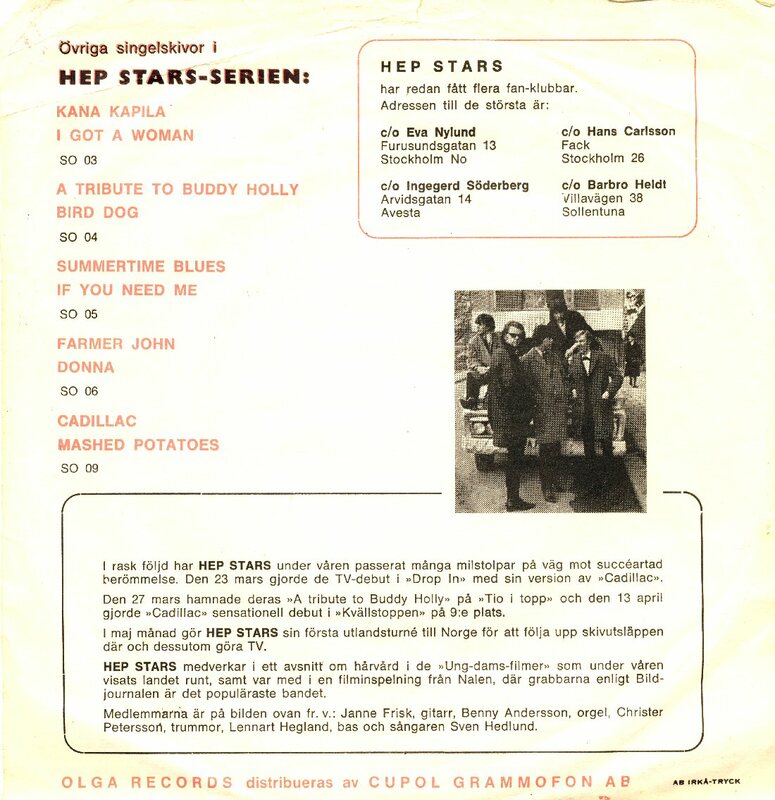 The single became successful in Norway where it entered the chart on October 13th, 1965 for 3 weeks with peak position #6. 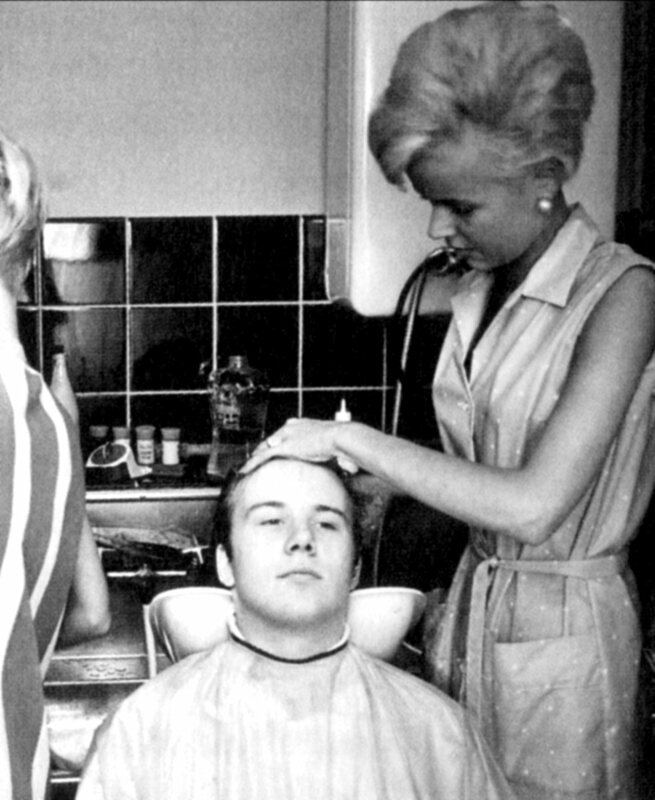 Below: Benny posing for the Swedish magazine "Bild" some day in August 1965. The picture to the left was part of the mega poster which was issued in September 1965. 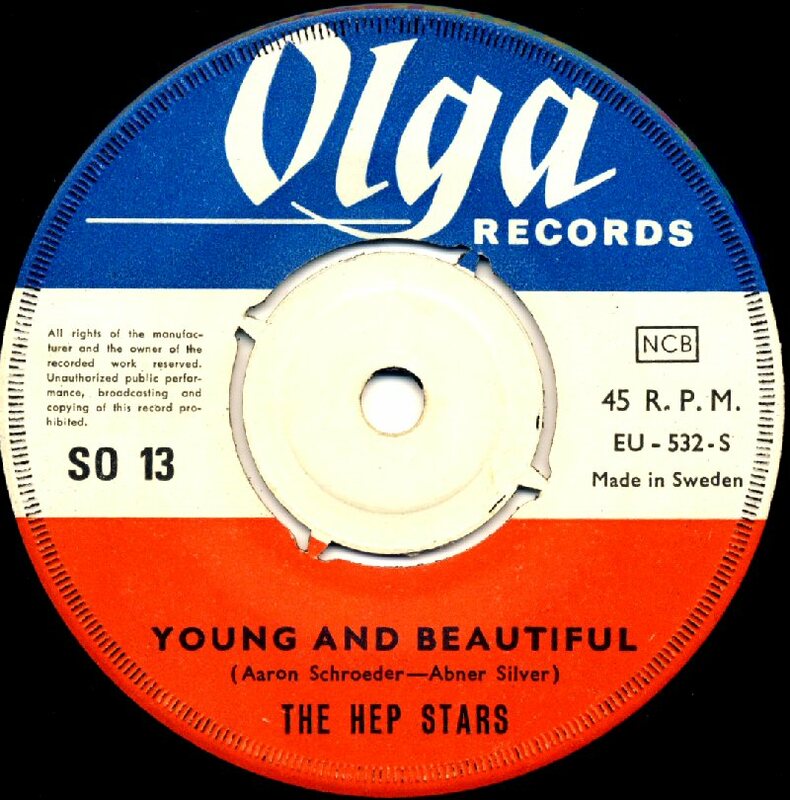 The single "So Mystifying" b/w "Young and Beautiful" saw its release in September 1965. 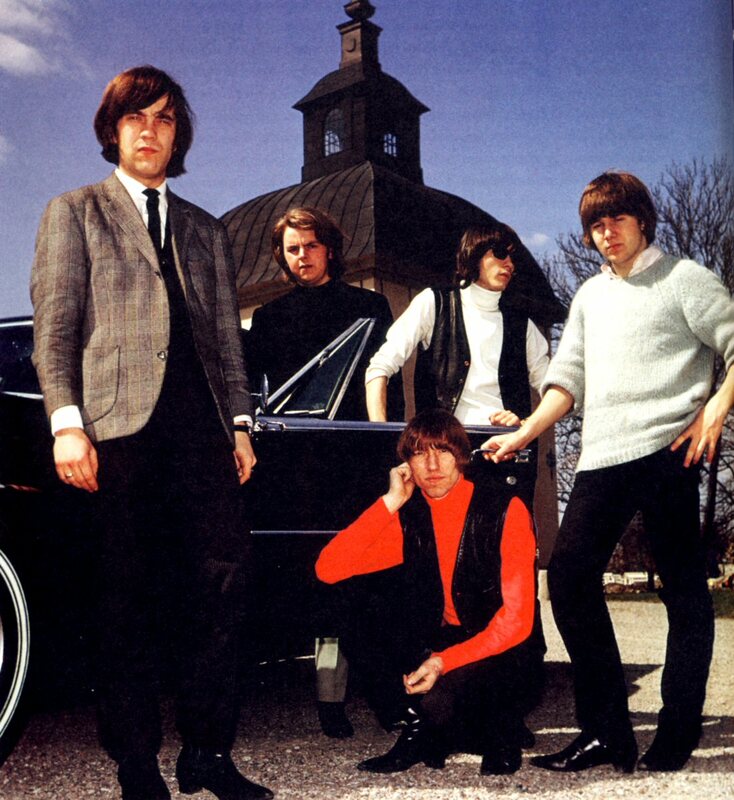 It entered "Kvällstoppen" on October 12th, 1965 where it stayed for 9 weeks peaking at #5. On "Tio i Topp" "So Mystifying" stayed for only 2 weeks peaking at #4. 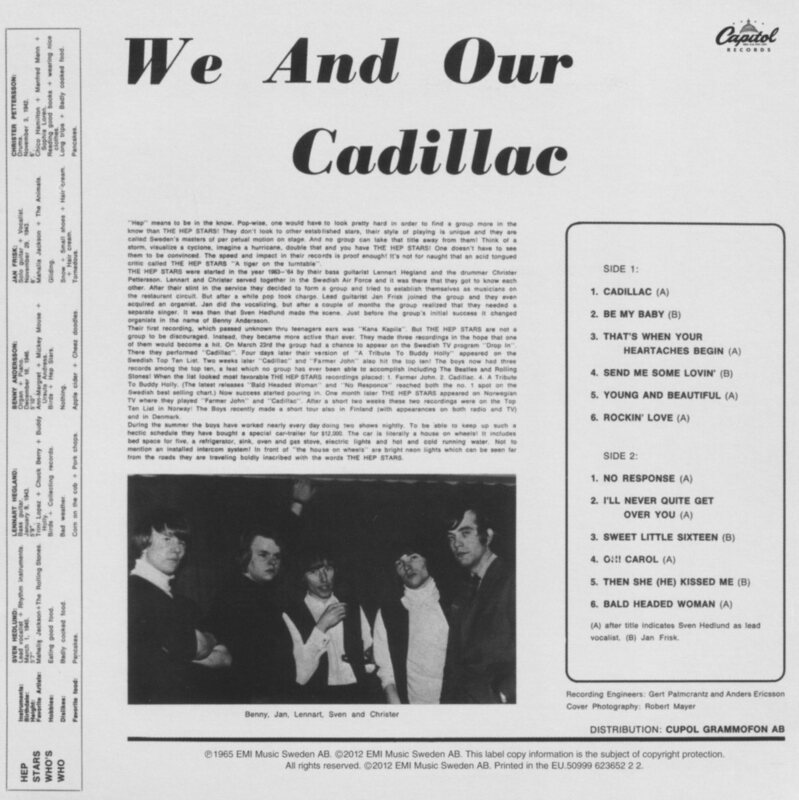 The first album entitled "We And Our Caddilac" saw its release on October 1st, 1965. 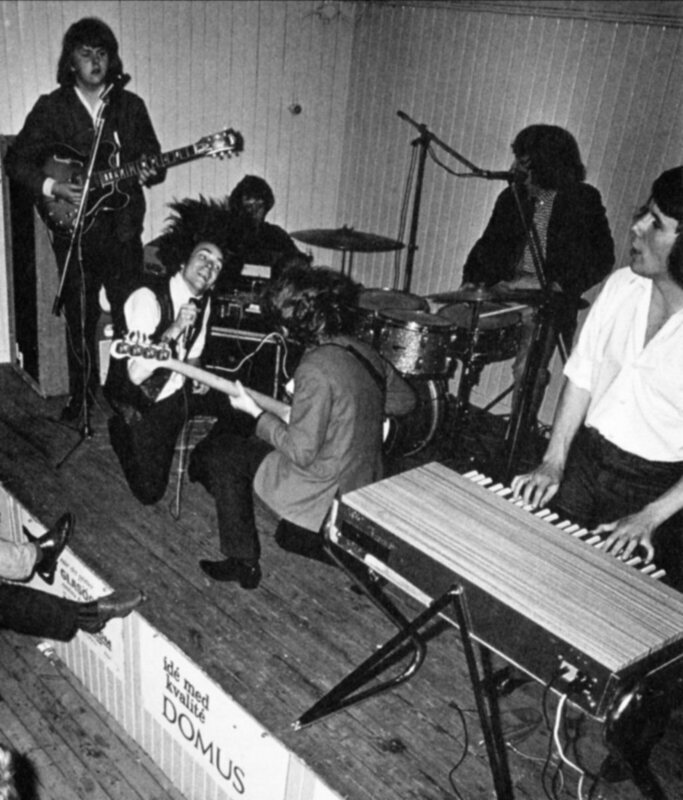 The debut album featured 12 songs. 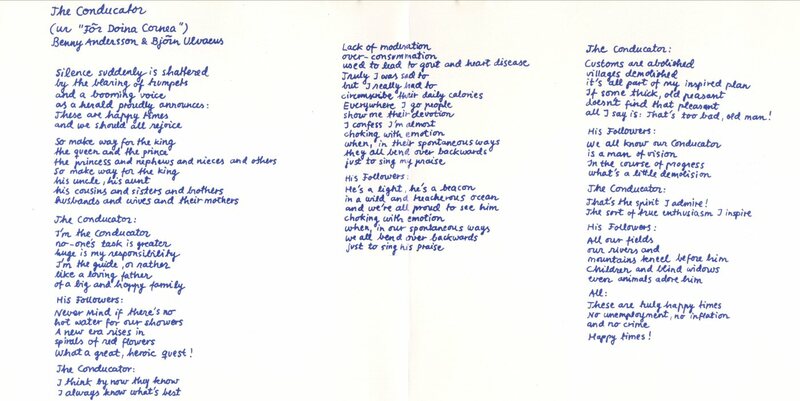 One of them - "No Response" was written by Benny. 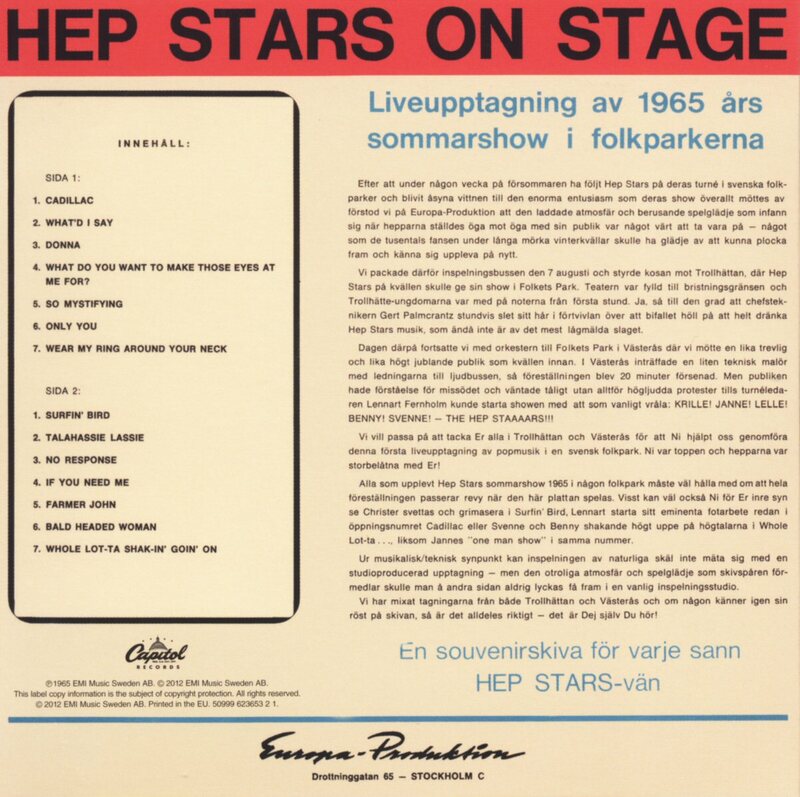 The 1965 summer tour of Hep Stars was so huge success that it was decided that a live album from their concerts would be released. 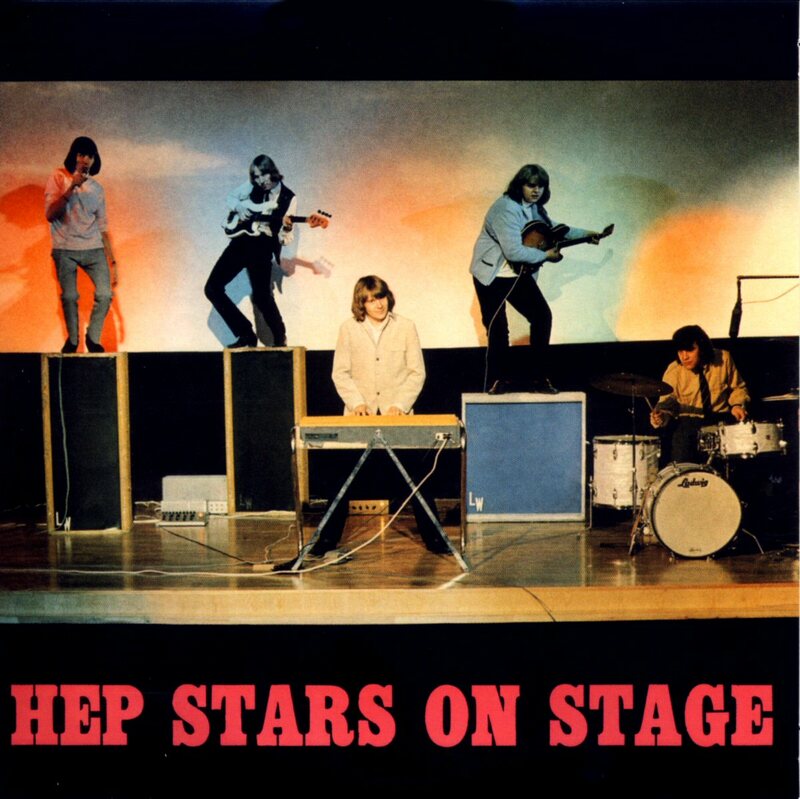 "Hep Stars on Stage" saw its release at the beginning of December 1965. 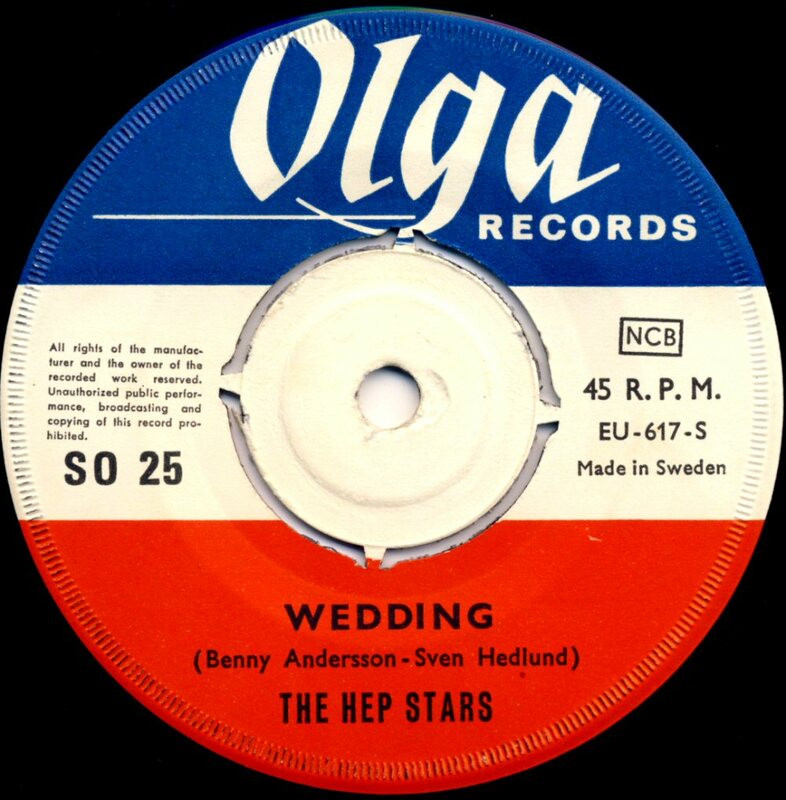 "Wedding" was Benny's second composition in 1966 which made Hep Stars successful on the hit charts in Sweden (#1), Norway (#8) and Finland (11). 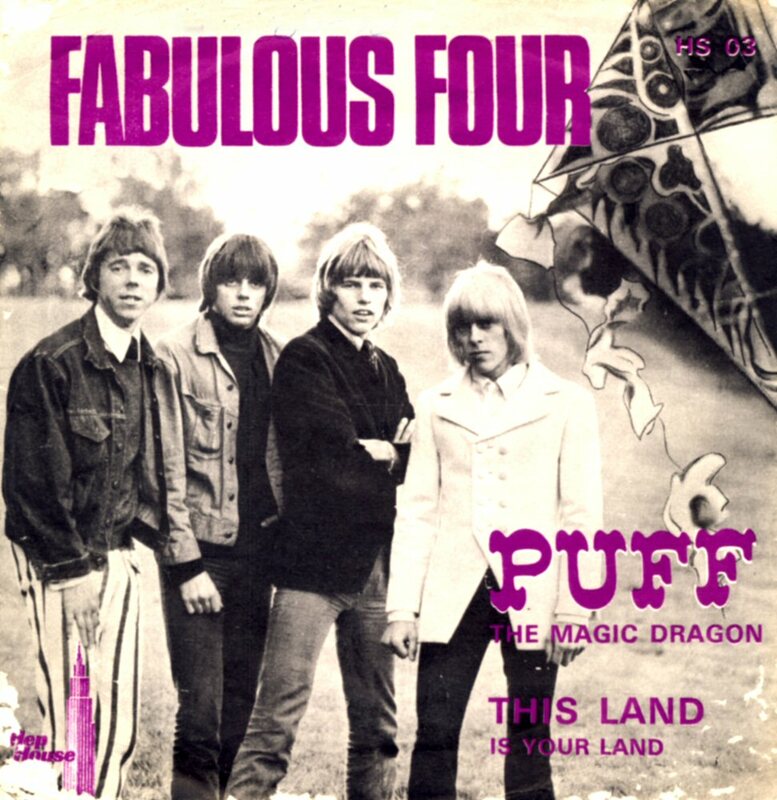 The single was released at the end of May 1966. 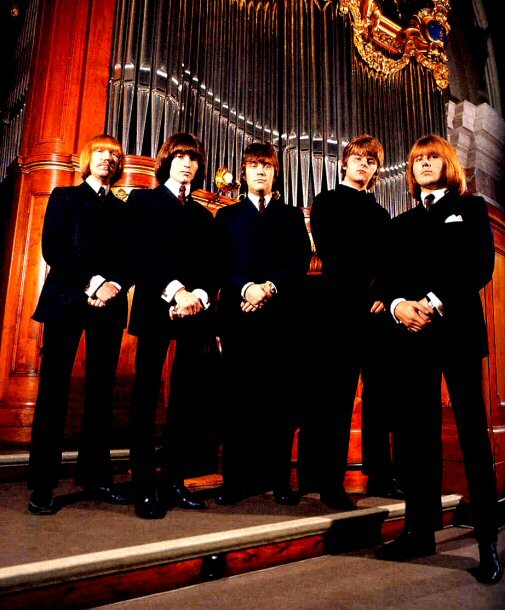 An early photo session taken in Stockholm - Södermalm. 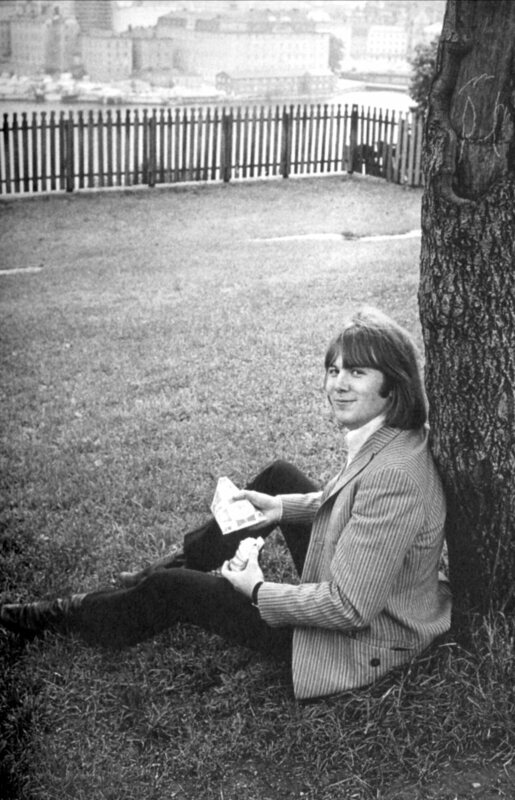 Benny wrote "Consolation" in the late summer 1966 and the song was released on the single in October. The single was very successful in Sweden. 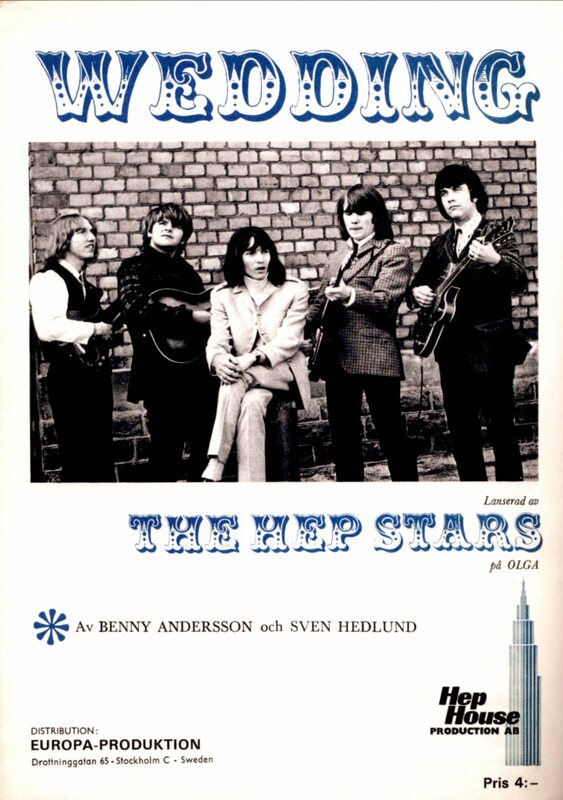 The studio album entitled simply "Hep Stars", which was released in December 1966, featured several compositions of Benny as well as the song "Isn't It Easy To Say" written by Benny together with Björn Ulvaeus. 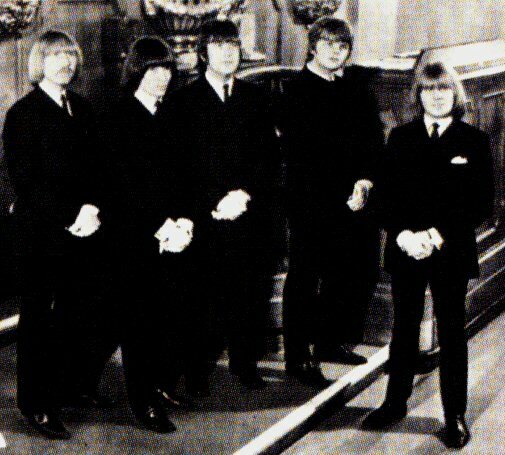 The album had been recorded between August and December 1966. 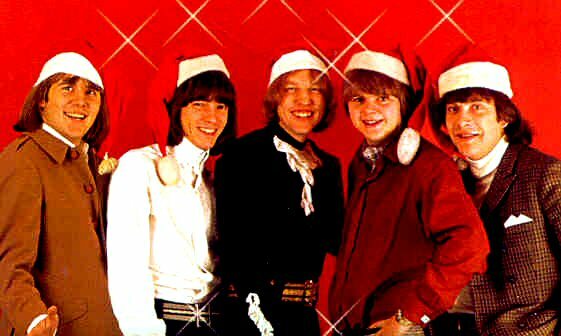 It entered the Swedish chart on December 27, 1966 where it stayed for 5 weeks reaching #12. 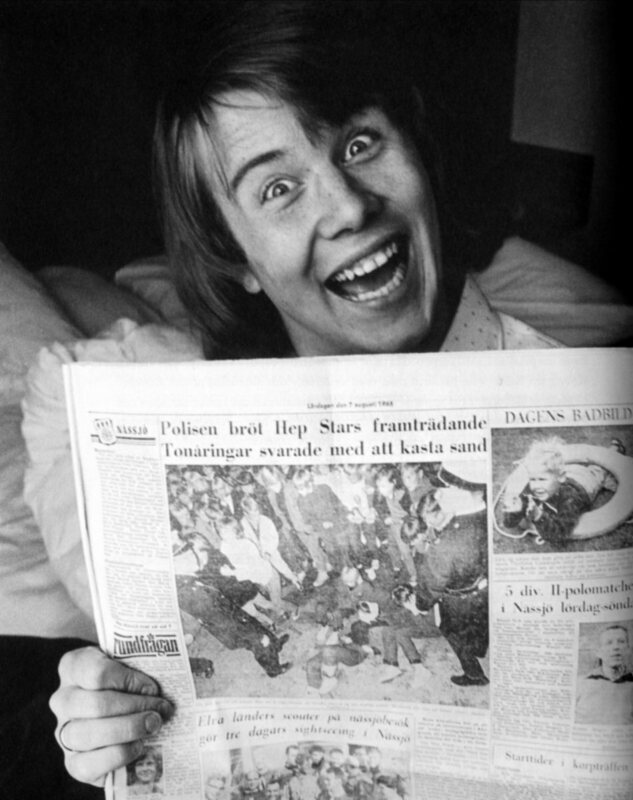 The album was even successful in Norway where it stayed on the chart for 21 weeks peaking at #5 at the beginning of 1967. 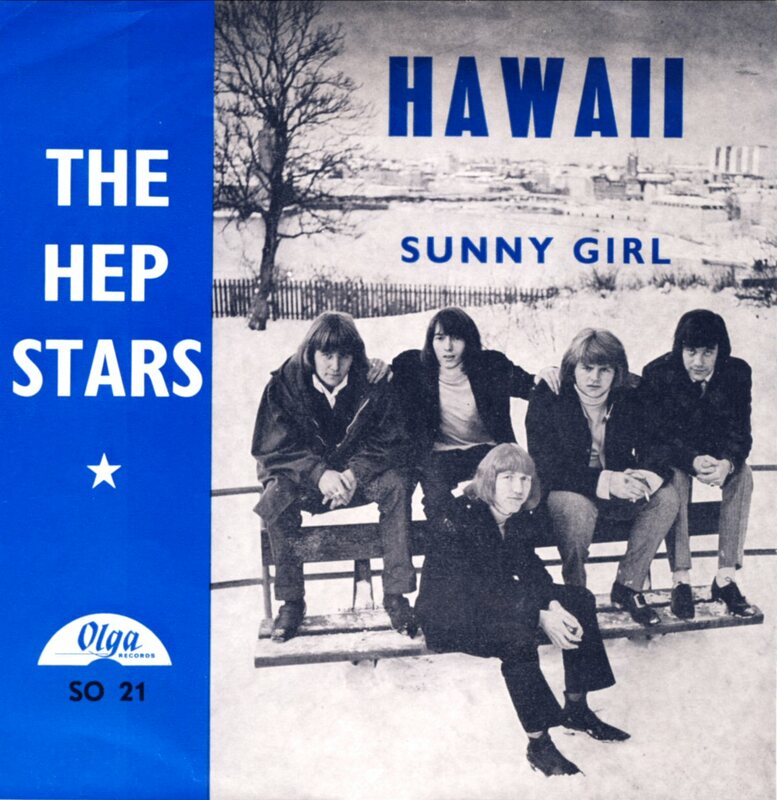 In Finland it entered the chart in January 1967 and stayed there for 9 weeks reaching #3. In November the Swedish weekly "Se" published an interview with Benny's fiancée Christina Grönvall who was talking about living in the shadow of Hep Stars. 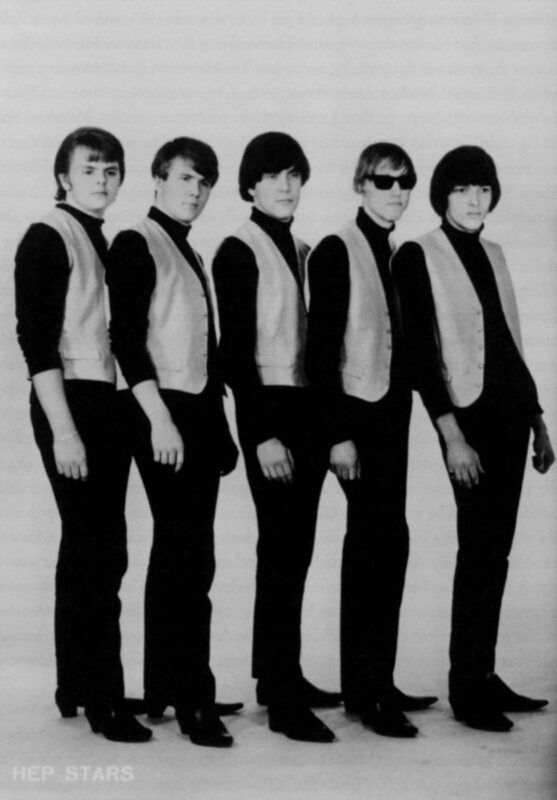 Benny and the others in the band were not allowed to reveal that they had wives/girl friends and children. 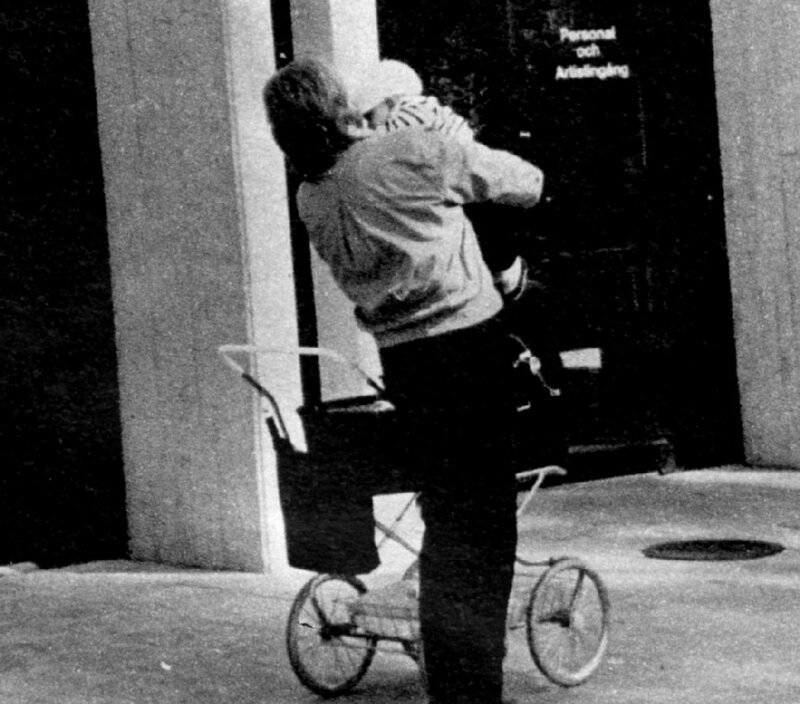 Several pictures of Christina and Benny's children Helena and Peter were taken in the flat in the Stockholm suburb Vällingby. 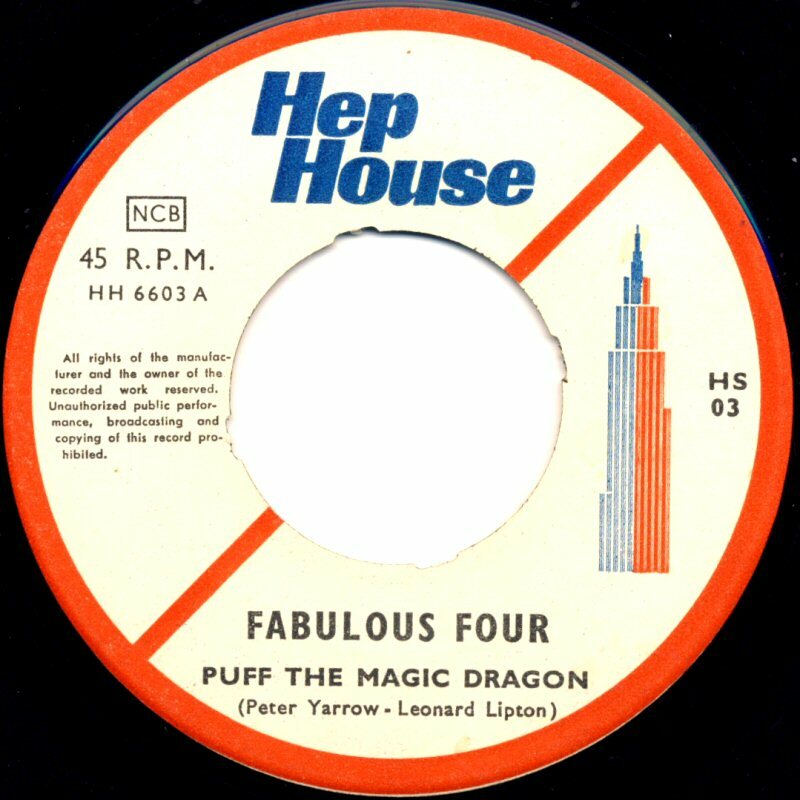 In the autumn 1966 Benny produced the song "Puff The Magic Dragon" recorded by the group Fabulous Four. 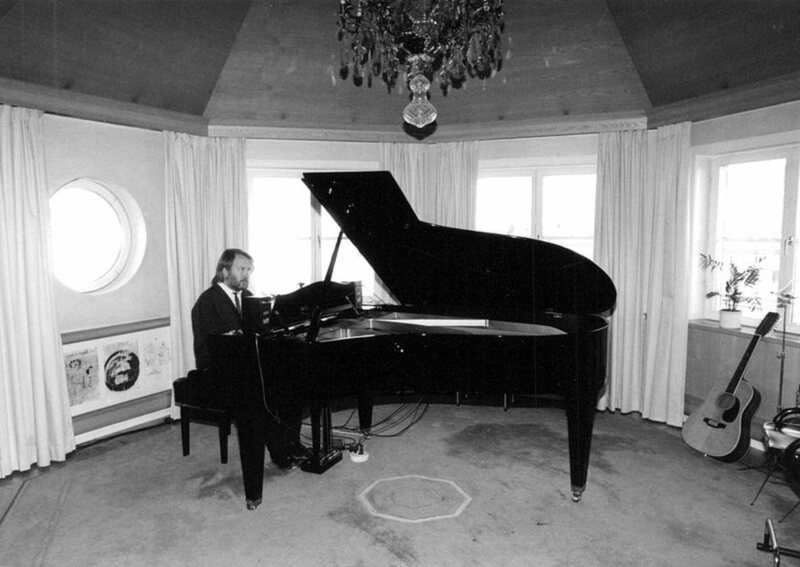 He even played keyboard on this recording. 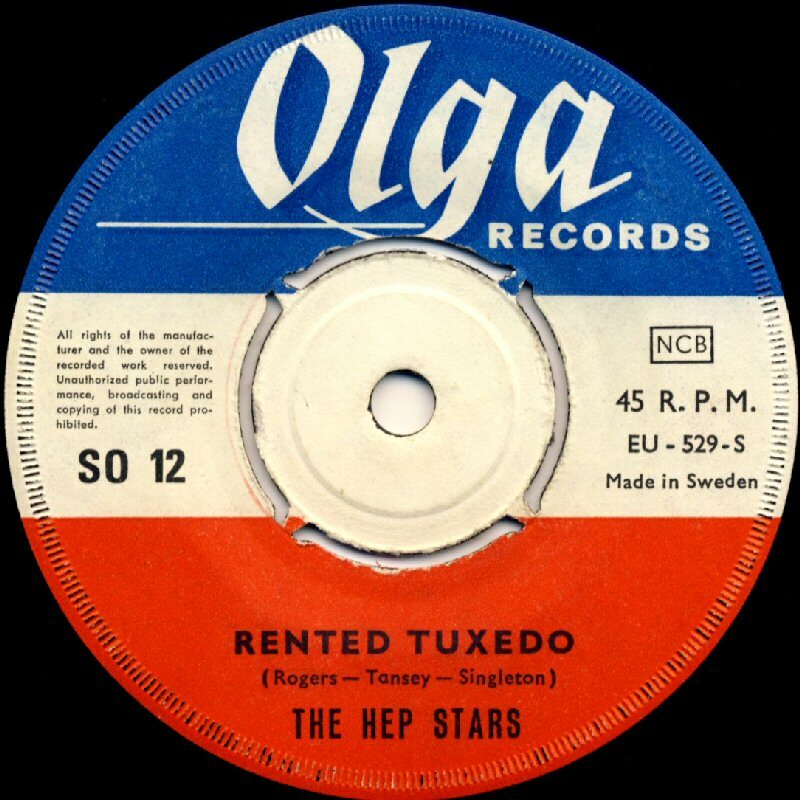 The single was released by Hep Stars' own record label "Hep House" and it became a big success in Sweden where it peaked at #1 on the "Tio i topp" chart on November 26th, 1966. 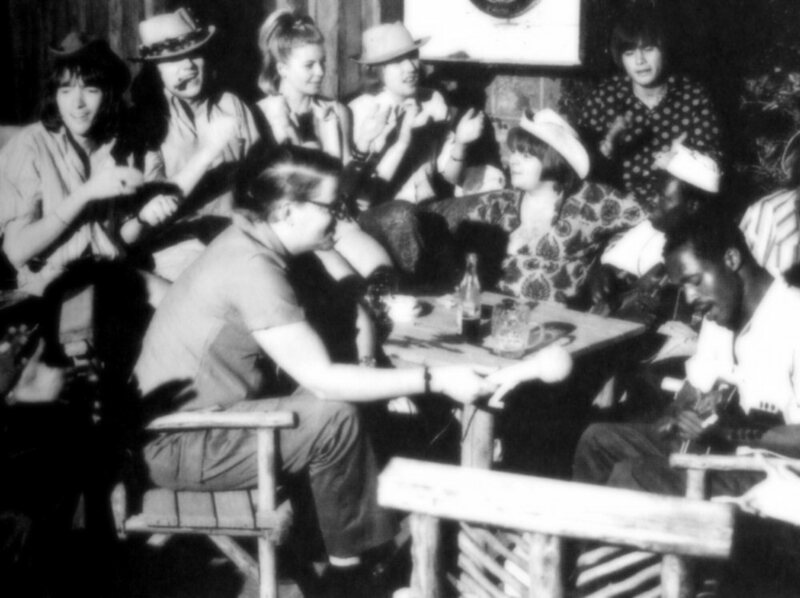 Even if the group enjoyed big commercial success in Sweden and in the Nordic countries their business went very bad and the decision to make a movie picture in Africa led to big financial troubles for the group. 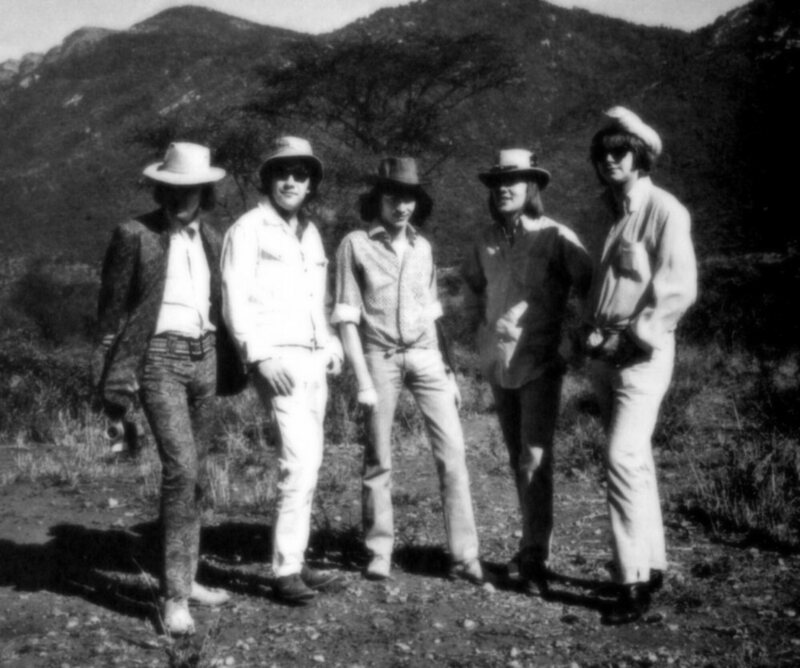 The big film project was very badly planned and the day before the group would leave Sweden there was no manuscript at all. 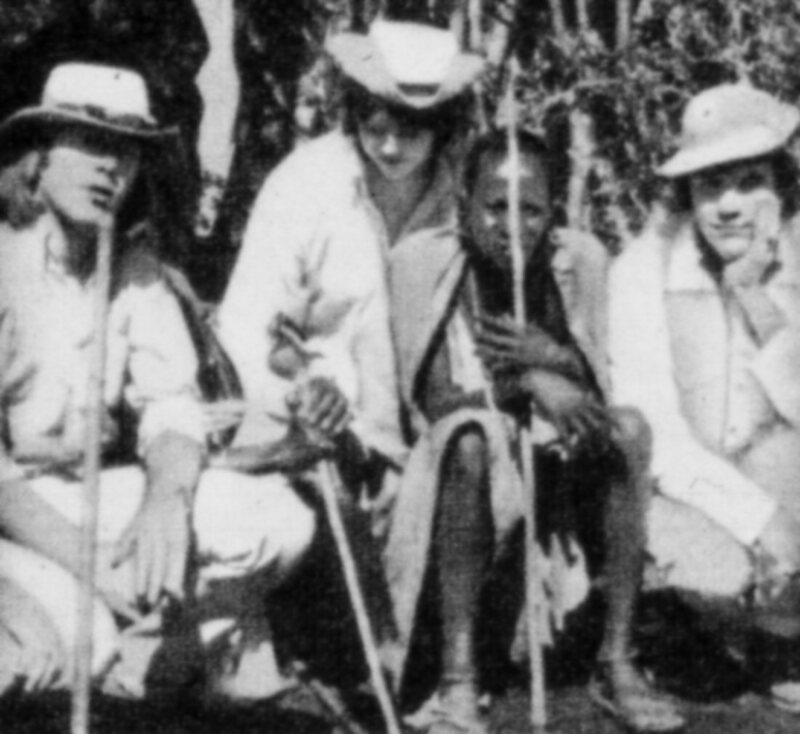 Filming in Africa took about two weeks and the additional filming was done in Sweden outside Uppsala. 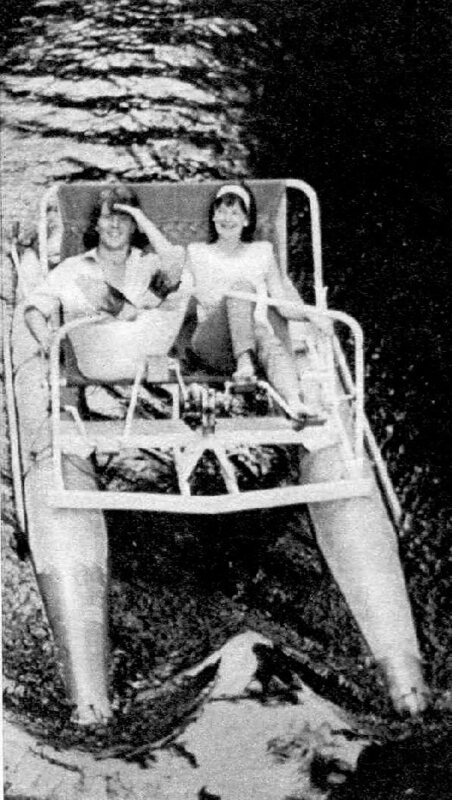 According to the director there was impossible to edit the film because of a very tiny storyline. 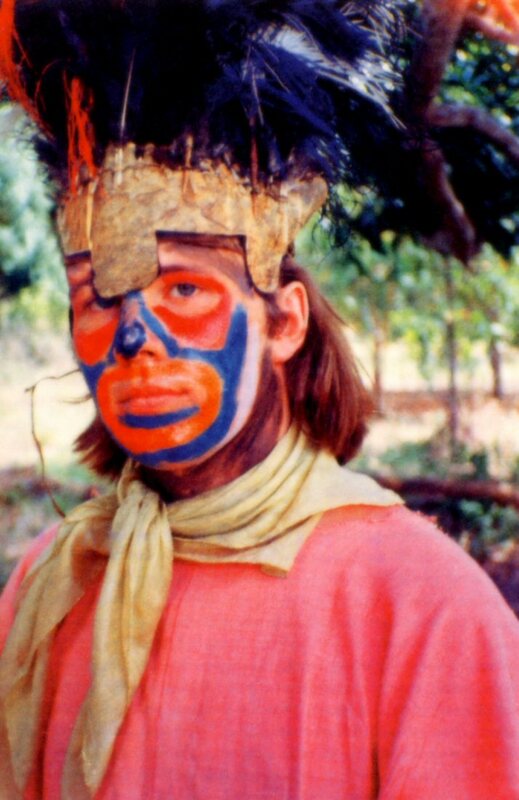 It's quite interesting that it was Lasse Hallström, the future director of ABBA The Movie who tried to do something of this material. 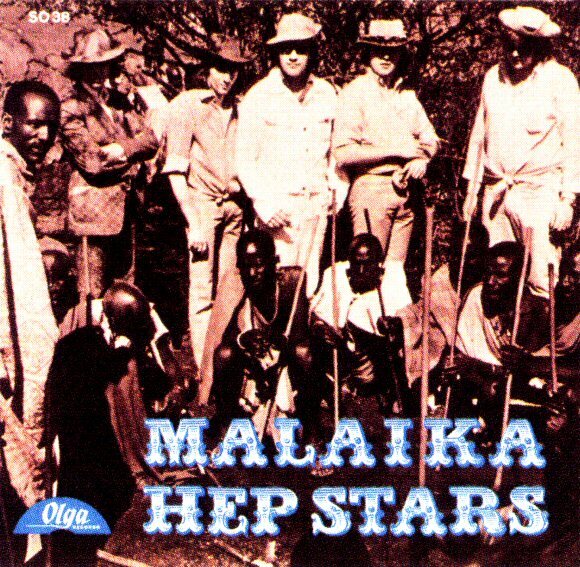 The single "Malaika" was of course inspired by the Africa adventure which would never be a finished project. 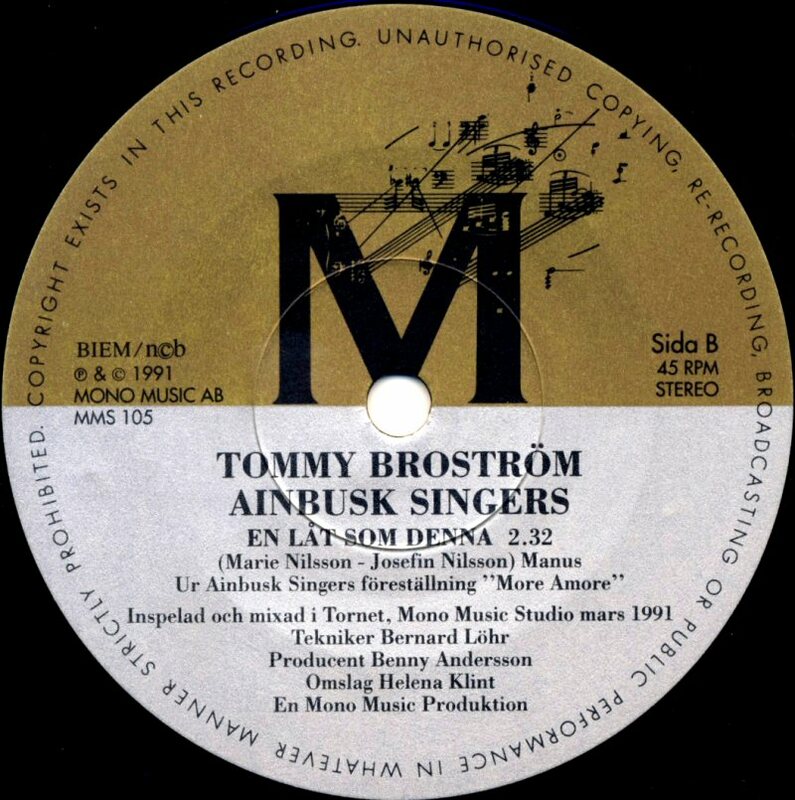 The most interesting thing with this single was that it contained Benny's composition "It's nice to be back" which would be covered 4 years later by Anni-Frid Lyngstad under the Swedish title "Min egen stad. 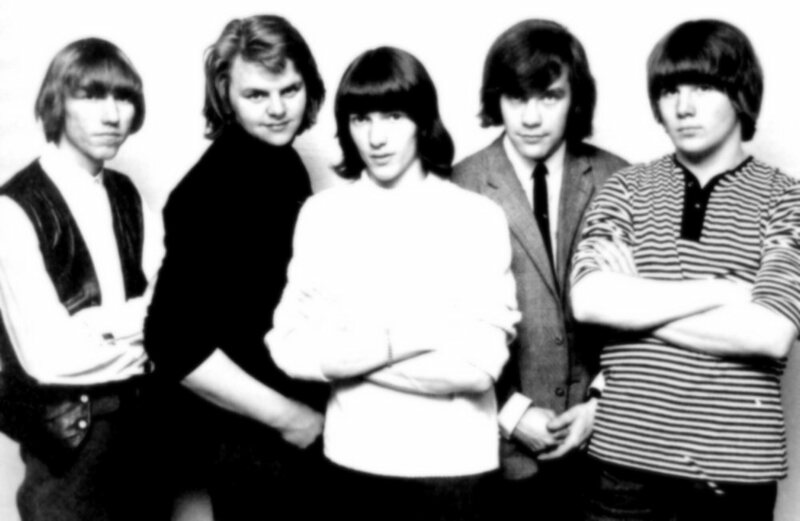 "Malaika" reached the top on the Swedish chart at the end of May 1967. 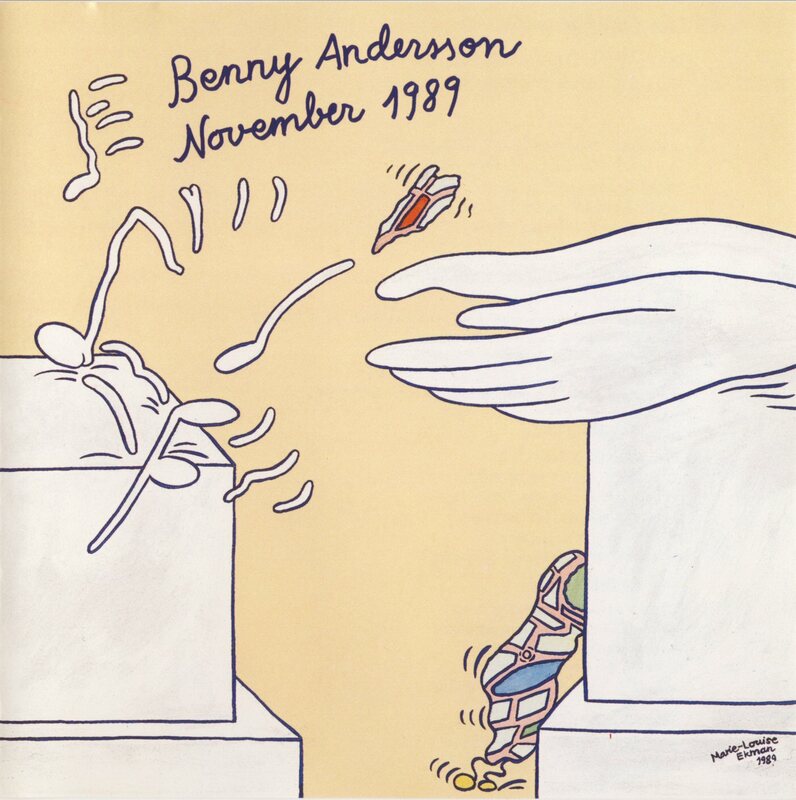 Two Benny songs were included on the single "Lady Lady" which was released in Belgium. 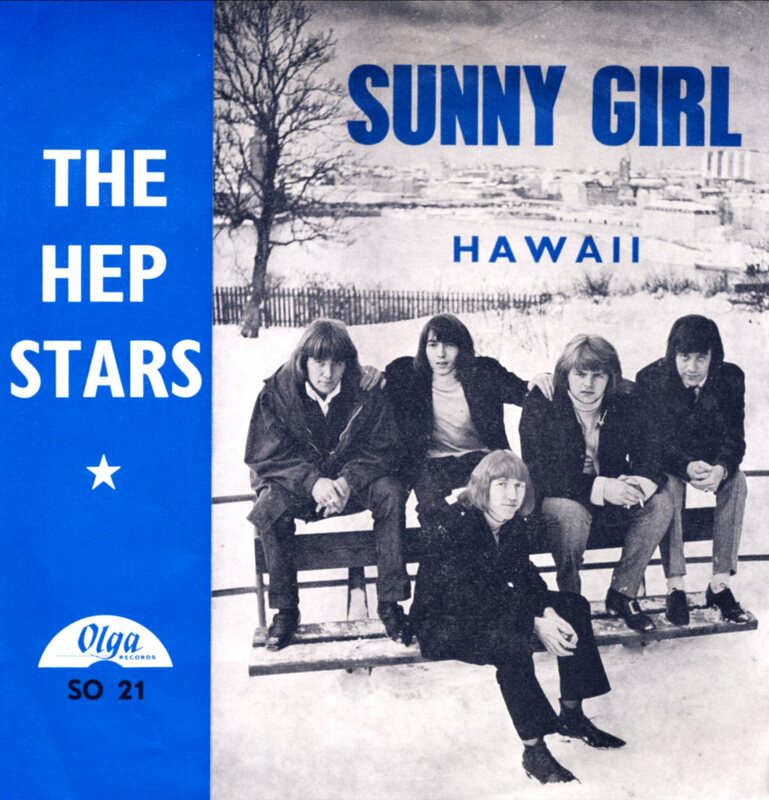 Already successful in the neighbour country Holland "Sunny Girl" was featured on the side B. 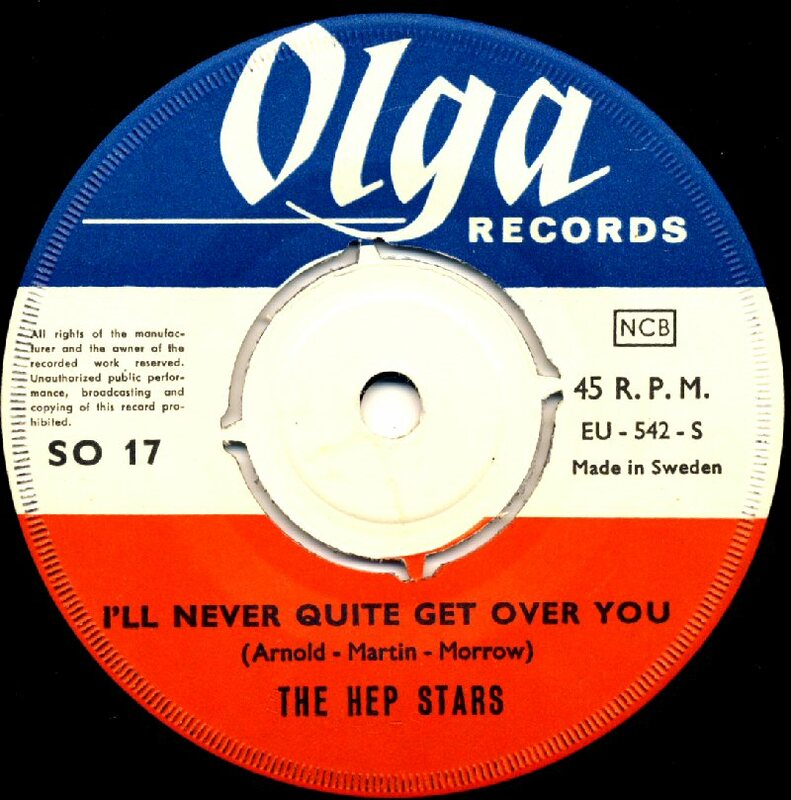 The single flopped though and Hep Stars did not become stars in Belgium. 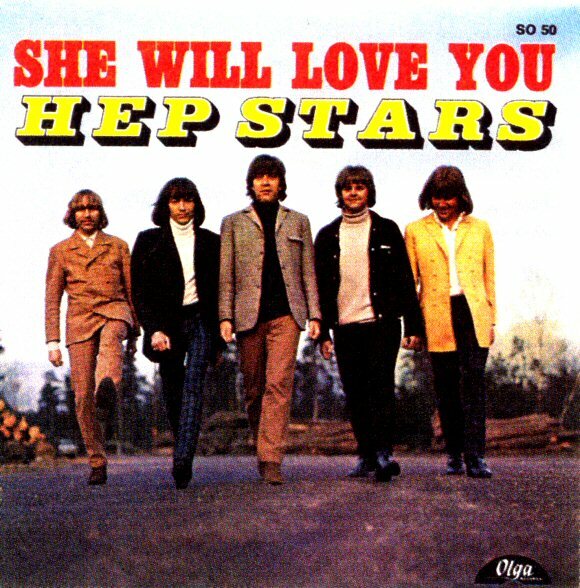 The last single release in 1967 contained the song "She will love you" composed by Benny together with Hep Stars' front man Svenne Hedlund. The song became a Top Ten hit in October. 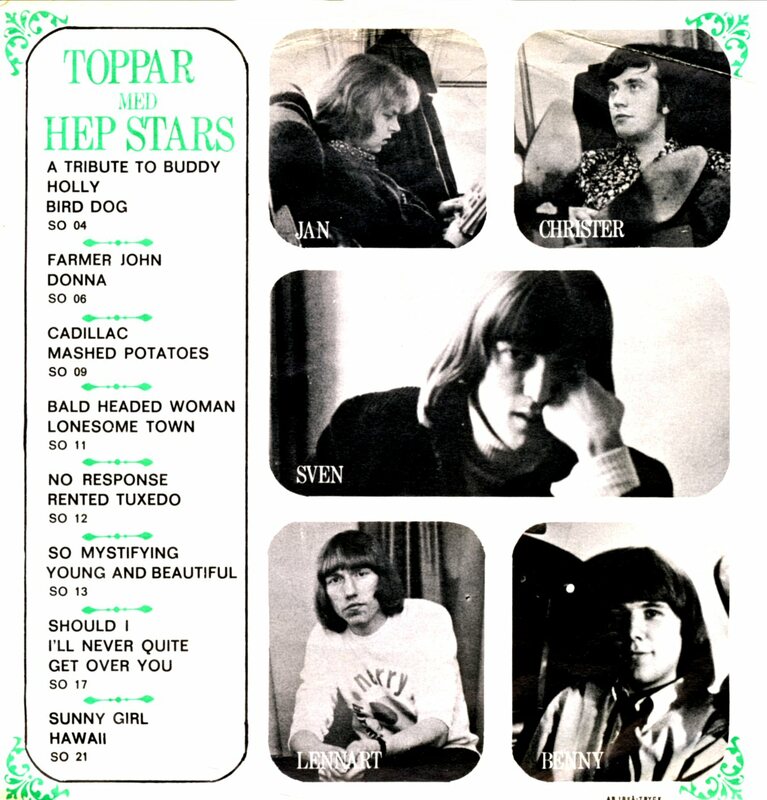 Hep Stars recorded their own Christmas album in October and November 1967. 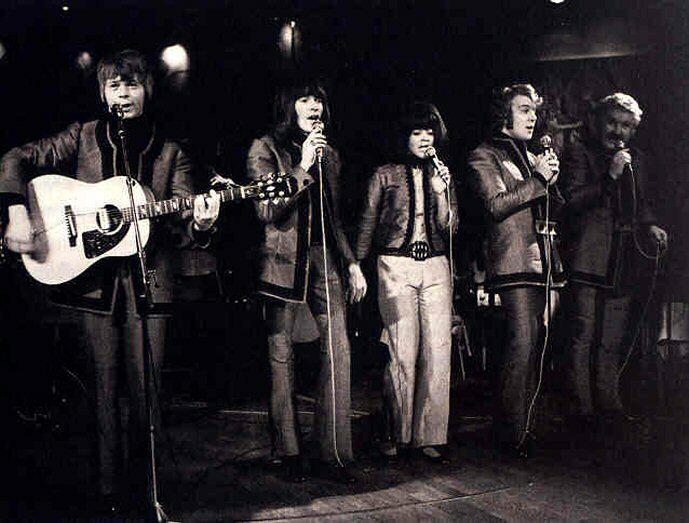 In January 1968 a single with two songs written by Benny (Wedding and Consolation) was released in Great Britain. 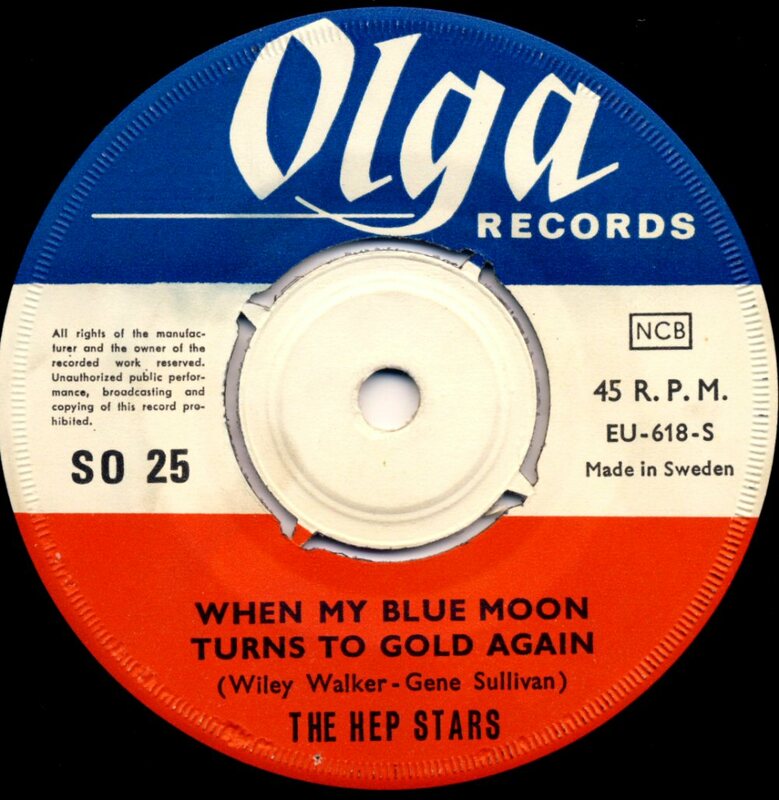 The new single from Hep Stars was released by Cupol in February 68 and it featured a Benny and Lasse Berghagen composition "It's Been A Long Long Time" on the side A. 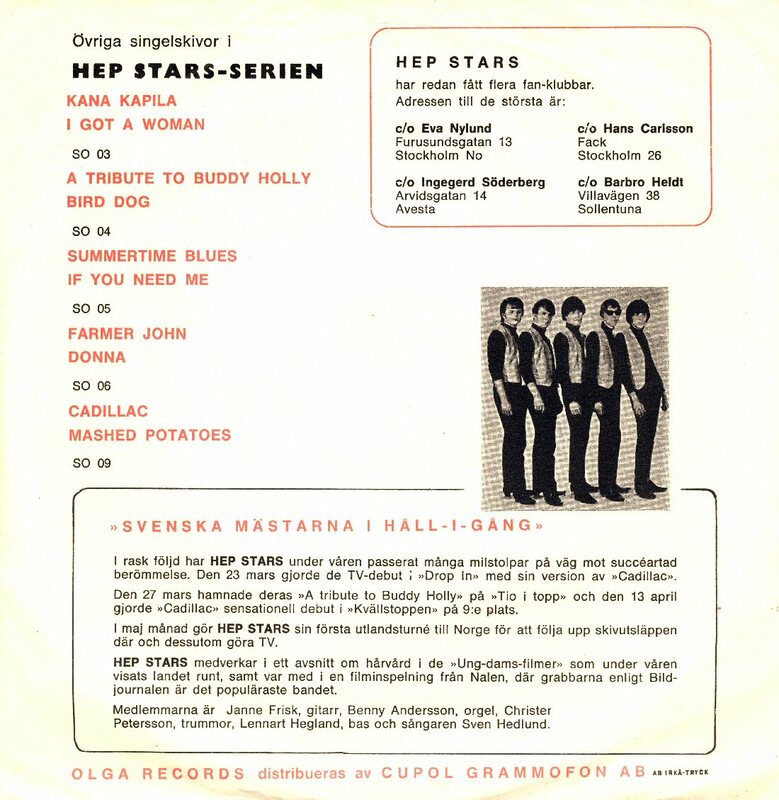 The single reached Top 20 on the Swedish chart "Kvällstoppen" in March 68. In March Hep Stars had a recording session at Metronome Studio in Stockholm. 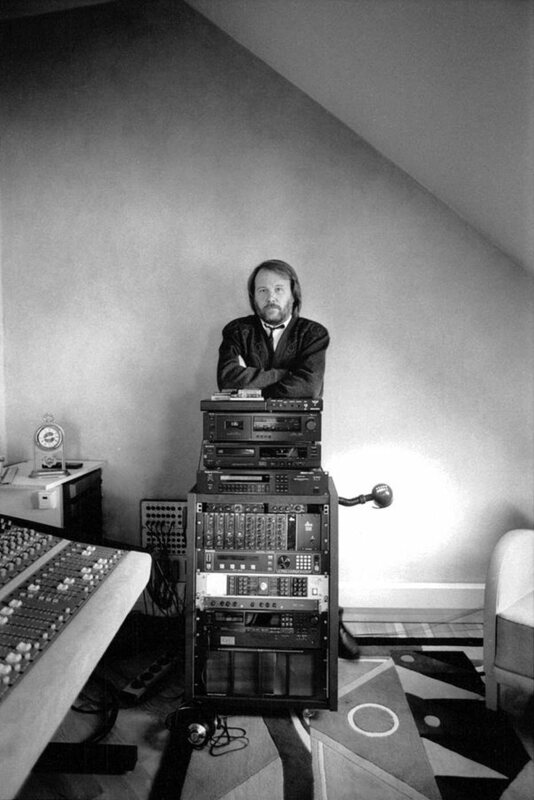 This studio would be a very important place for ABBA some years later. 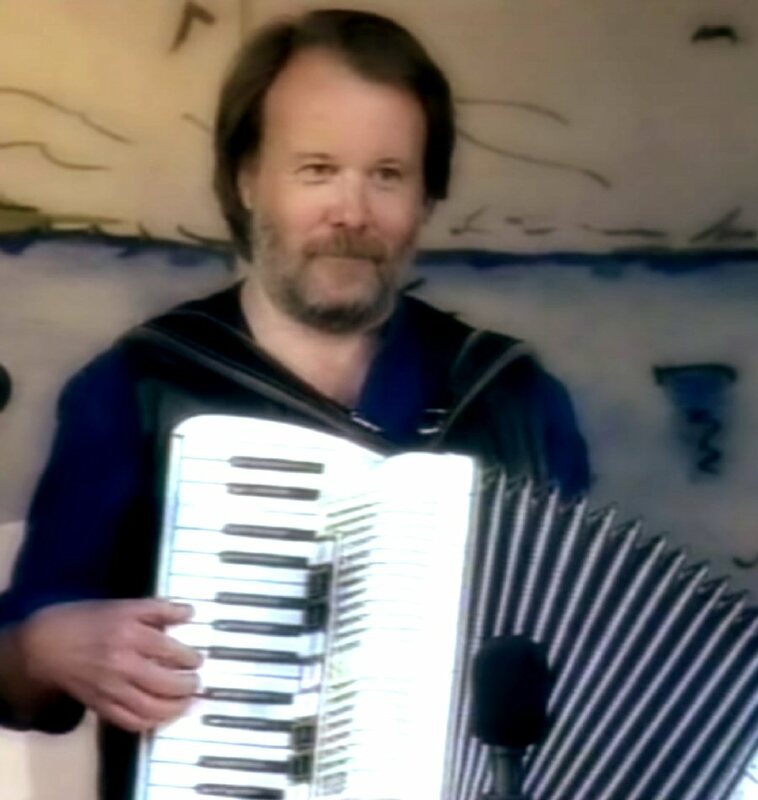 This session would bring one more composition of Benny Andersson and Lasse Berghagen "Sagan om lilla Sofi". 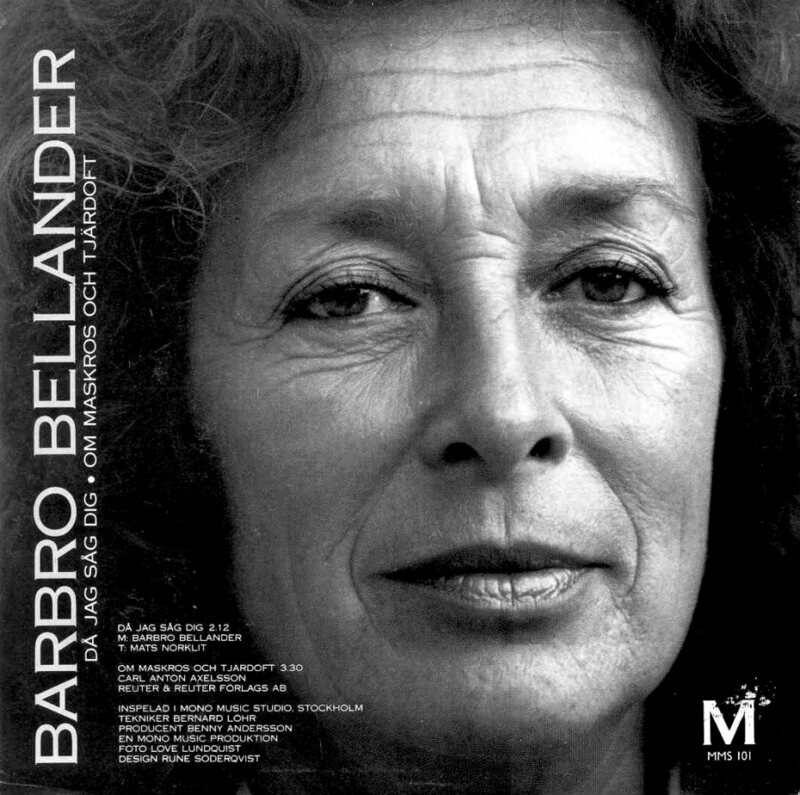 This single became much more successful on the Swedish chart than the previous one. 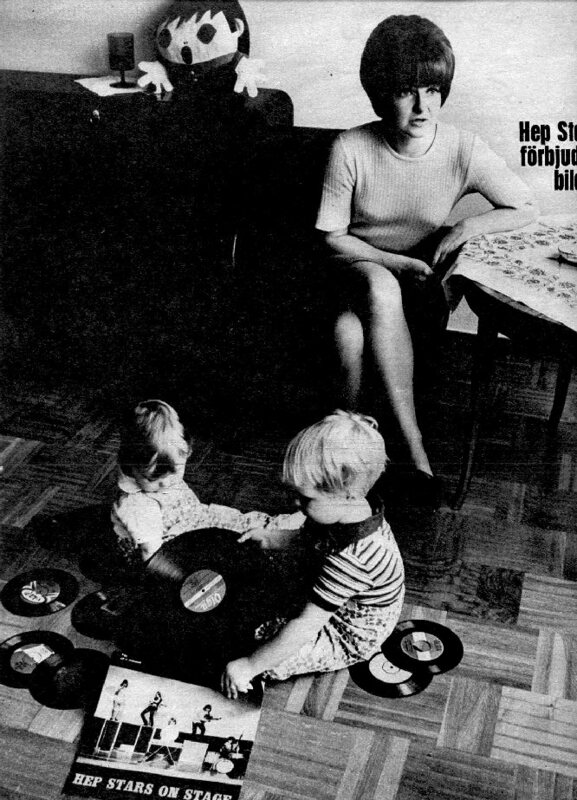 "Sagan om lilla Sofi" reached Top 5 and stayed on the chart for 17 weeks after its entrance in April 68. 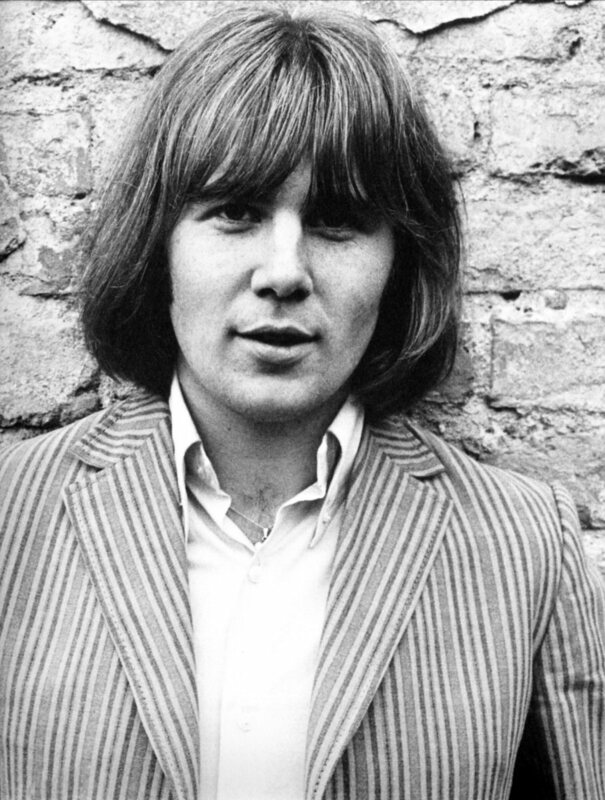 The 1968 album contained three songs written by Benny. 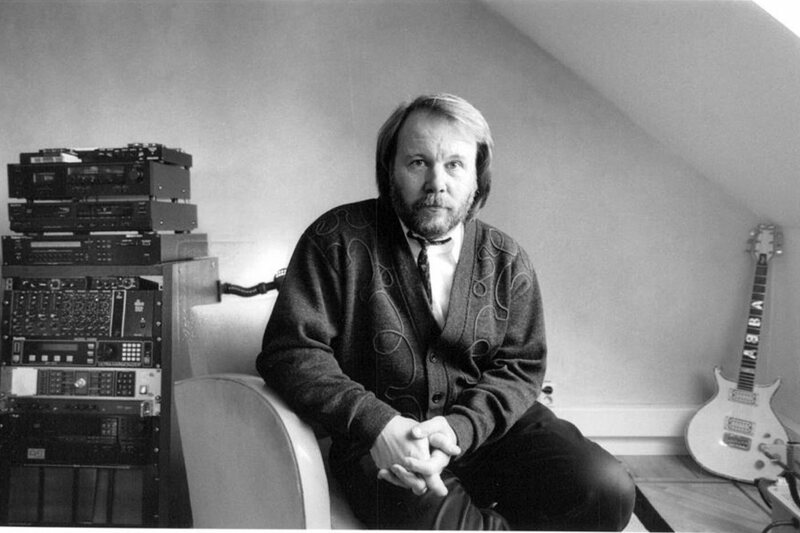 One of them was a new composition entitled "A Flower in my Garden" co-written with Björn Ulvaeus. Hep Stars had a new vocalist Charlotte Walker who was Svenne's fiancée. 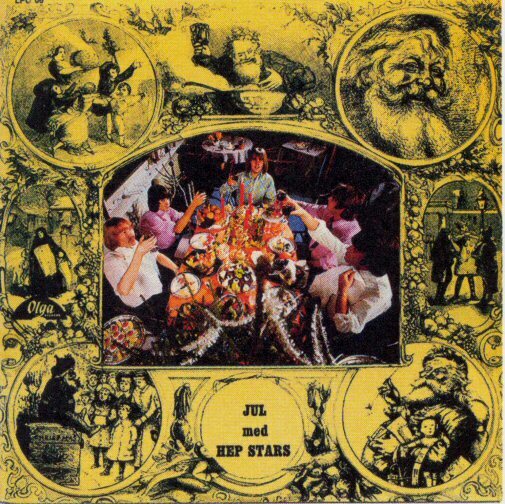 The album had a simple title "Songs we sang 68" and it was released at the beginning of December 68. The year 1969 was the last year in the Hep Stars for Benny Andersson. 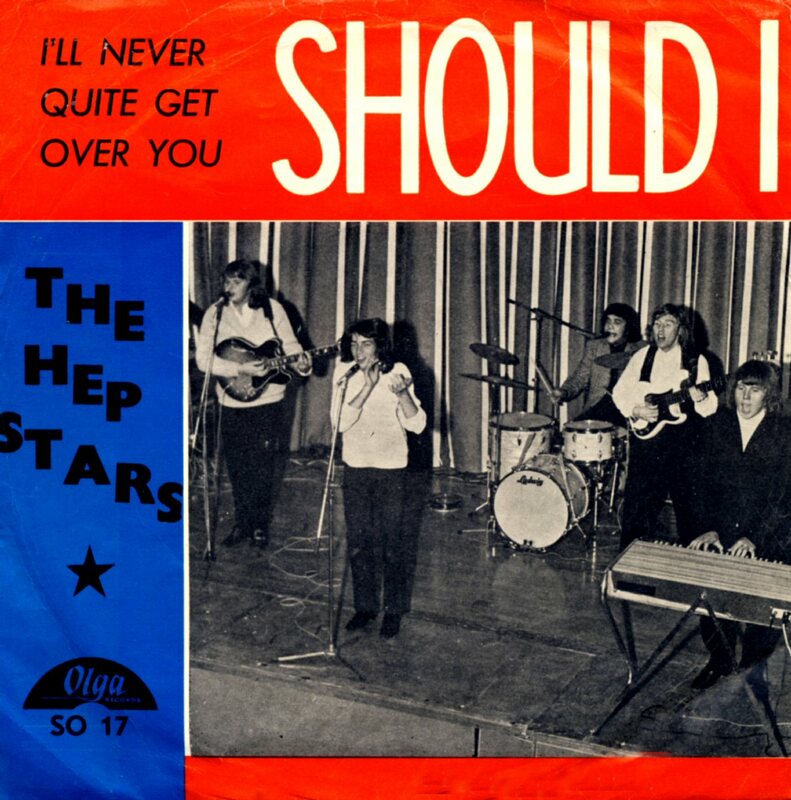 After successful years 65-69 Hep Stars popularity decreased a bit. 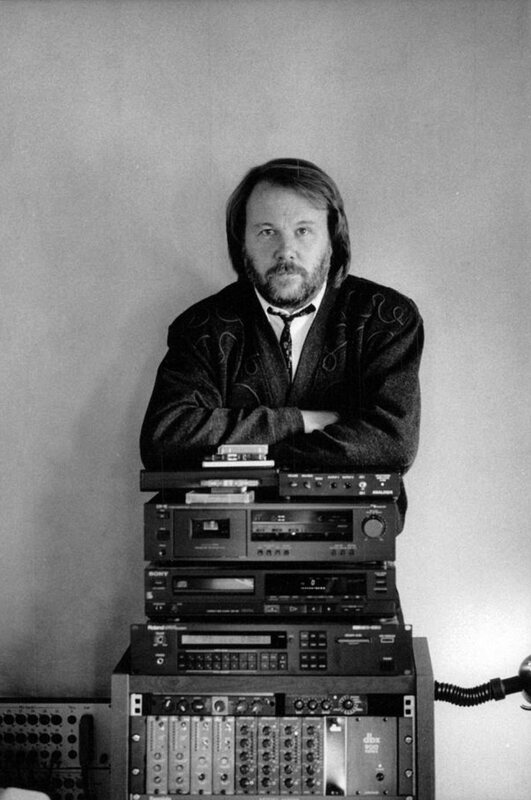 Benny and Björn were a musical duet on their own rights and more and more interested in doing own music. 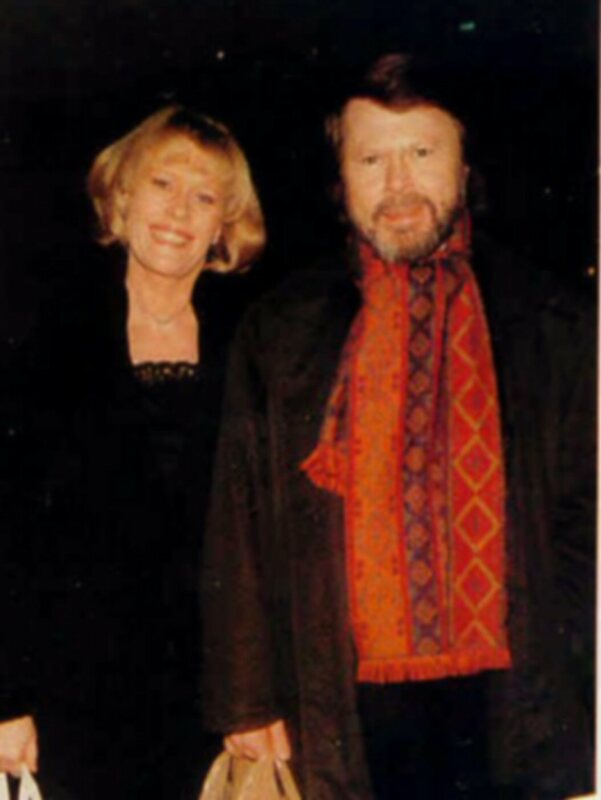 The two last compositions of Andersson/Ulvaeus were released in April 1969. 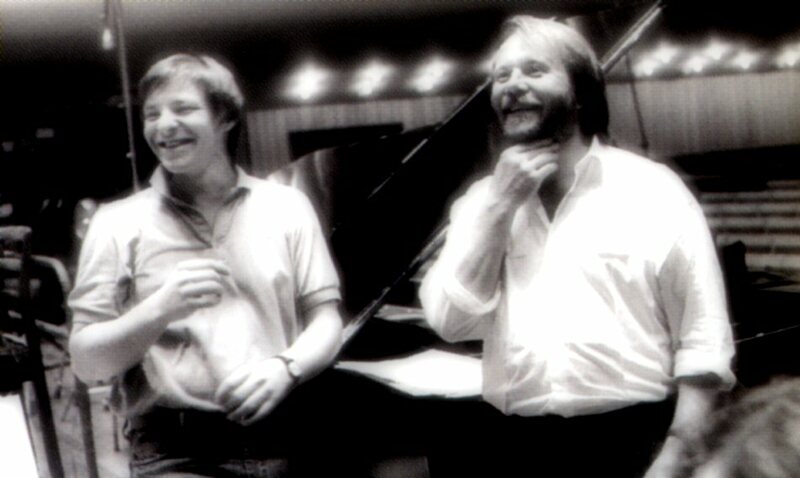 The two new Andersson/Ulvaeus songs were "Speleman" and "Precis som alla andra". The single entered the Swedish chart first 3 months after its release and stayed there for only 4 weeks reaching #10. 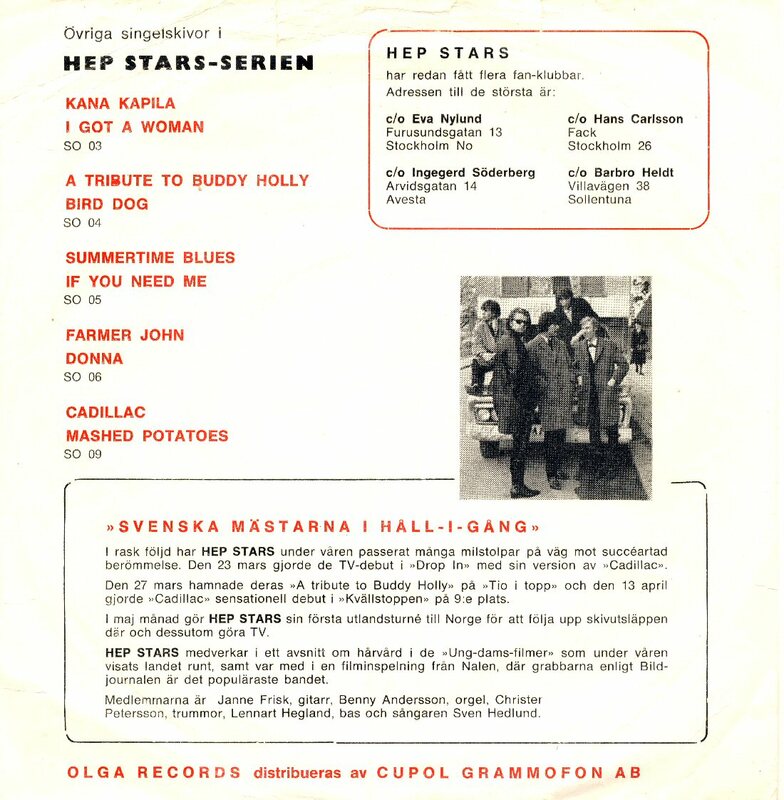 Hep Stars gave their last concert in Stockholm on August 31, 1969. 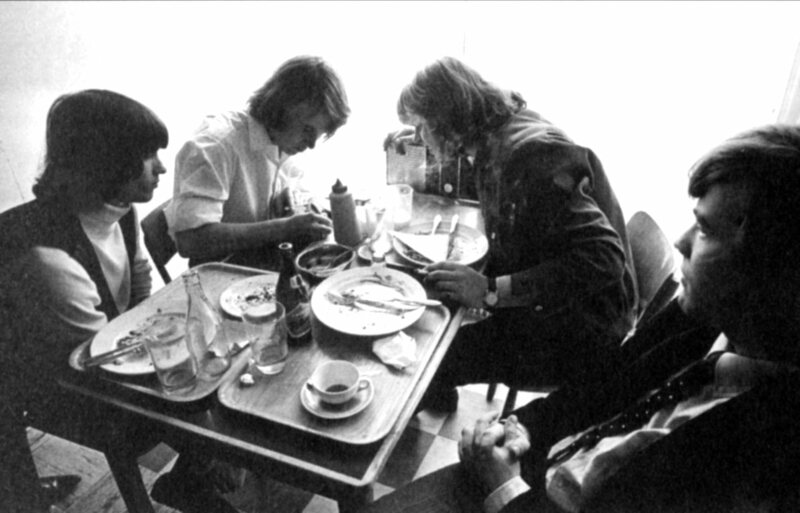 In the autumn 69 Benny, Björn, Svenne & Lotta and Finn Alberth embarked on their own tour in Sweden. 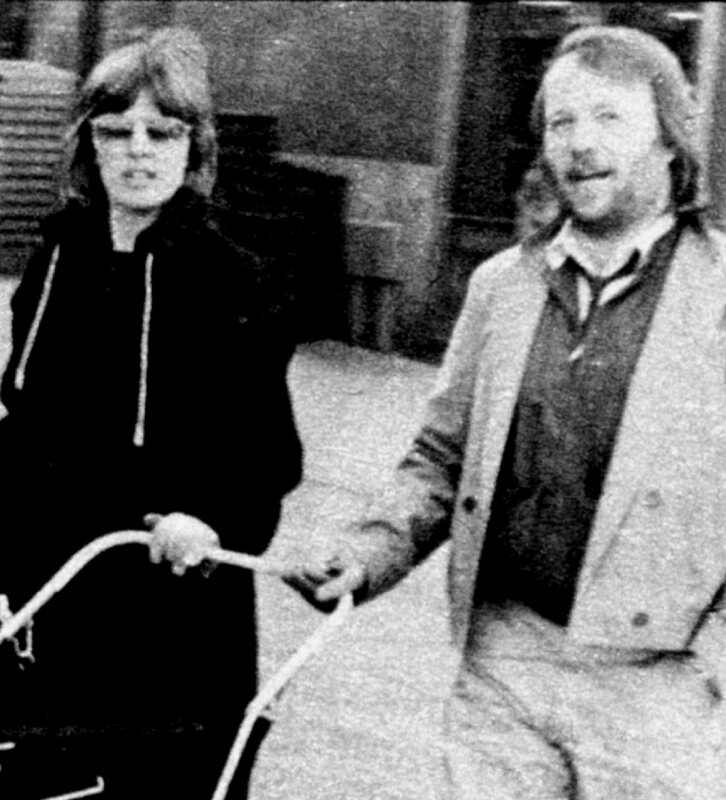 The collaboration between Benny, Björn and Svenne & Lotta would continue under many years to come. Read about Benny & Björn's cooperation. 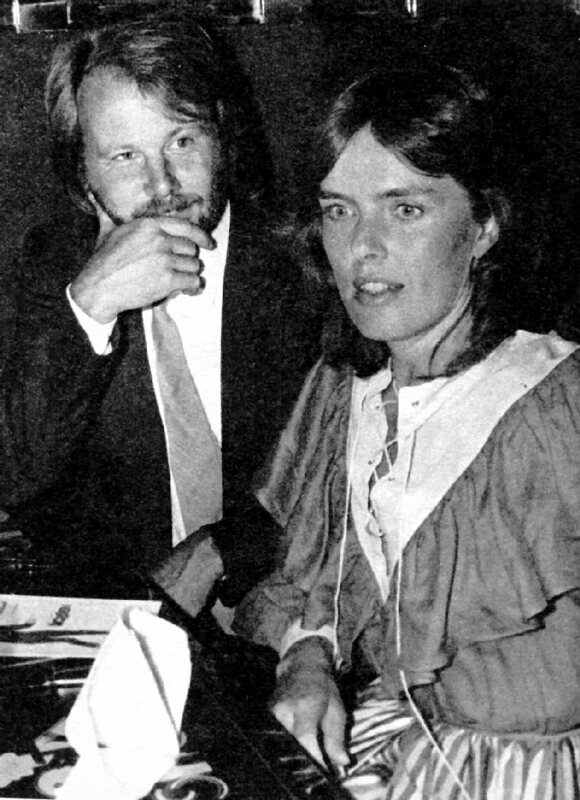 Benny divorced from Frida officially on November 26, 1981. 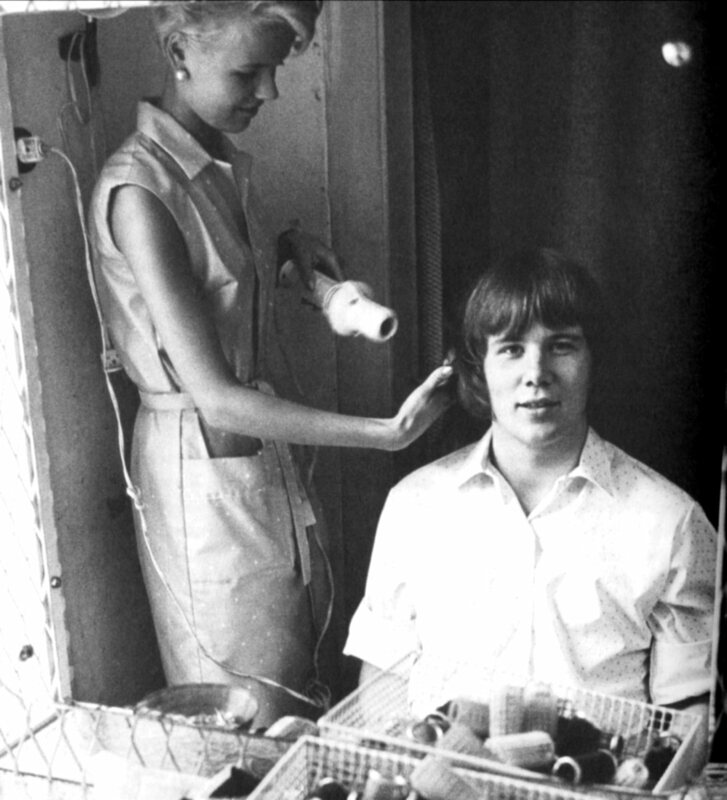 Some days later, on December 3rd, 1981 he married his girl friend Mona Birgitta Nörklit. 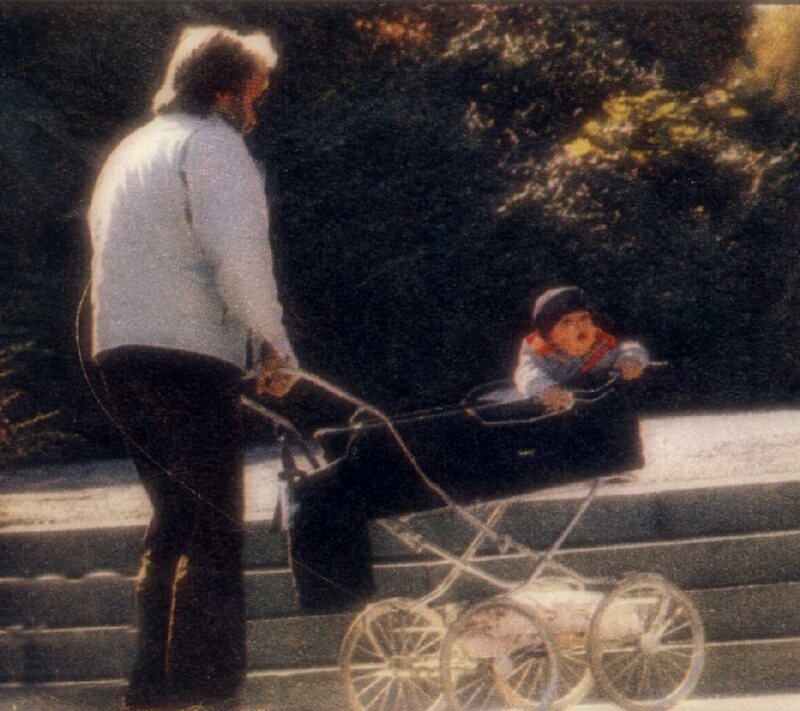 On January 10th, 1982 Mona gave birth to their son Ludvig Mats Vilhelm. 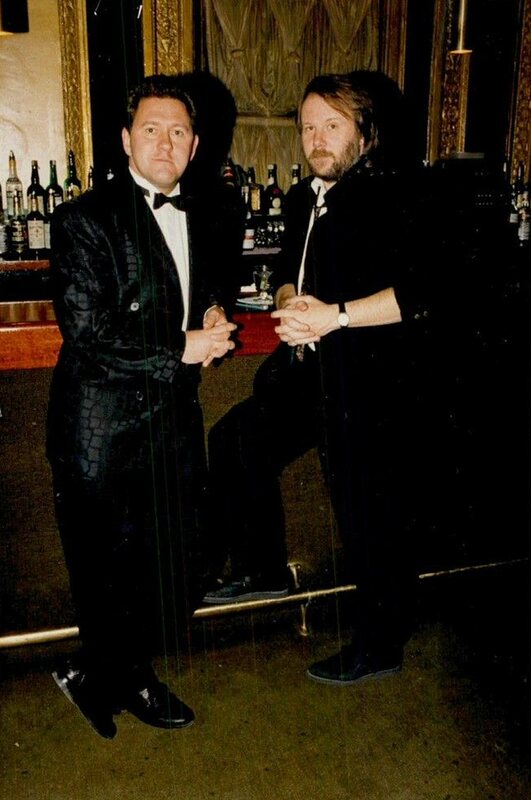 After the ABBA period Benny and Björn continued working together. 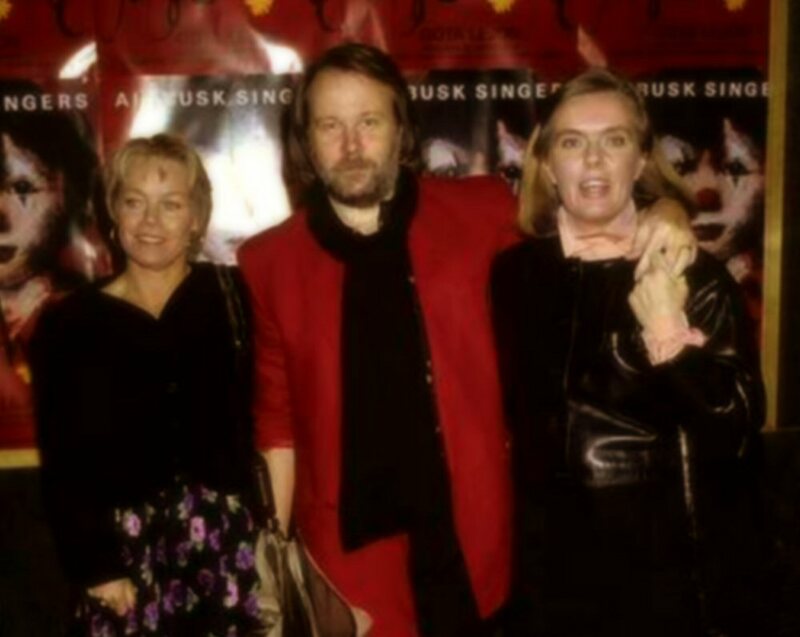 They have written two musicals: Chess (1984) and Kristina från Duvemåla (1995) as well as music for other artists: Gemini, Josefin Nilsson. 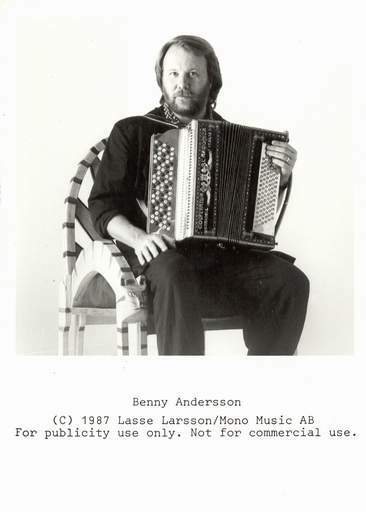 But Benny's biggest passion is Swedish folk music. 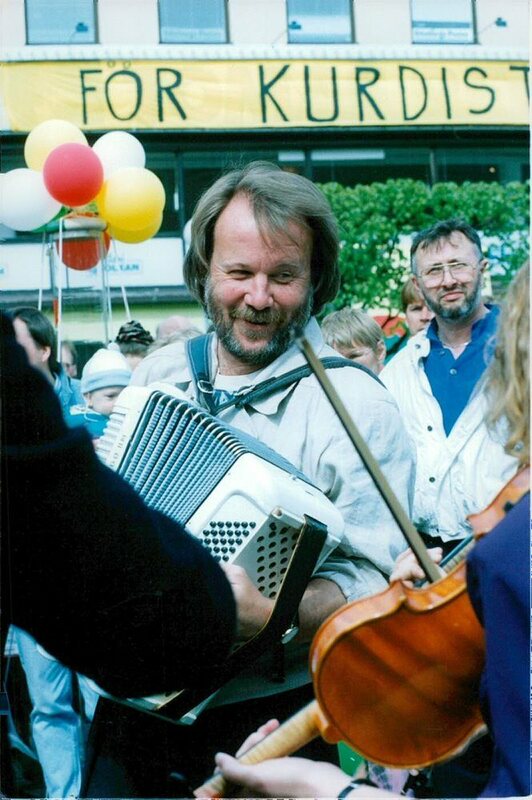 In the 1980s he met the folk group Orsa Spelmän and started playing with them. This friendship would be the second most important musical friendship in his life. 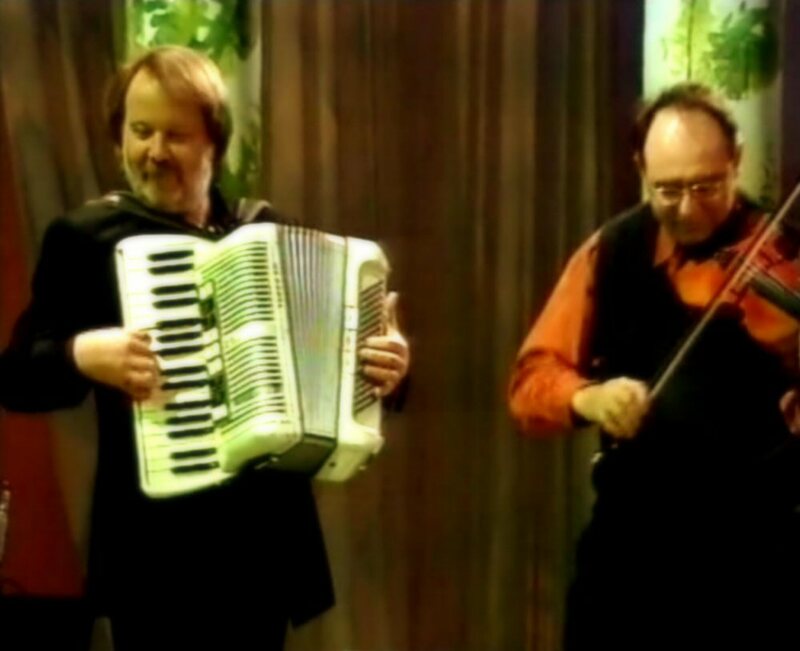 Benny and Orsa Spelmän have recorded several albums during the 80s and 90s. 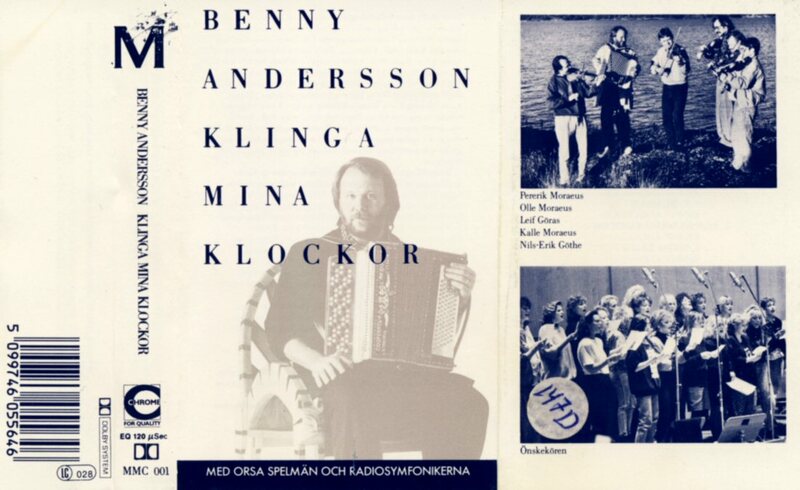 Benny released his first solo album entitled "Klinga mina klockor" in Sweden at the end of October 1987. 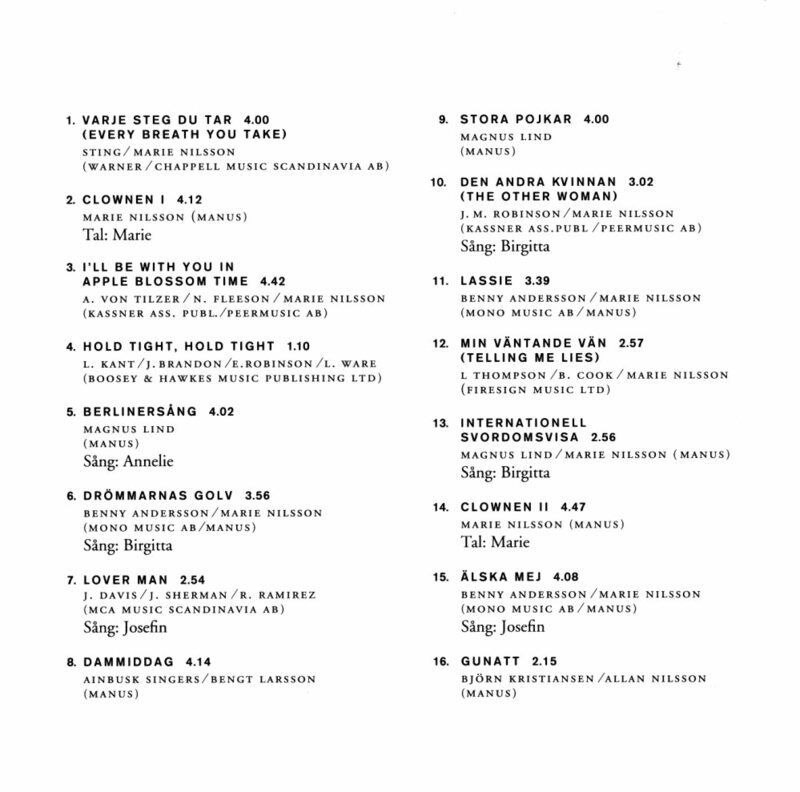 The album contained 12 compositions - most of them instrumental performed together with the Swedish folk group Orsa Spelmän. 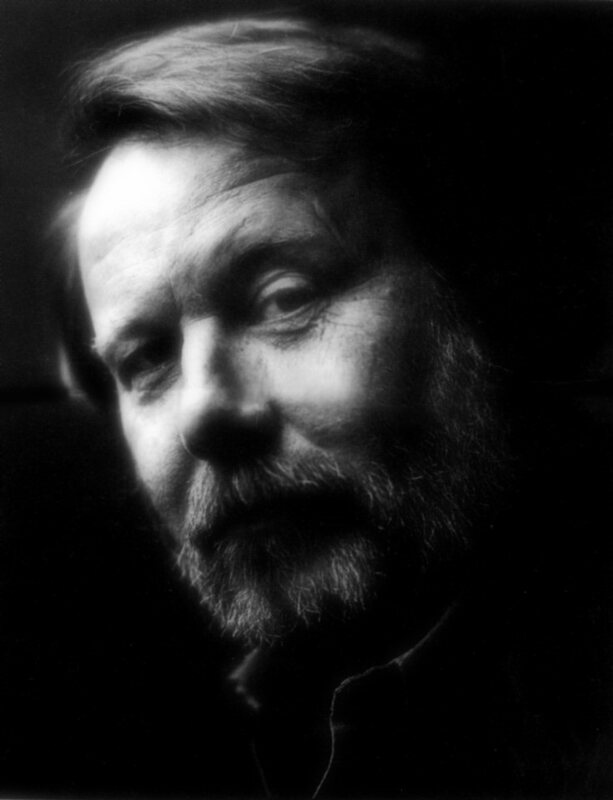 Several compositions co-written by Björn Ulvaeus. 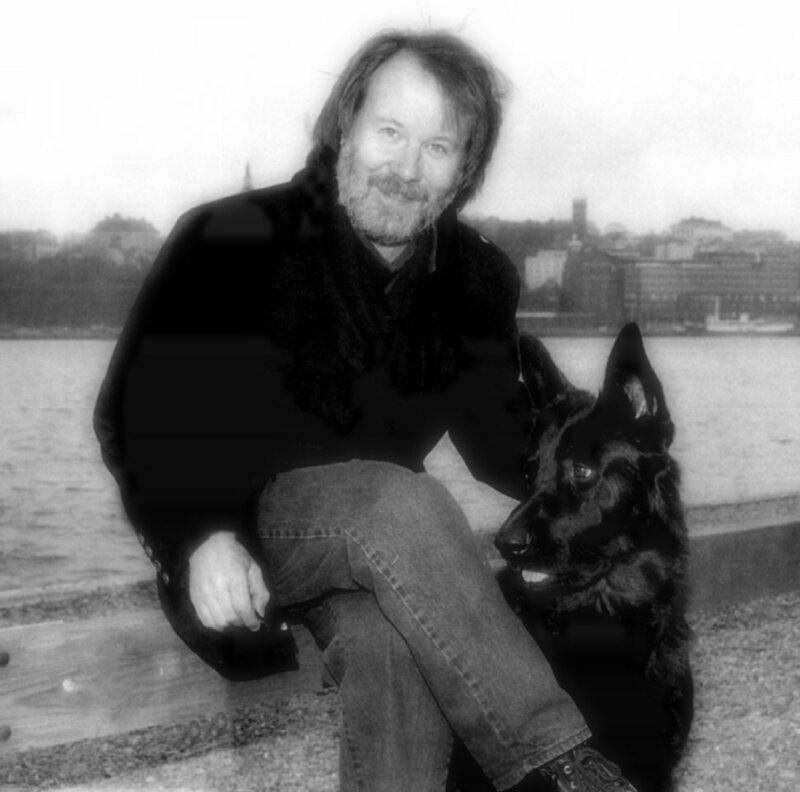 Tommy Körberg performed the song "Efter regnet" and "The Choir on Demand" the title song with lyrics written by Björn Ulvaeus. 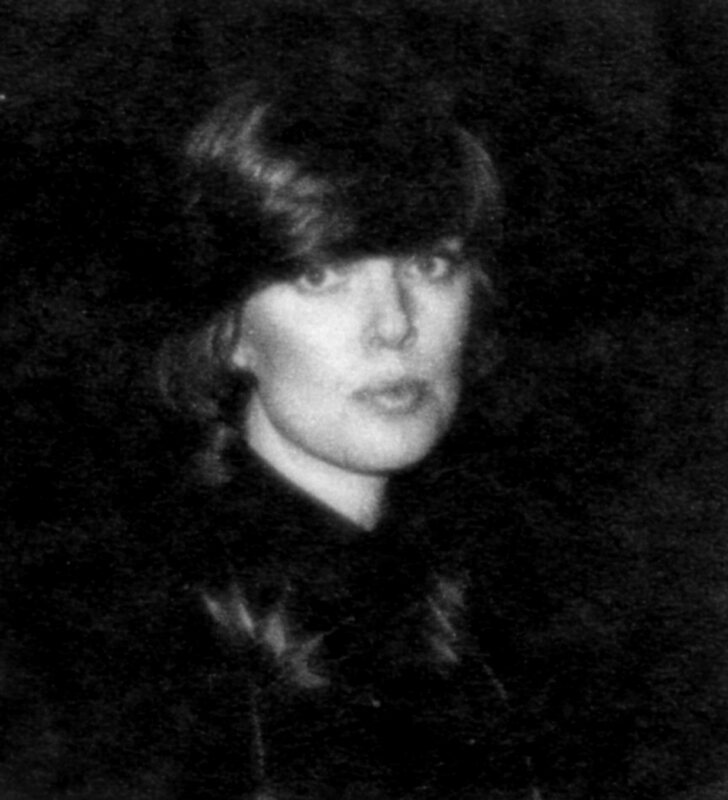 "The Choir on Demand" featured 21 female singers and among them Anni-Frid Lyngstad (see below). 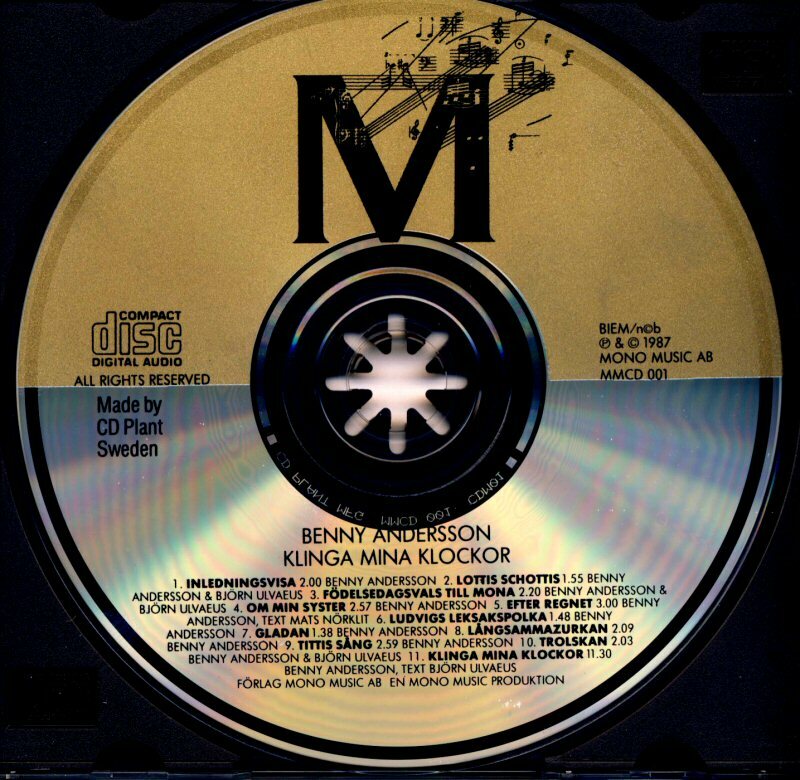 The album "Klinga mina klockor" entered the Swedish chart on November 25th, 1987 and stayed there for 20 weeks peaking at #6. It was released as LP, CD and MC. 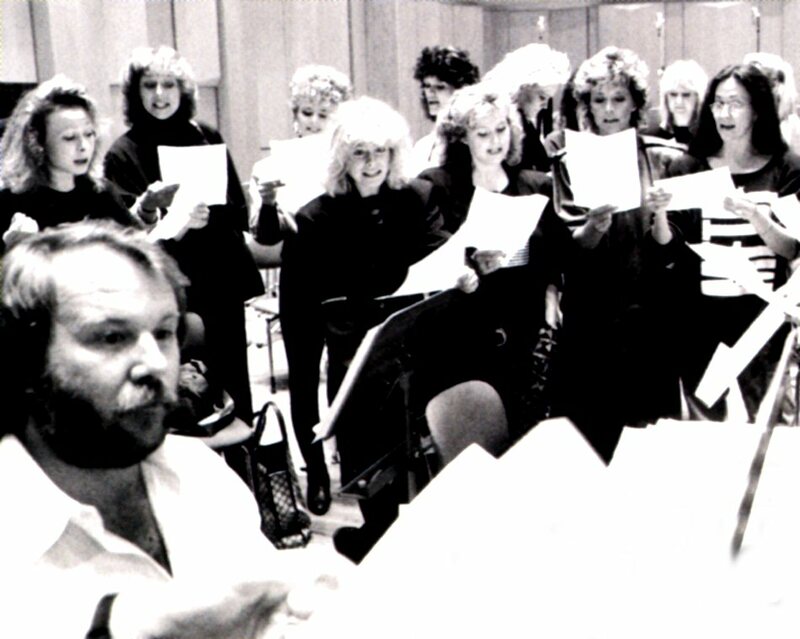 The three former members of ABBA: Björn, Benny and Anni-Frid met each other again as musicians in October 1987 in Berwaldhallen recording Benny & Björn's new composition "Klinga Mina Klockor" which was the title song on Benny's new LP. 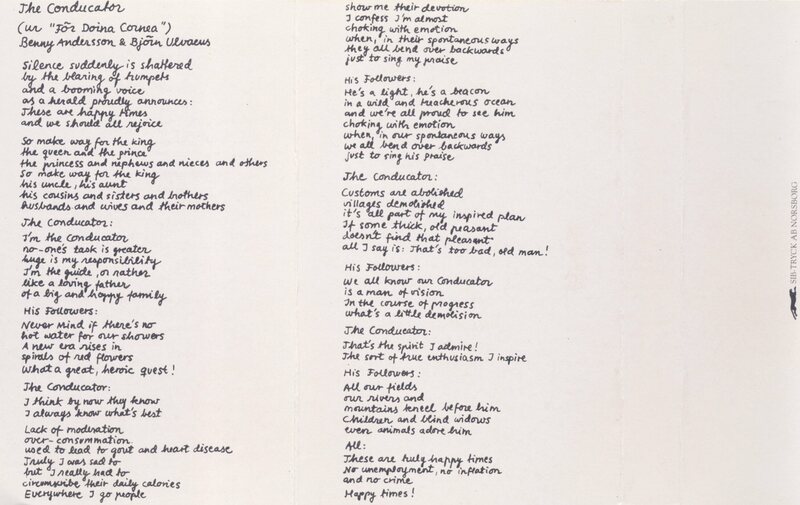 Frida was one of the singers invited by Benny to the female choir. 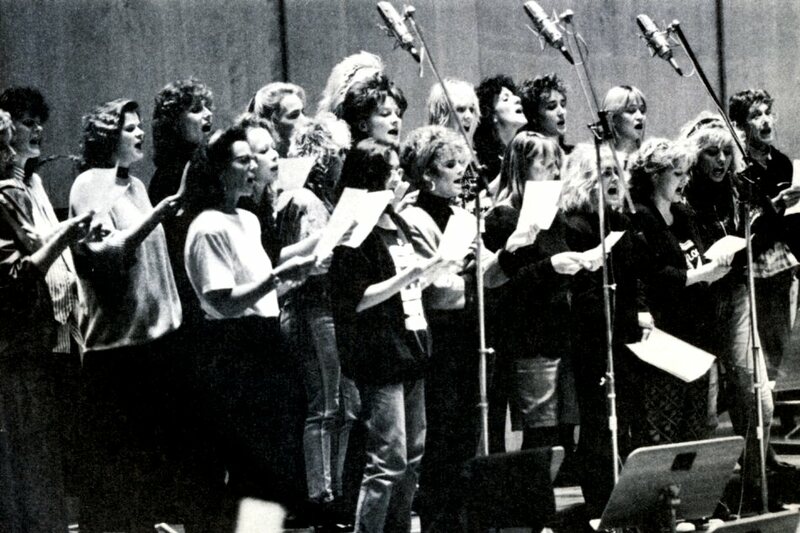 The choir were: Una Andersson, Eva Dahlgren, Yvonne Erlandsson, Monica Forsberg, Ingela Forsman, Karin Glenmark, Maritza Horn, Anna-Lotta Larsson, Mia Lindgren, Johanna Lundberg, Frida Lyngstad, Siw Malmkvist, Nanne Nordqvist, Diana Nunez, Lena Philipsson, AnneLie Rydé, Barbro Svensson, Monica Svensson, Pernilla Wahlgren, Angelique Widengren & Liza Öhman. 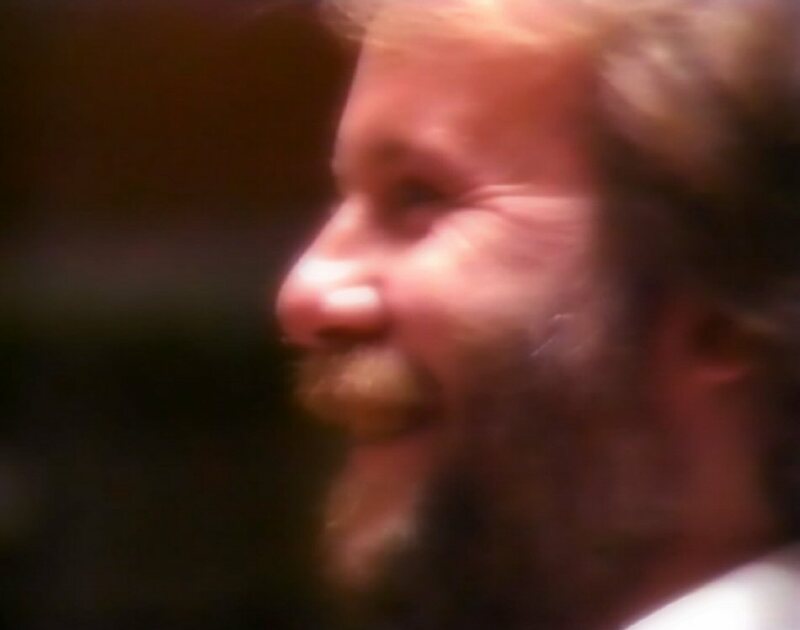 Swedish TV filmed recording of the title song at Berwaldhallen in Stockholm. 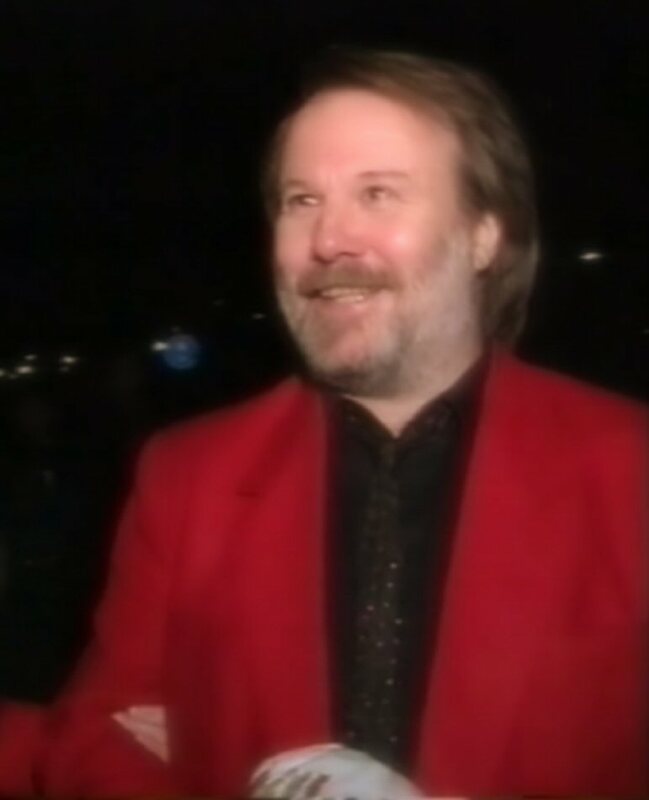 Benny promoted his album appearing on the TV special "Jacobs Stege" in November 1987 and talking about the album. 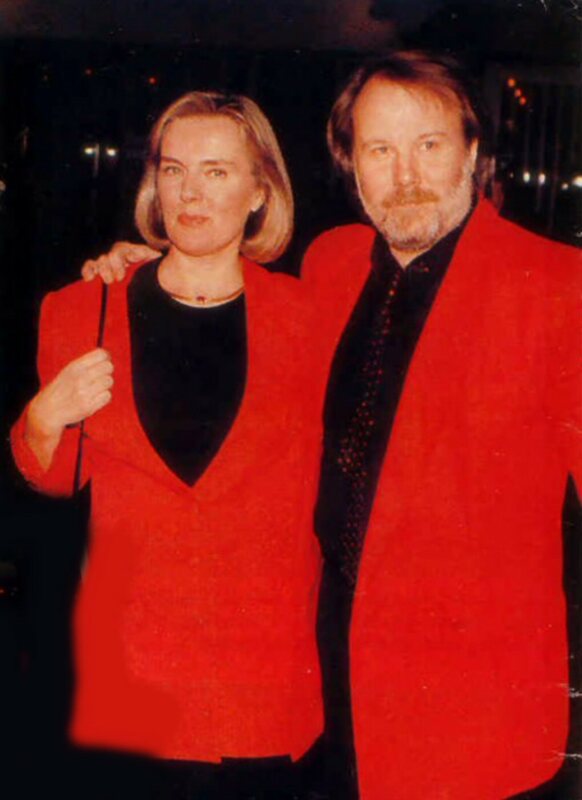 Karin Glenmark and Tommy Körberg performed the song "Efter regnet" from the album "Klinga mina klockor". 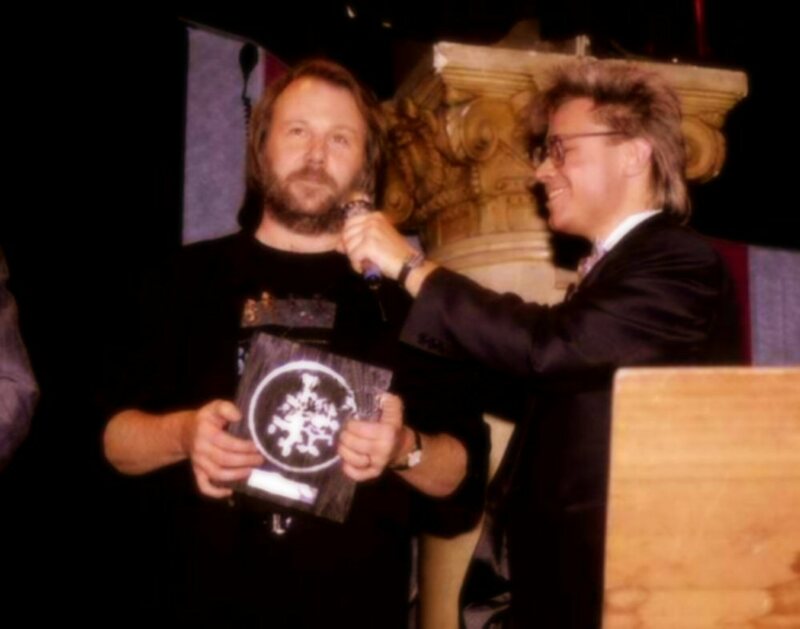 Benny and Orsa Spelmän were awarded with Grammy (Sweden) for the album "Klinga mina klockor" at the beginning of 1988. 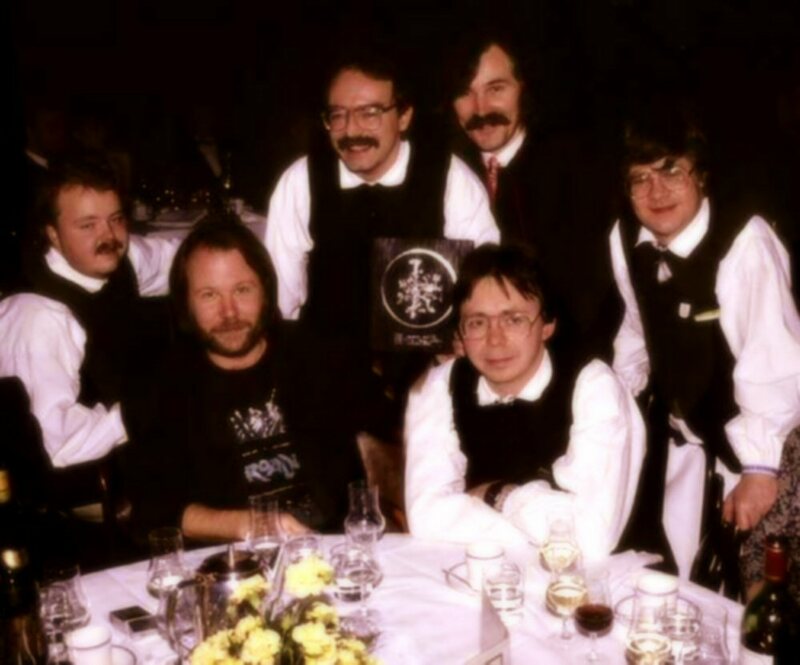 The award category was the best folk music album of the year. 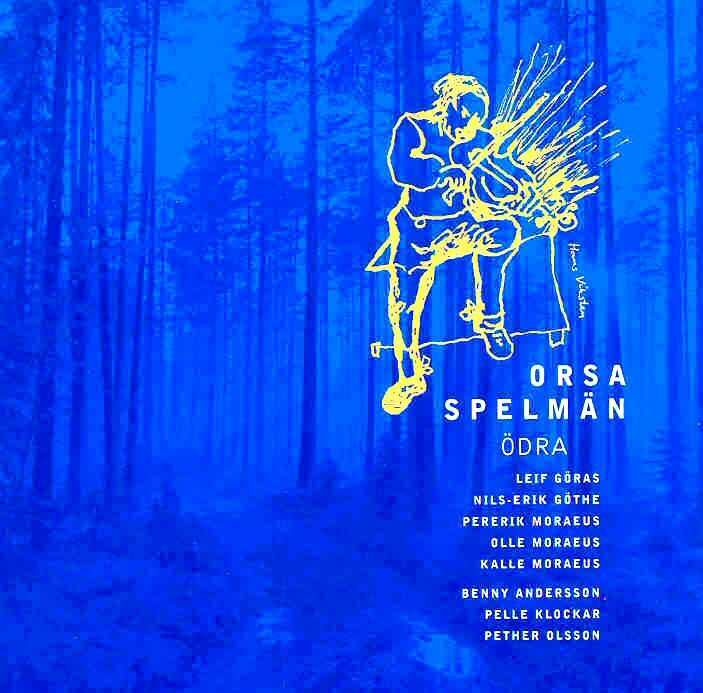 Next musical project was the first real cooperation with Orsa Spelmän. 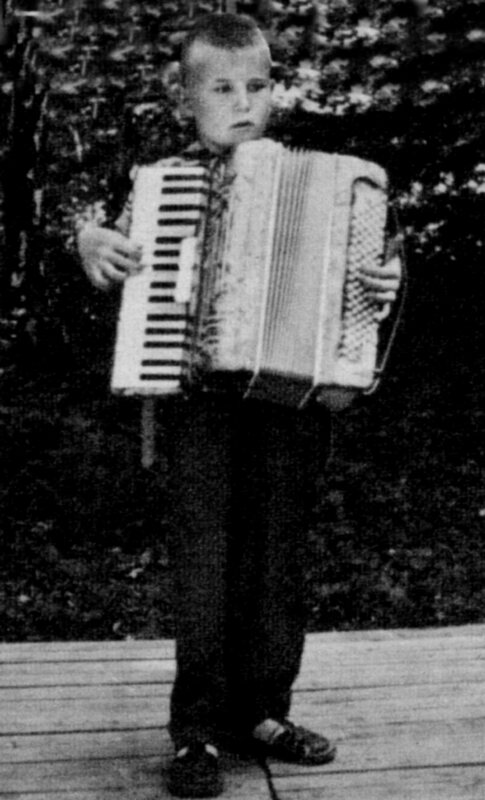 Benny produced their new album and played accordion and synthesizer on it. 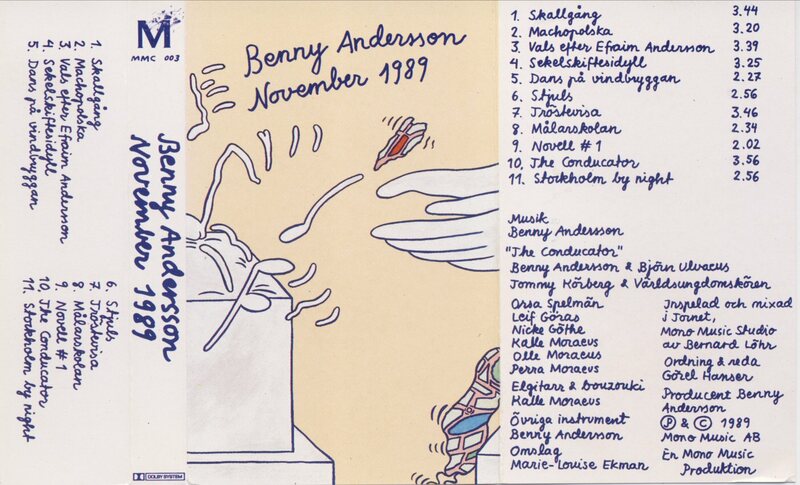 Benny's solo album "November 1989" featured 10 instrumental compositions and one song "The Conducator" performed by Tommy Körberg with lyrics written by Björn. The album was released in November and became a big success in Scandinavia receiving Swedish Grammy Award in February 1990. 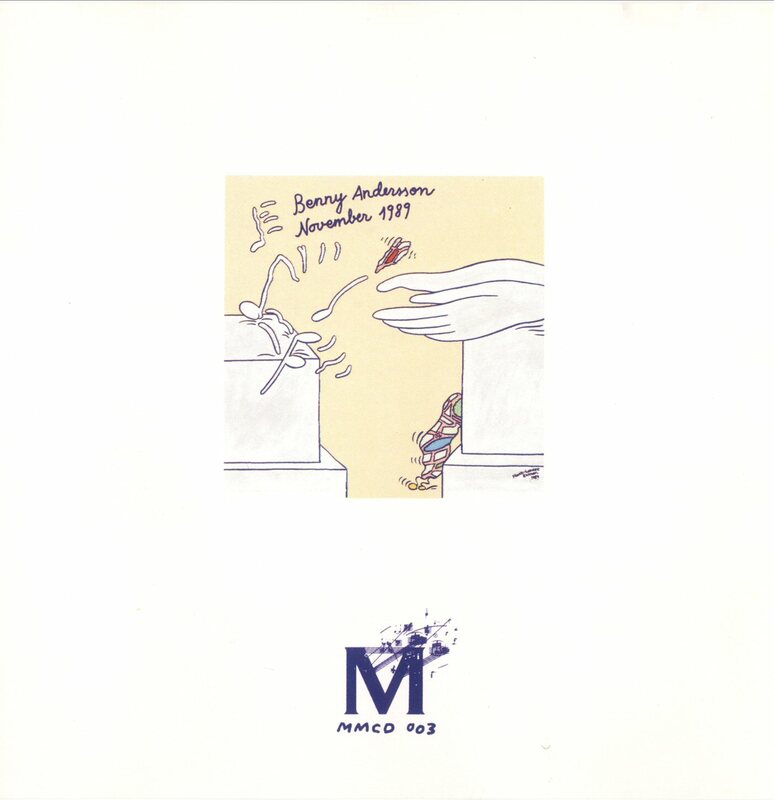 "November 1989" was available as LP, CD and MC. 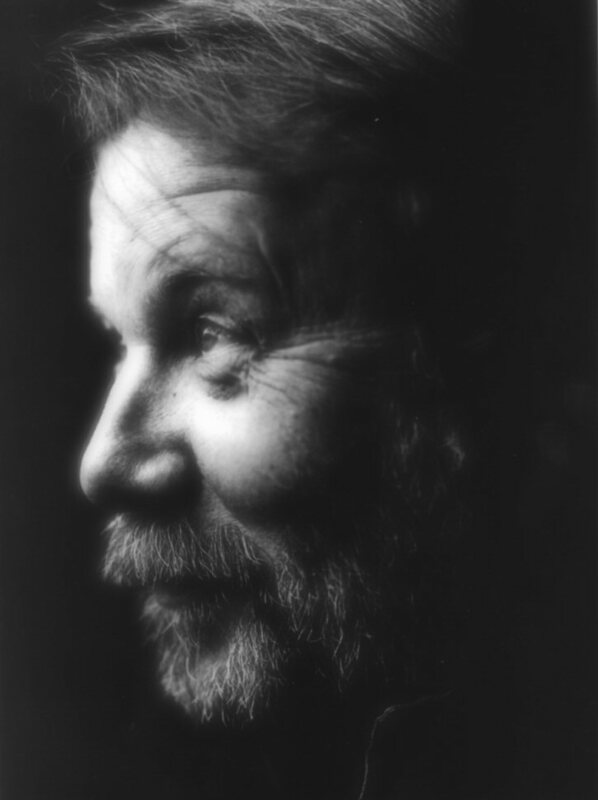 Benny posed for promotional photo sessions. 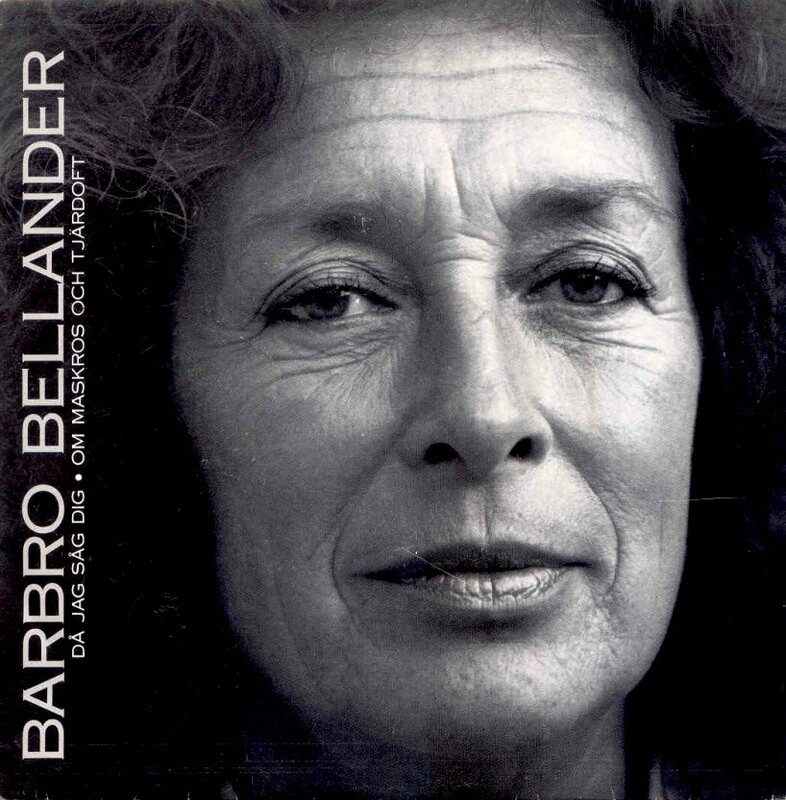 Benny produced a single recorded by his friend a female folk singer Barbro Bellander. 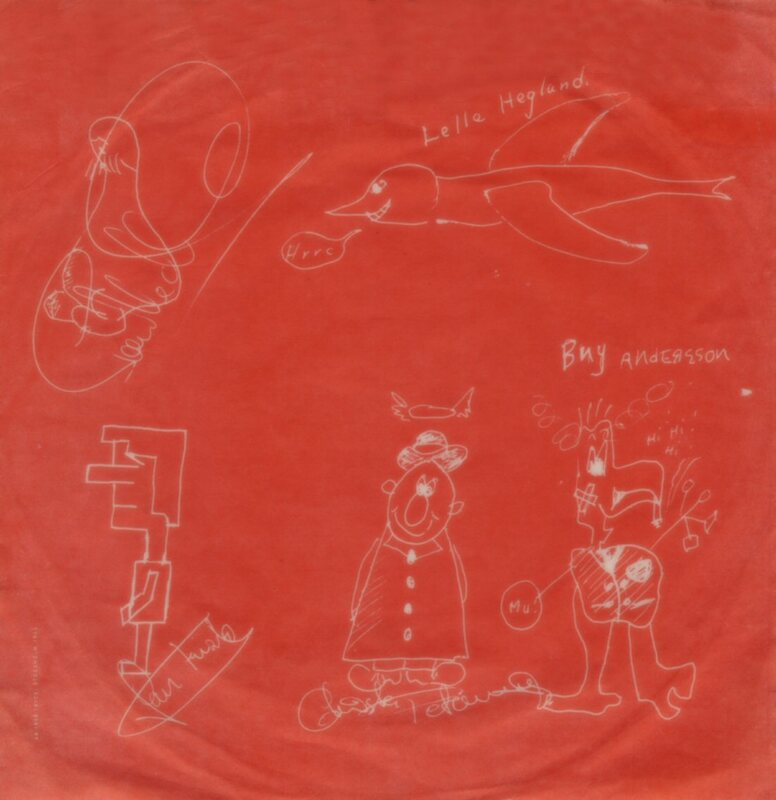 The single was released by Mono Music in 1989. 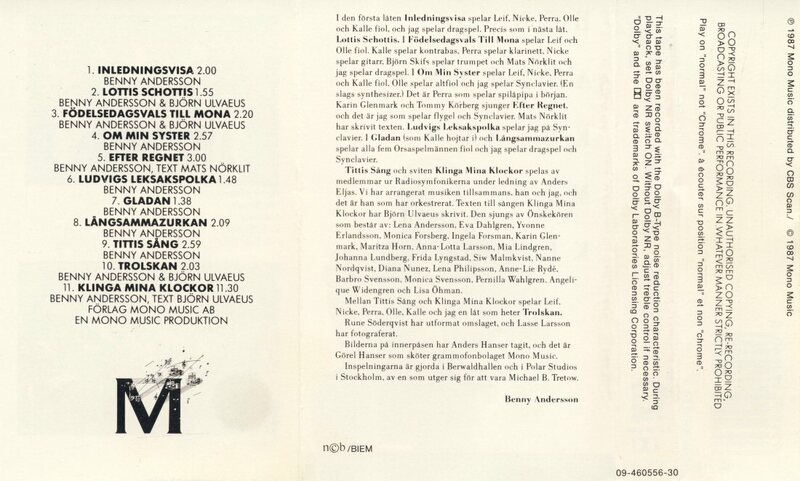 In 1990 Benny played together with Orsa Spelmän on 7 tracks on the album "Fiolen Min" (My Violin). 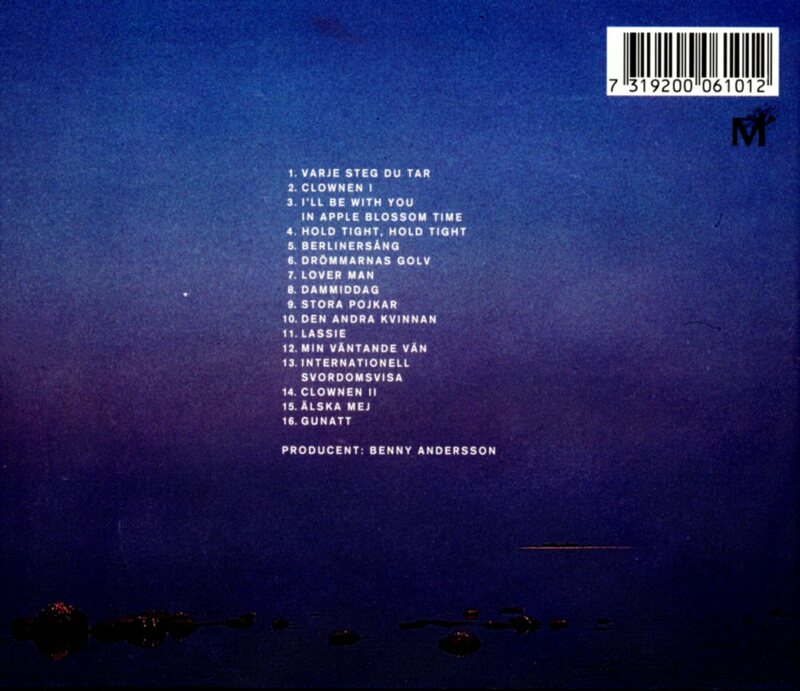 Benny even produced the album which was released by Mono Music. 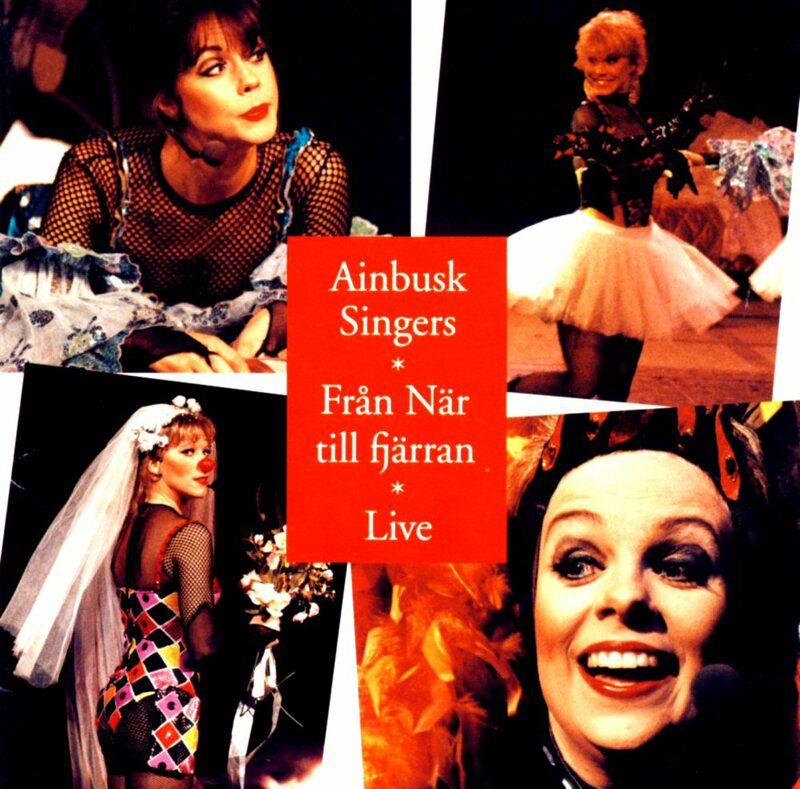 The cabaret-pop group Ainbusk Singers based on the Gotland Island in southern Sweden was very popular in Sweden at the beginning of 1990s with their shows. 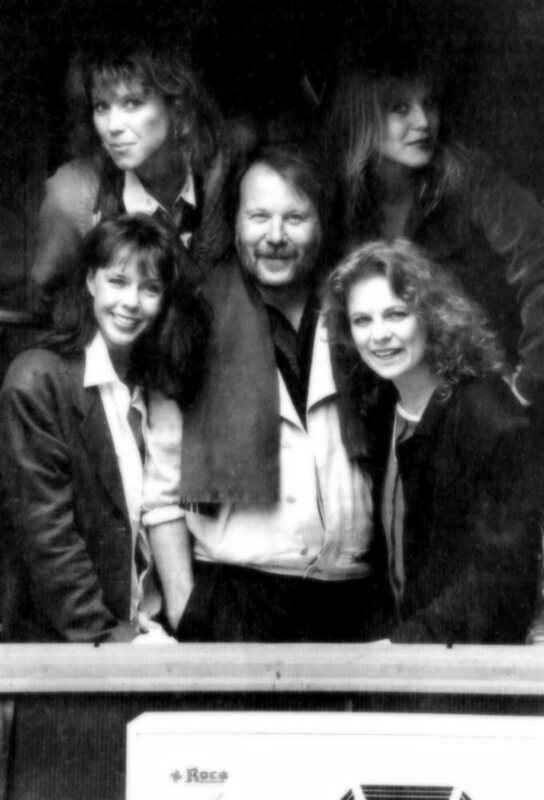 The four-girl-group featuring the sisters Nilsson (Marie and Josefine) and Birgitta Jakobsson and Annelie Roswall brought Benny's attention already in 1988 when he saw them on TV. 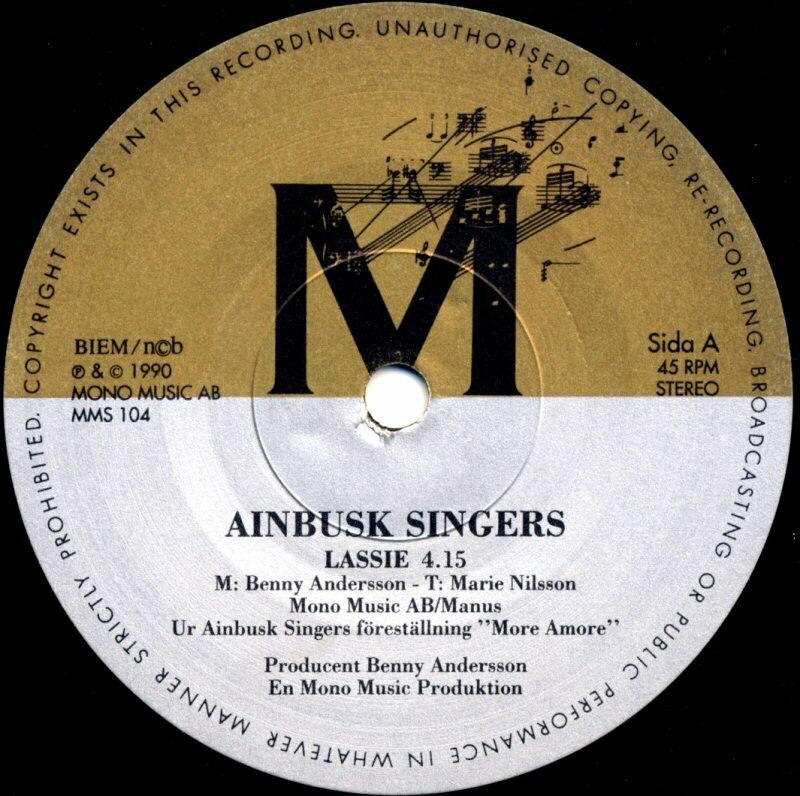 But first in August 1990 Benny invited Ainbusk Singers to the recording studio where they recorded the composition "Lassie" with music written by Benny and lyrics by Marie Nilsson. 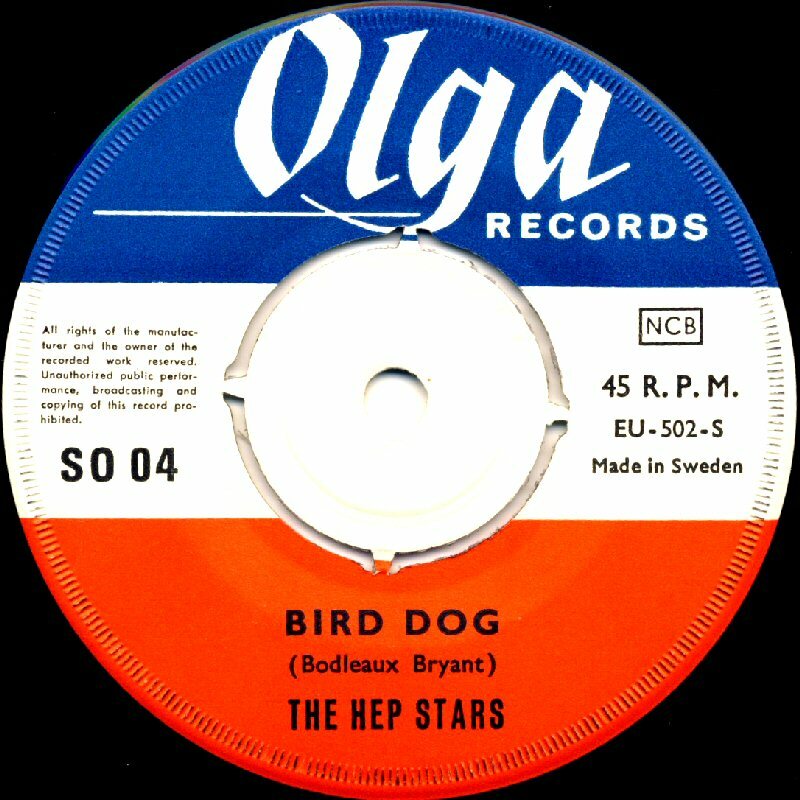 The single was produced by Benny and featured "Lassie" b/w "Gunatt" (no Benny song) was released in autumn 1990 and it peaked at #1 on the Swedish single chart. 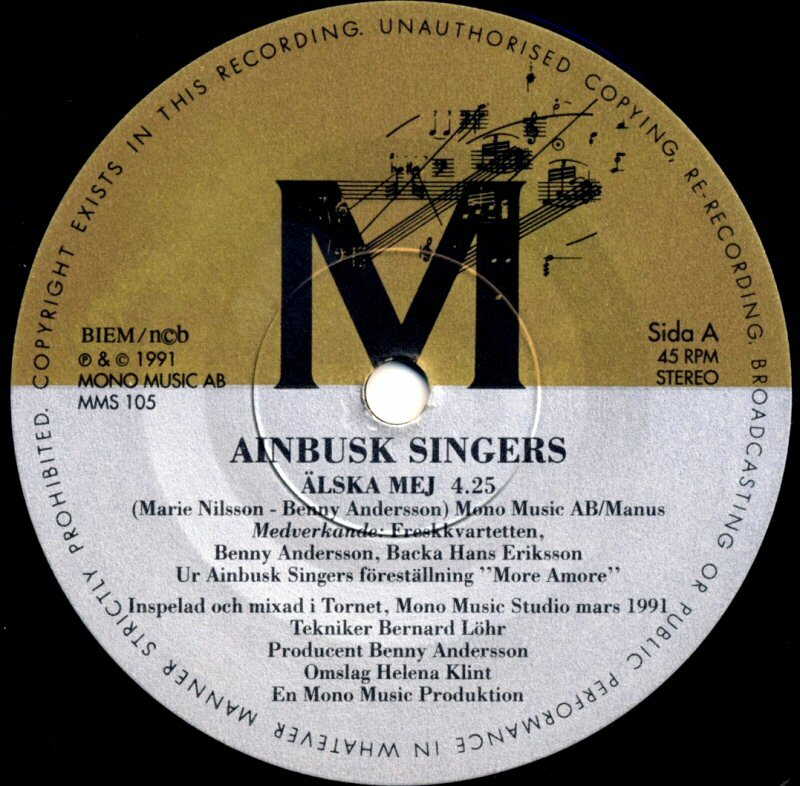 Ainbusk Singers received Gold Record in December 1990. 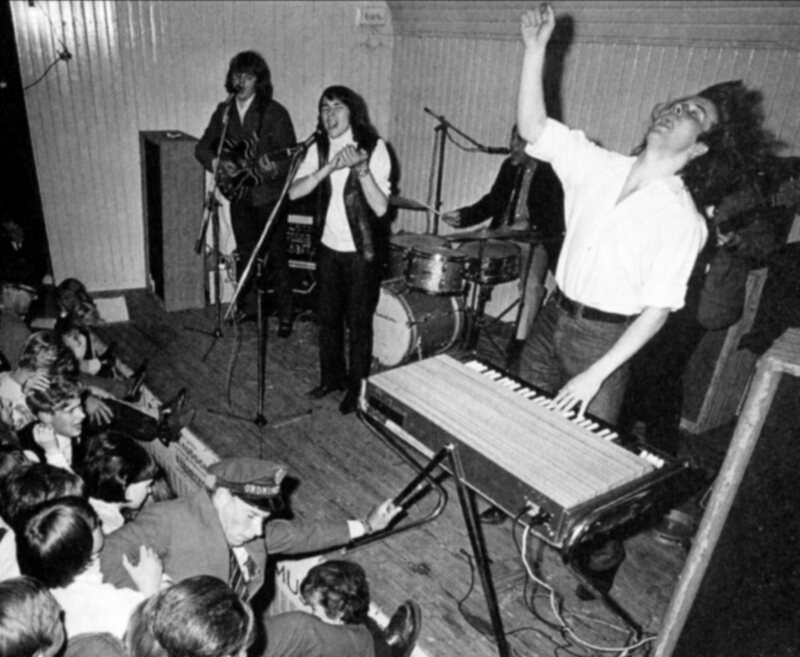 The song was performed by the group in their current stage show "More Amore". 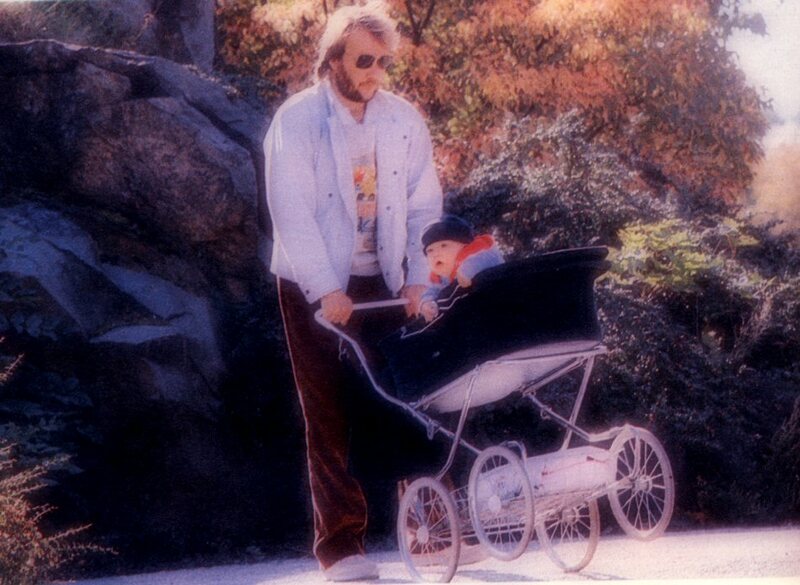 Björn and Benny wrote and produced the track for 1990 World Equestrian Games which were held in Stockholm. 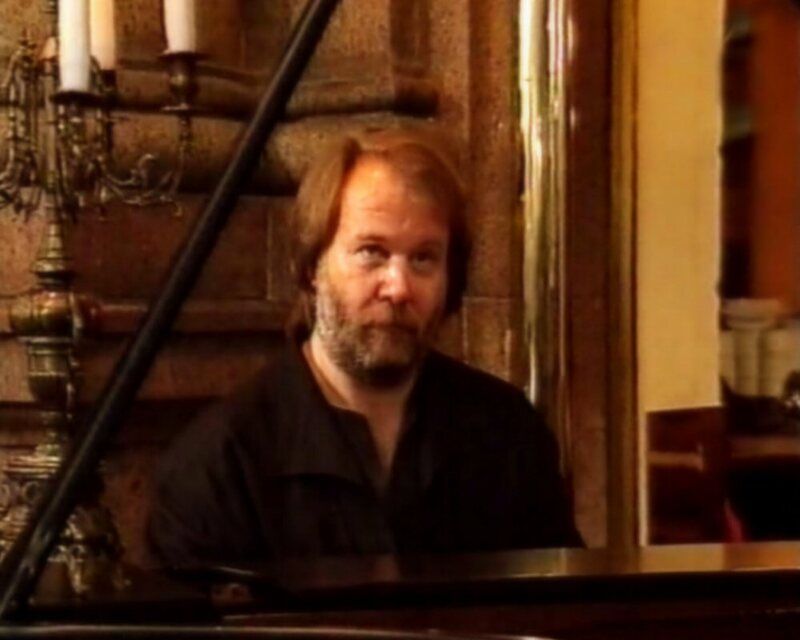 Tommy Körberg performed the song entitled "Upp till kamp". 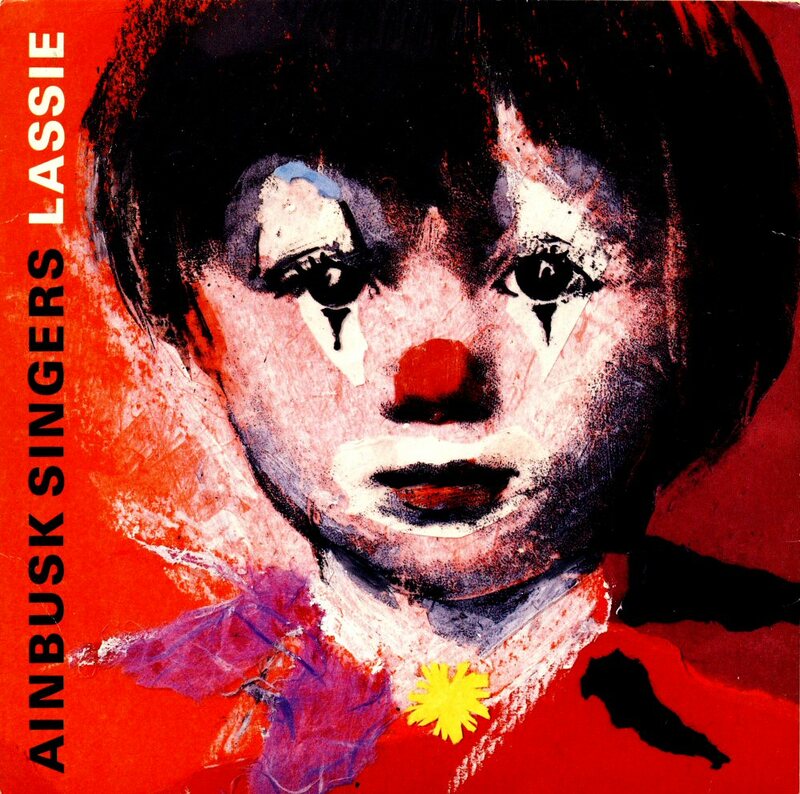 After the big success of "Lassie" Benny and Ainbusk Singers continued their collaboration. 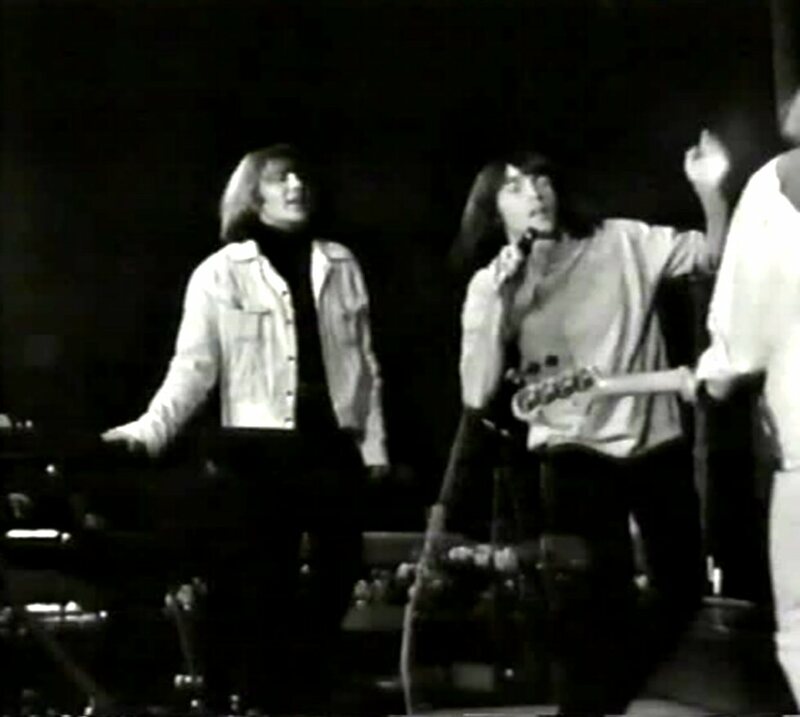 In March 1991 the group was again in Mono Music Studio where they recorded a new Benny penned title "Älska mig" (Love me). 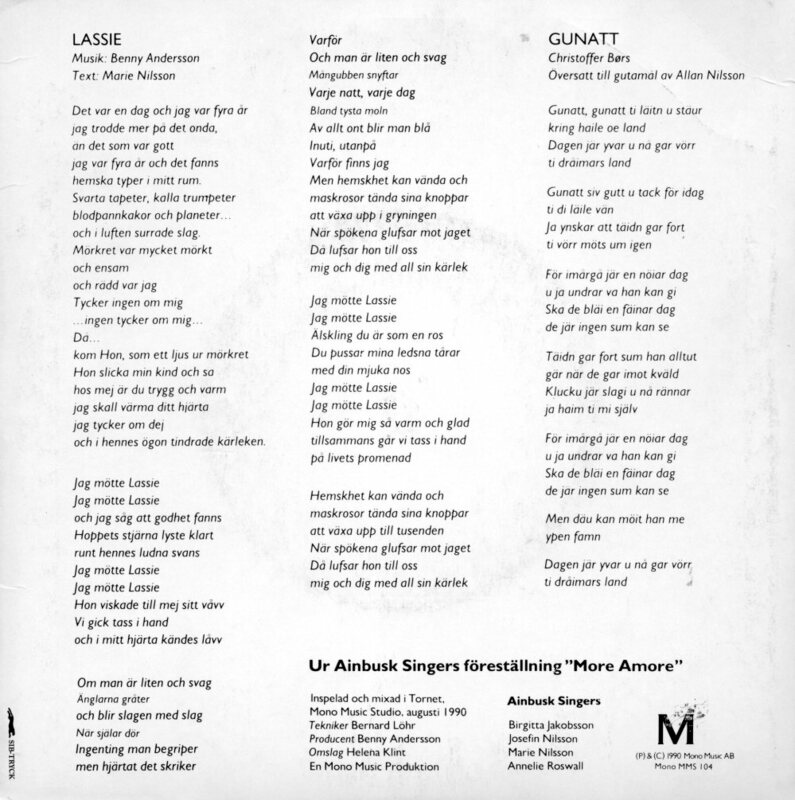 The B side of the single featured "En låt som denna" (A song like this) written by the sisters Nilsson. Benny produced the single. 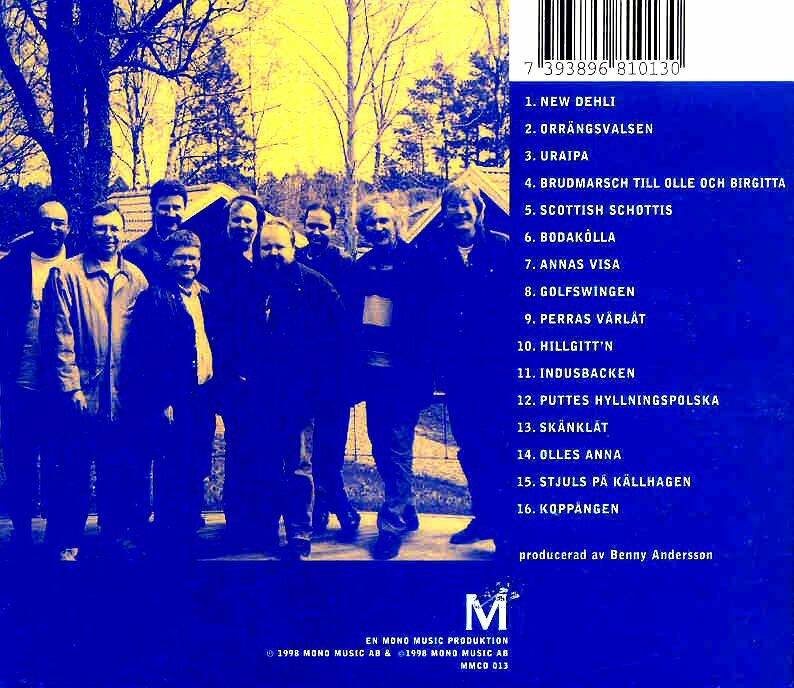 "Älska mig" entered the Svensktoppen chart in Sweden in May 1991 where it peaked at #8. 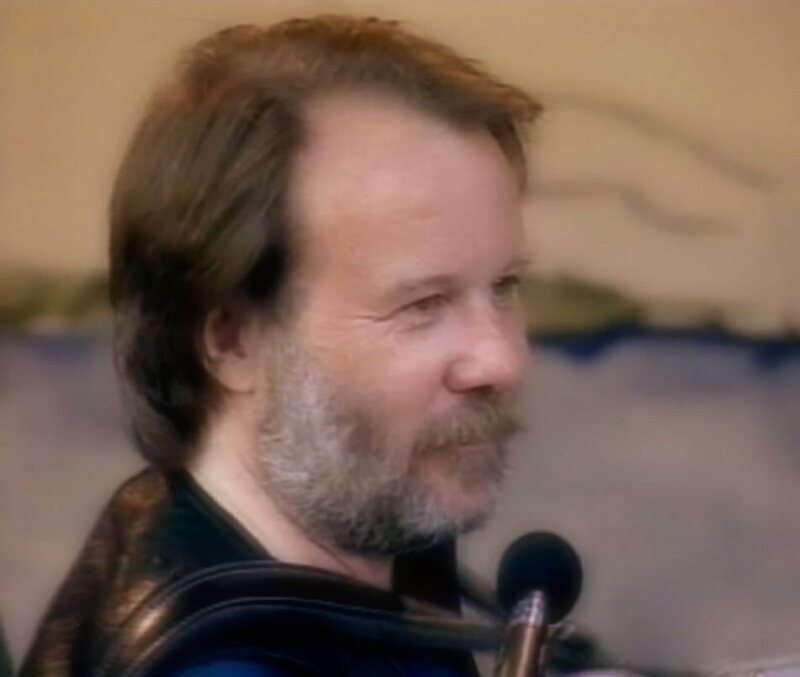 On May 27th, 1991 Benny was one of the artists perfoming at the Östermalmstorg in Stockholm during the big concert for Kurdistan. 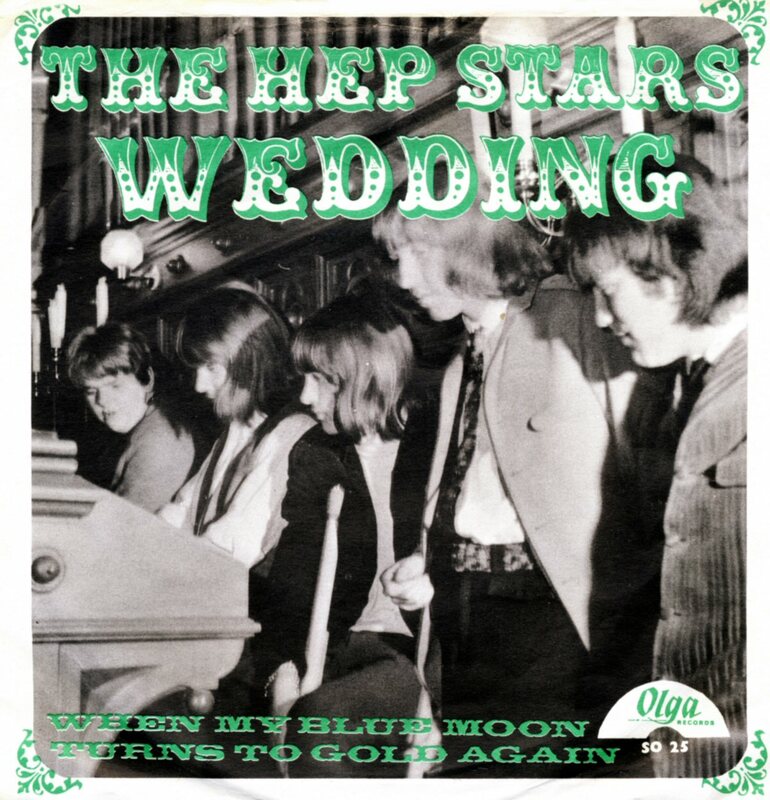 New double compilation album "Hep Stars 1964-69!" saw its release in 1992. 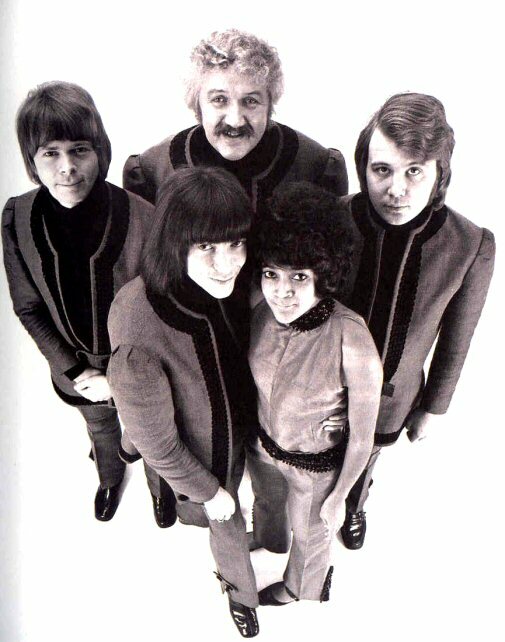 The album featured 32 songs featuring the group's hit singles and several B-sides. 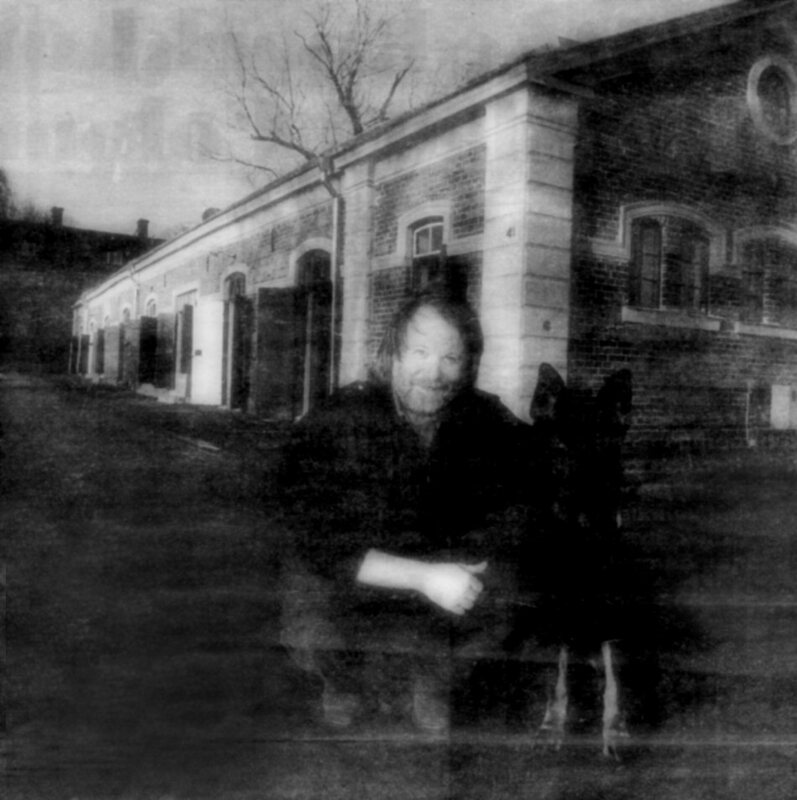 Benny moved to his new studio on the island Skeppsholmen in the heart of Stockholm at the beginning of 1993. 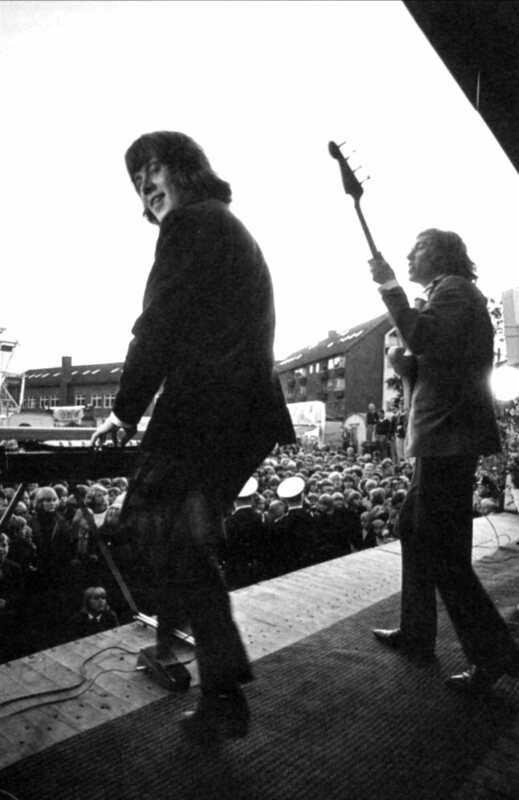 Even the Mono Music office, the record company and the employees moved to Skeppsholmen. 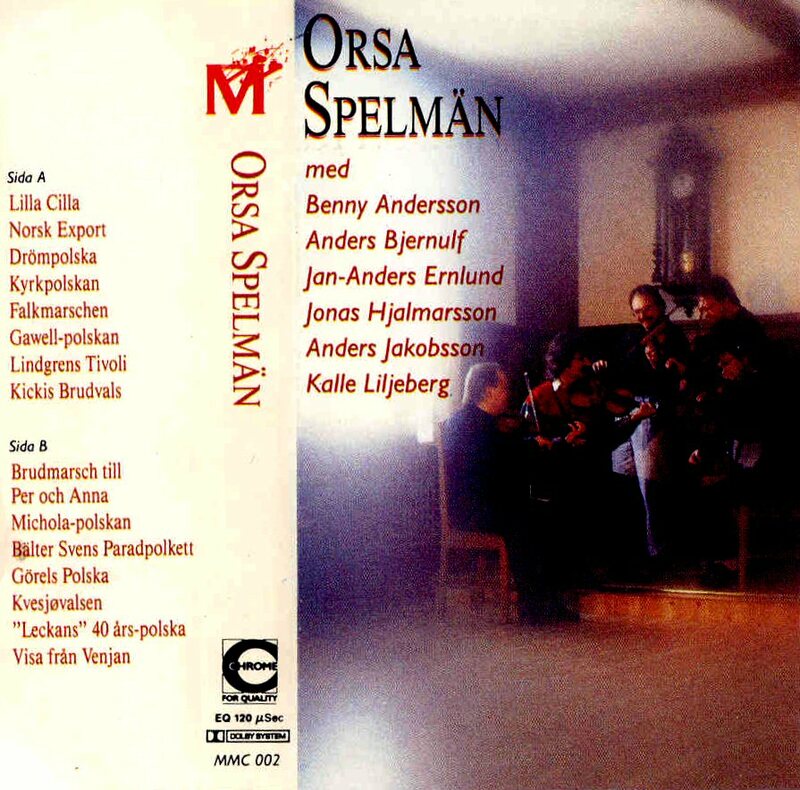 In the summer 1993 Benny and Orsa Spelmän performed live in Vitabergsparken (White Mountain Park) in Stockholm performing some of their pieces of music including "Klinga Mina Klockor" sung by a girl choir from Stockholm. In 1993 Benny continued collaboration with Ainbusk Singers. 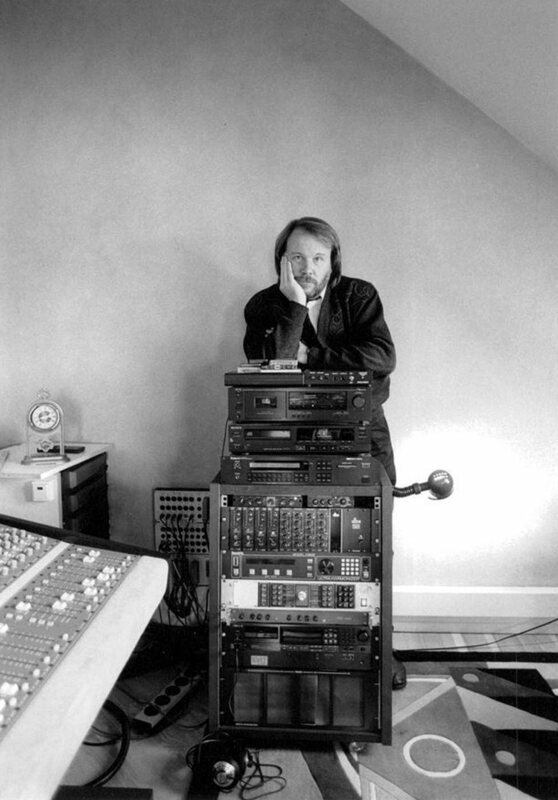 He produced a new CD recorded live in July 1993. 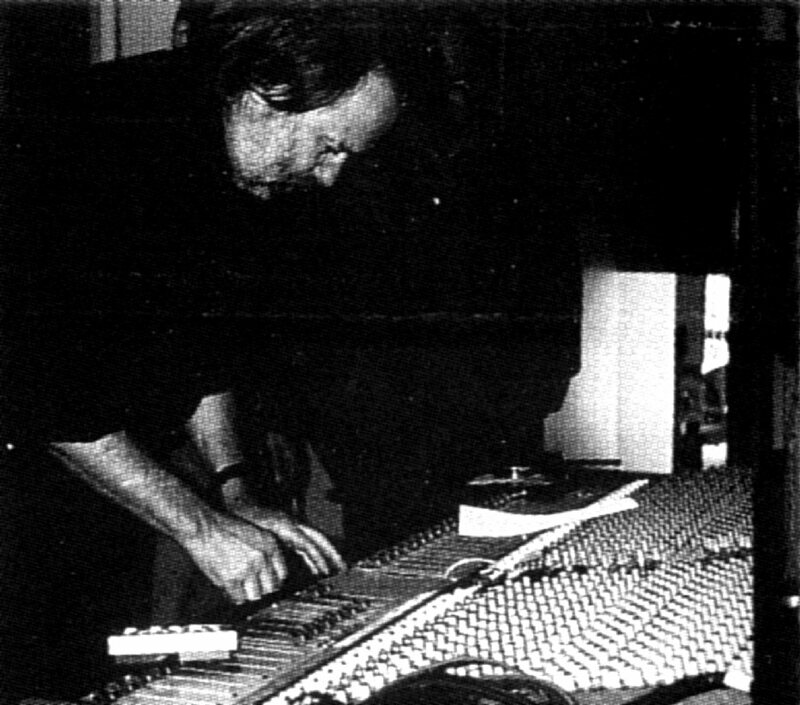 Material for the CD was mixed at Polar Studios in September and October 1993. 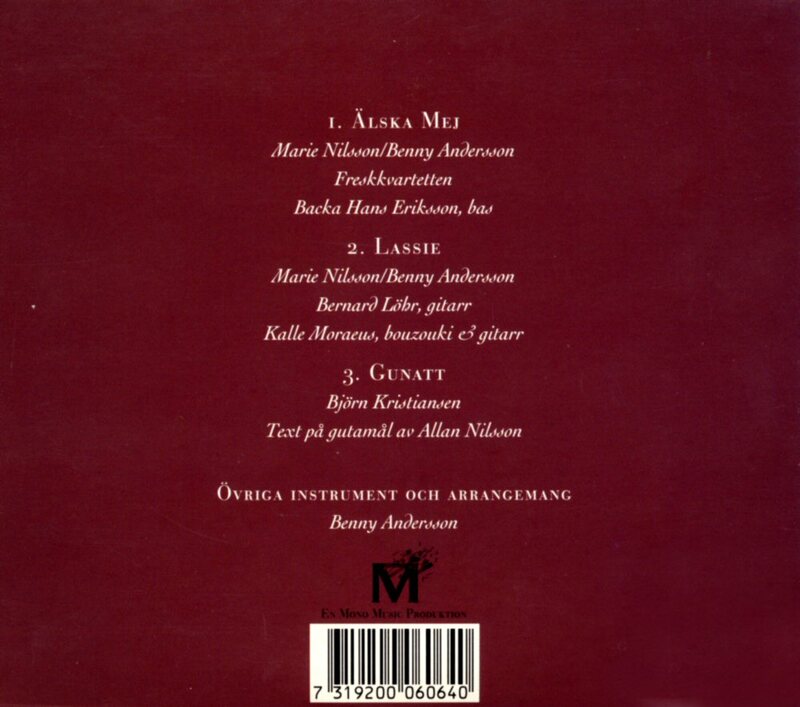 The album featured three songs written by Benny: "Lassie" and "Älska mig" as well as a brand new, previously unreleased composition performed by Birgitta and entitled: "Drömmarnas golv". The CD was released at the end of 1993 by Mono Music. 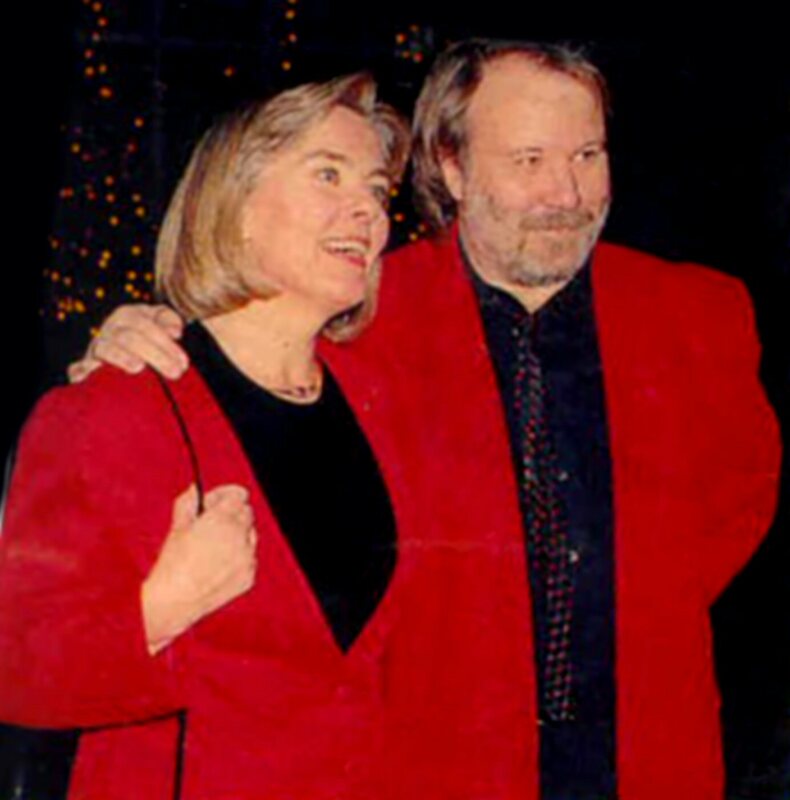 There was more Ainbusk related musical collaboration in 1993. 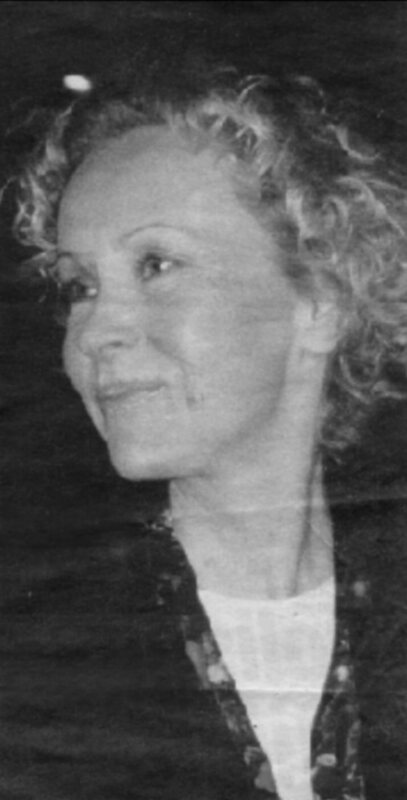 One of the band members - Josefine Nilsson recorded her first solo album which was produced by Benny and Björn - see: Björn and Benny 1993. 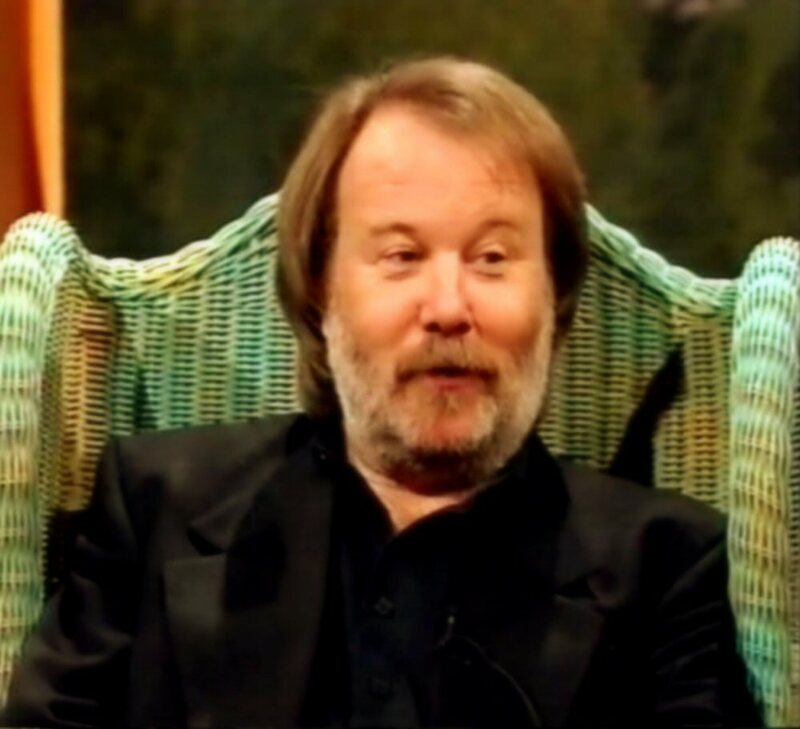 Benny appeared on Swedish TV together with the poet Inger Alfvén in a special "Fönsterbord mot Kungsträdgården" (Window table with view on Kungsträdgården) in which he played two own compositions. 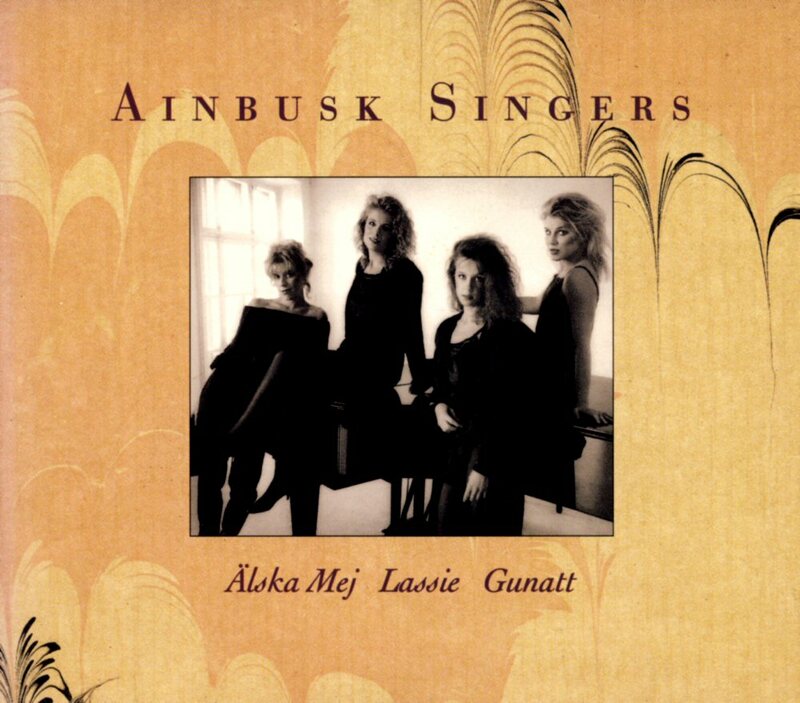 Mono music released a special three-track CD single with "Älska mig", "Lassie" and "Gunatt" from the two Ainbusk Singers singles released in 1990 and 1991. 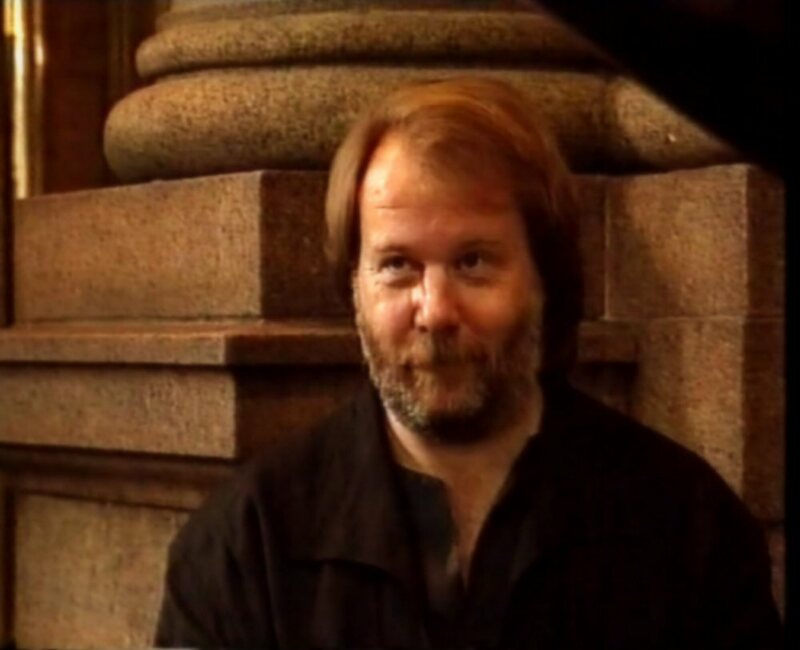 In 1996 Benny received "The Intelligence Prize" from a Swedish paper "Månads Journalen". 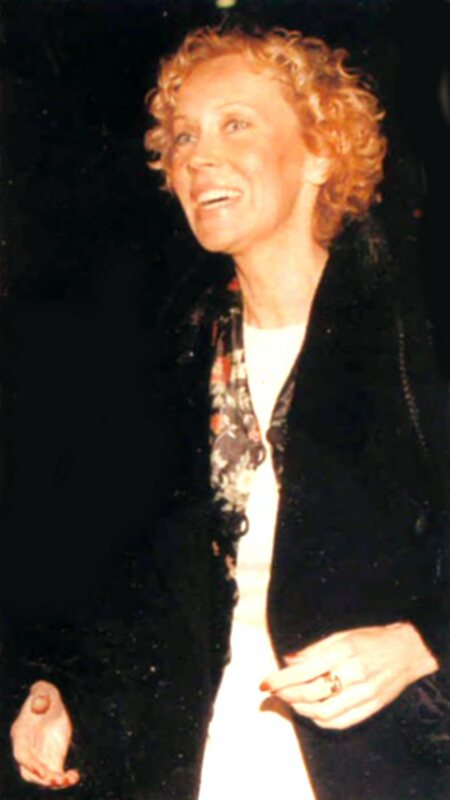 A big interview followed the prize in June 1996. 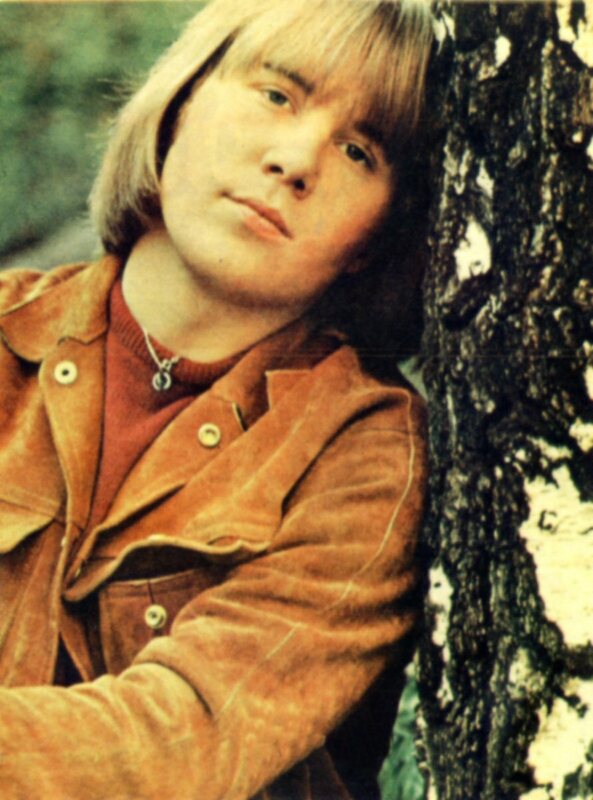 The article about Benny's life, Kristina från Duvemåla and ABBA time. 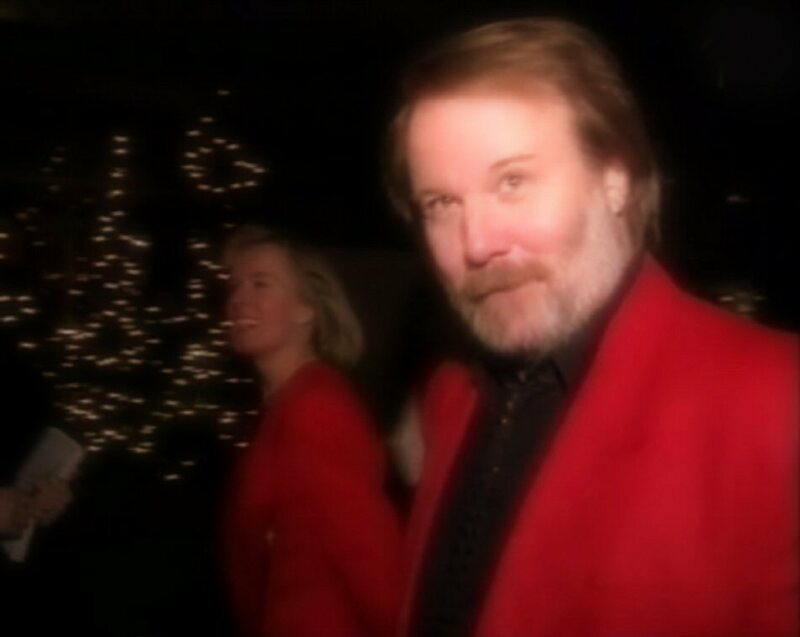 On December 16, 1996 Benny celebrated his 50th birthday with a big party. He gave a short interview for Swedish TV. 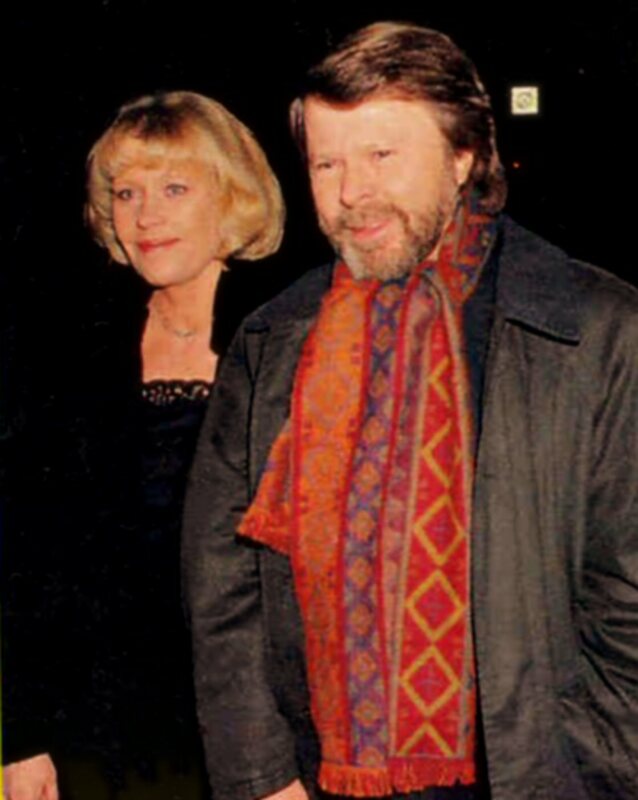 Among guests there were Agnetha Fältskog and Björn Ulvaeus with his wife Lena. 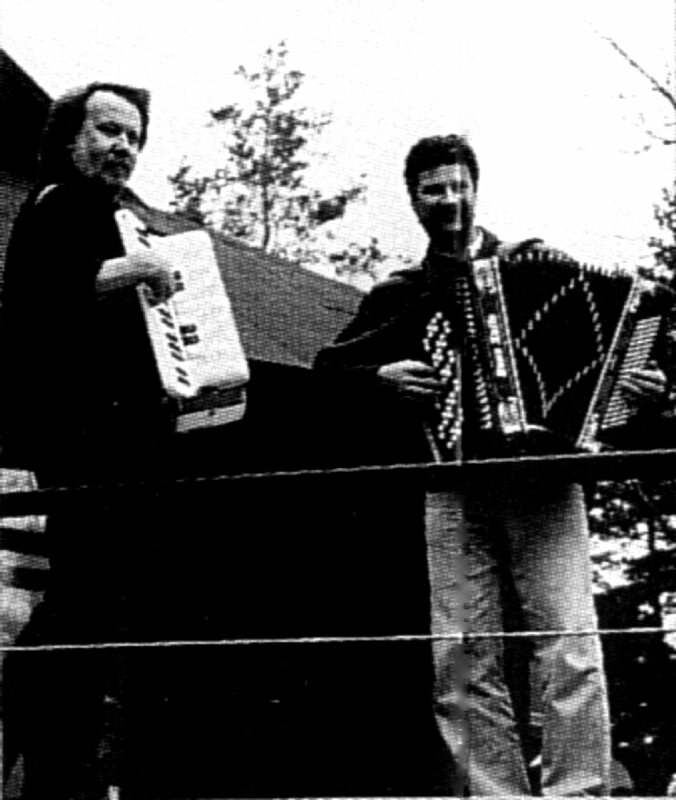 Benny and Orsa Spelmän recorded a new album in 1998. 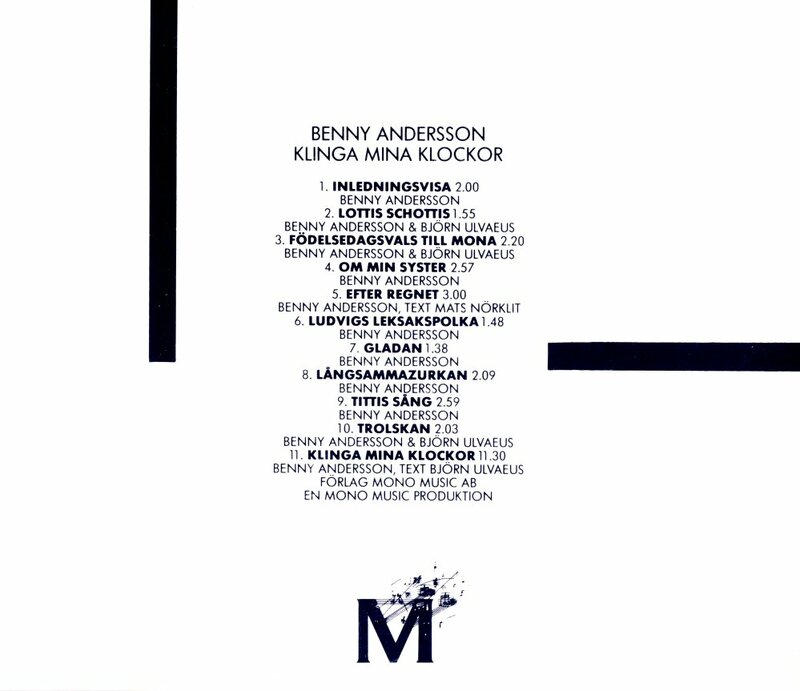 Benny was the producer and the album entitled "Ödra" contained 16 folk songs. 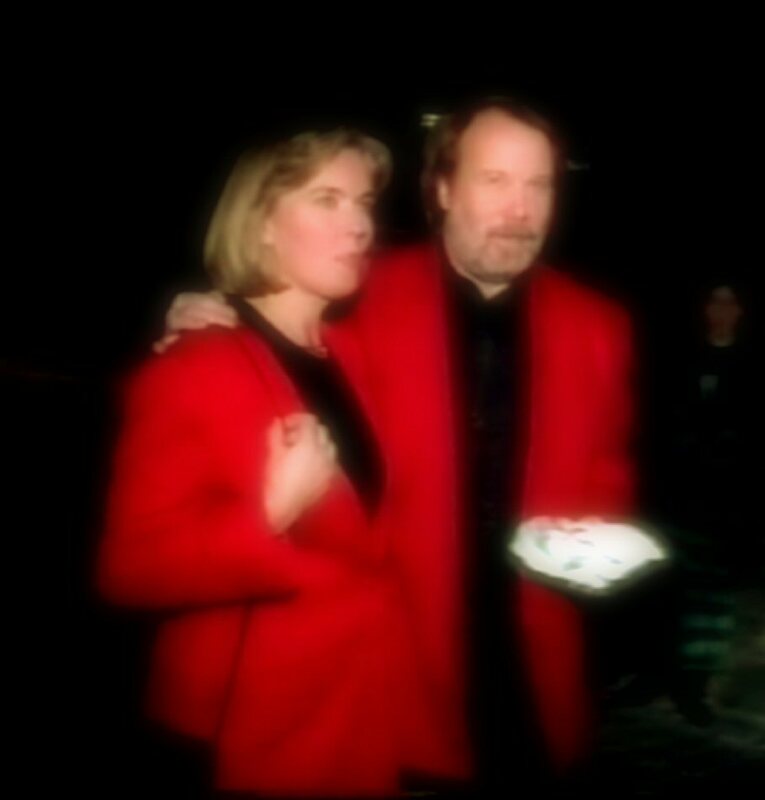 Benny & Orsa Spelmän promoted their new album on TV performing live on January 25, 1998 in SVT "Söndagsöppet". 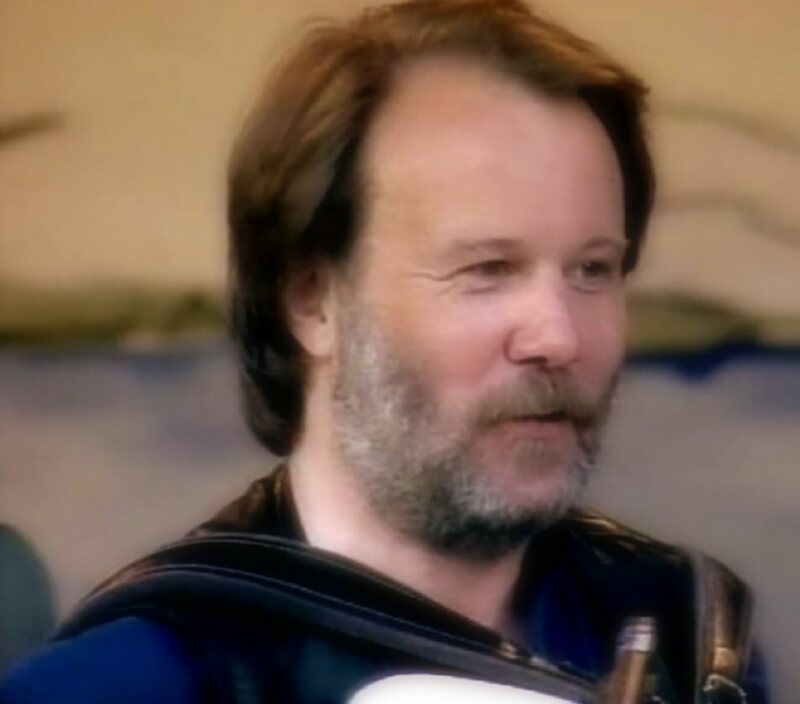 The year 1999 brought a new collaboration - this time between Benny and a Swedish folk group Triakel. 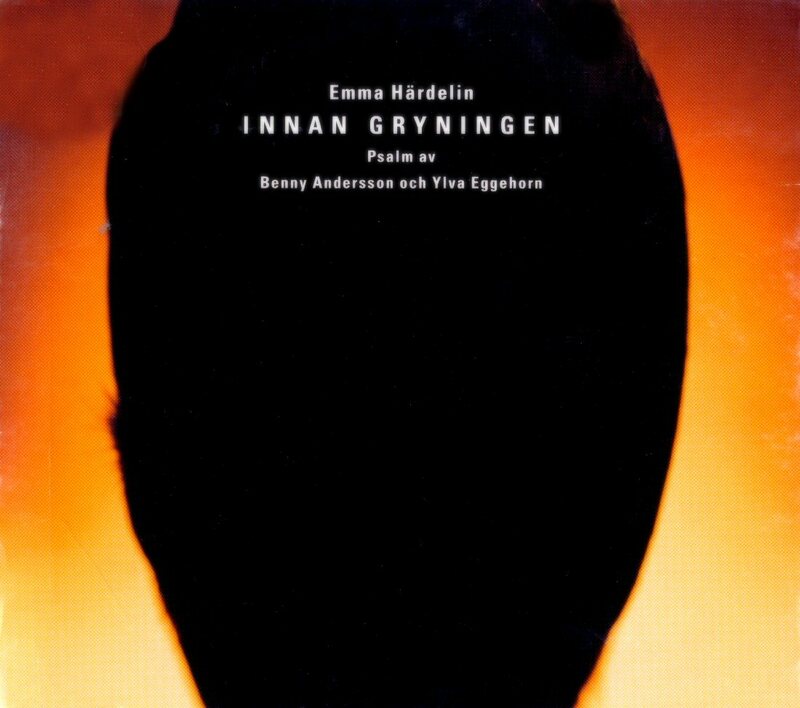 Benny had composed music to a psalm written by Ylva Eggehorn. 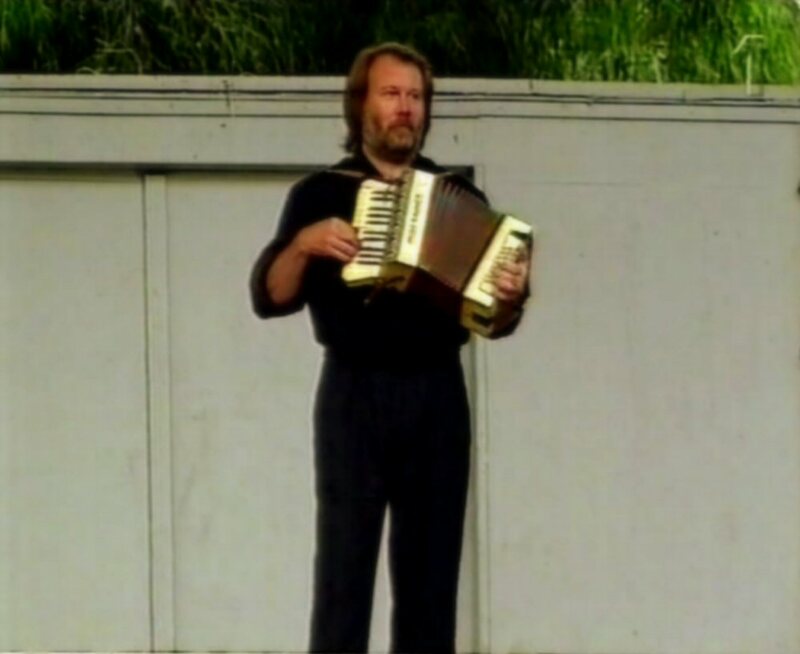 The psalm entitled "Innan gryningen" (Before dawn) was performed by Triakel feat. 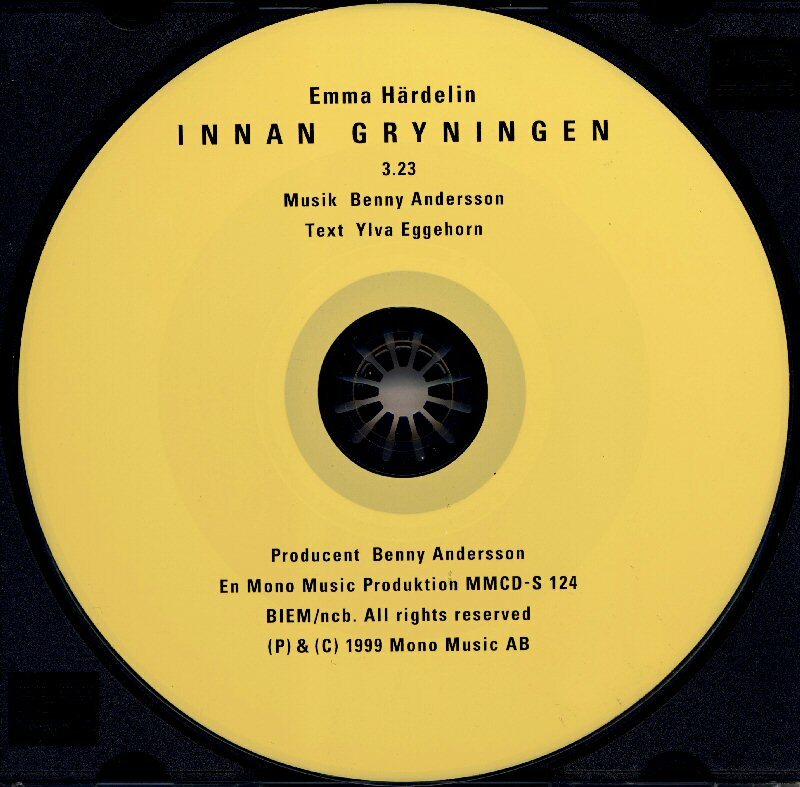 Emma Härdelin and recording sessions took place in September 1999. 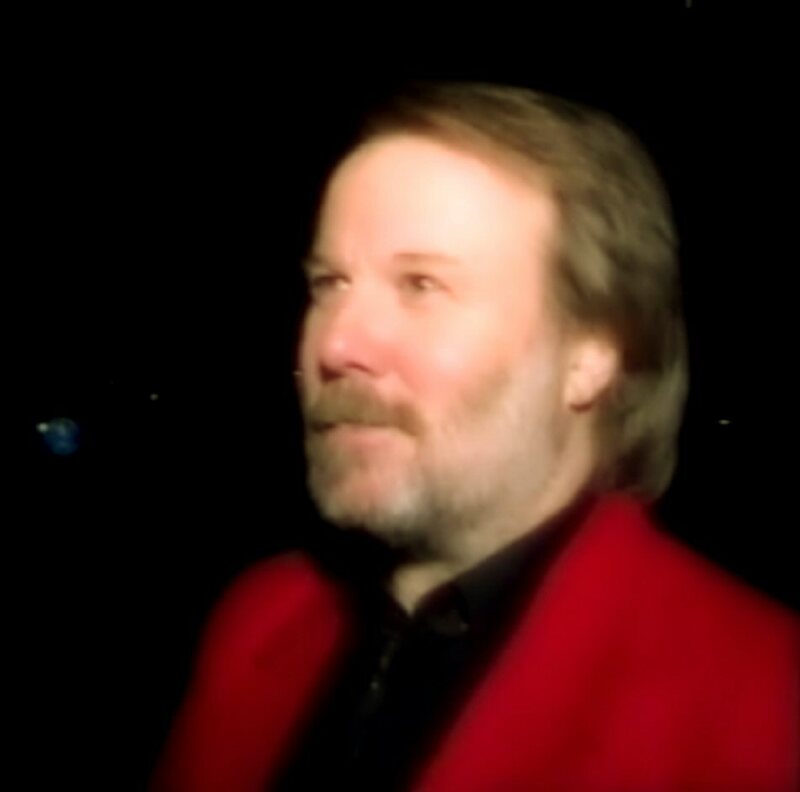 The single was produced by Benny and released by his record company Mono Music. 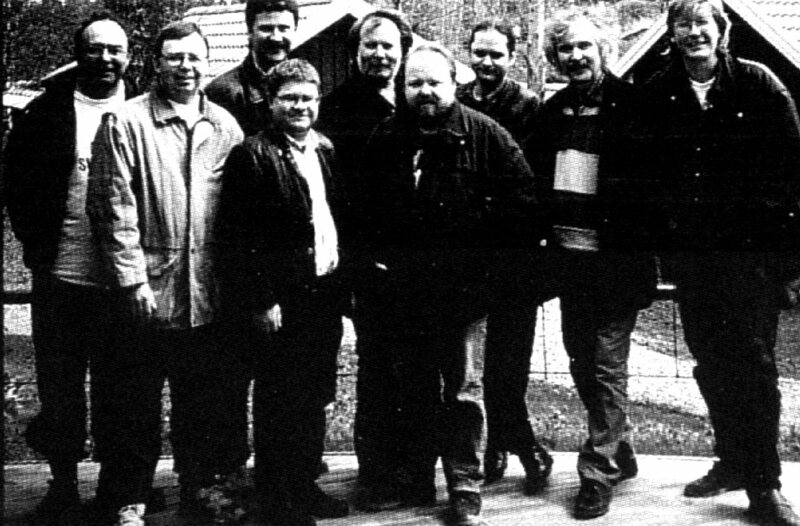 The composition was even released on Triakel's CD "Vinter visor" in November 2000. 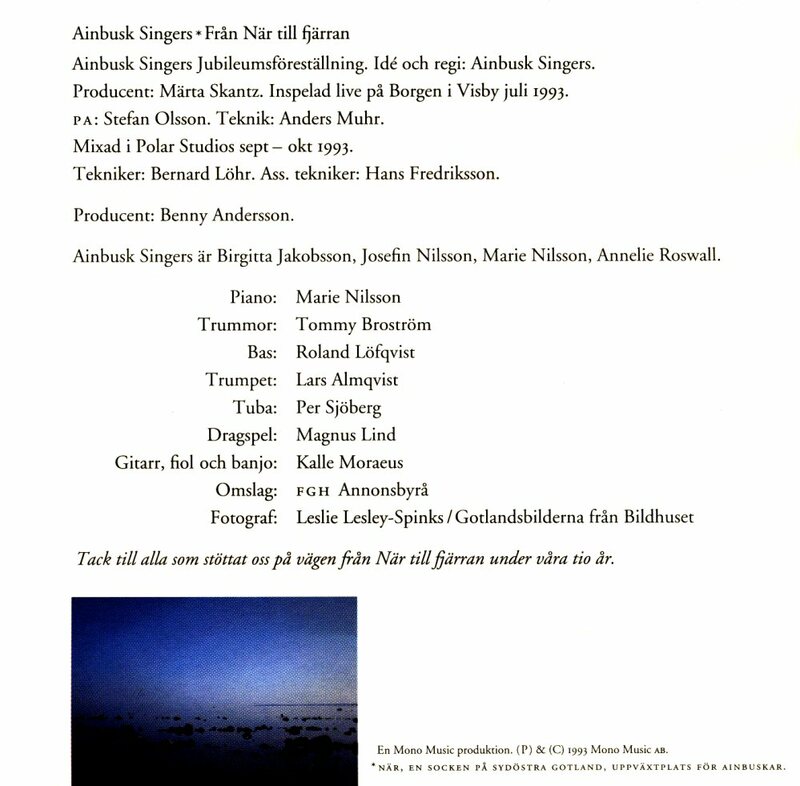 In 2000 Benny wrote music for the Swedish movie "Sånger från andra våningen".